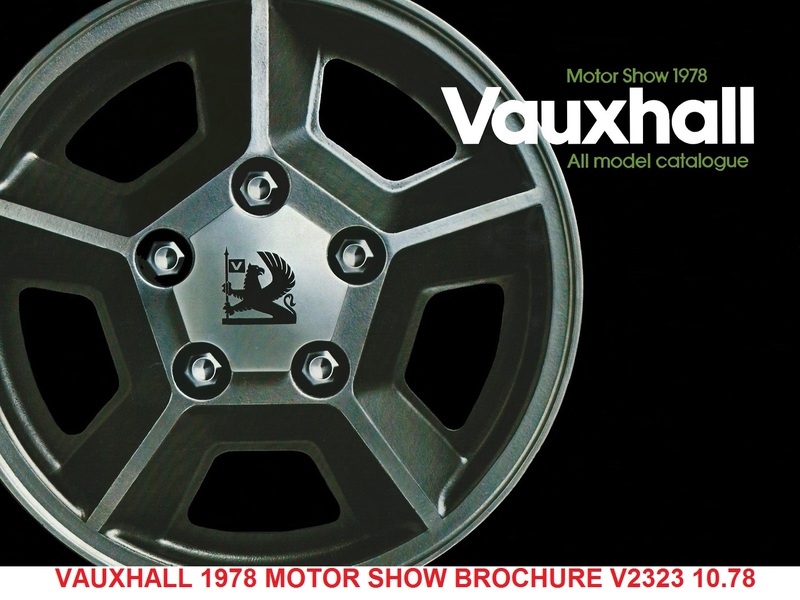 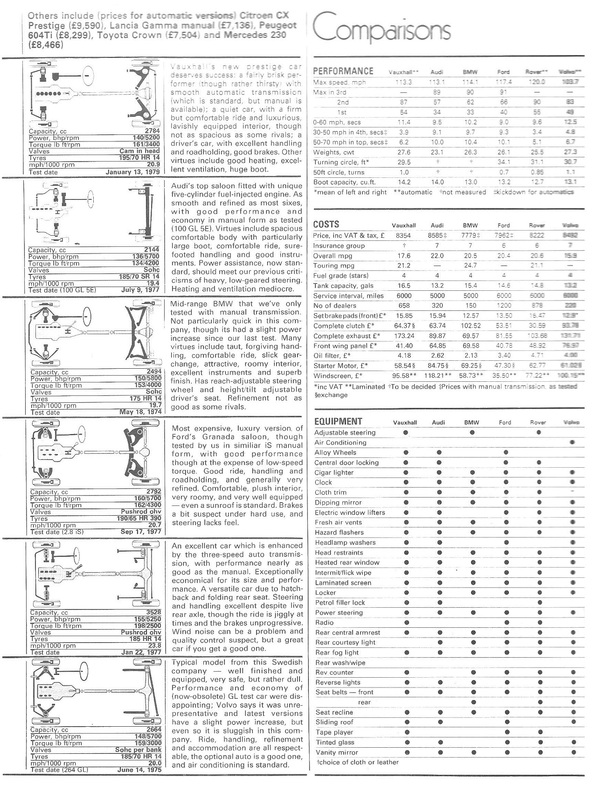 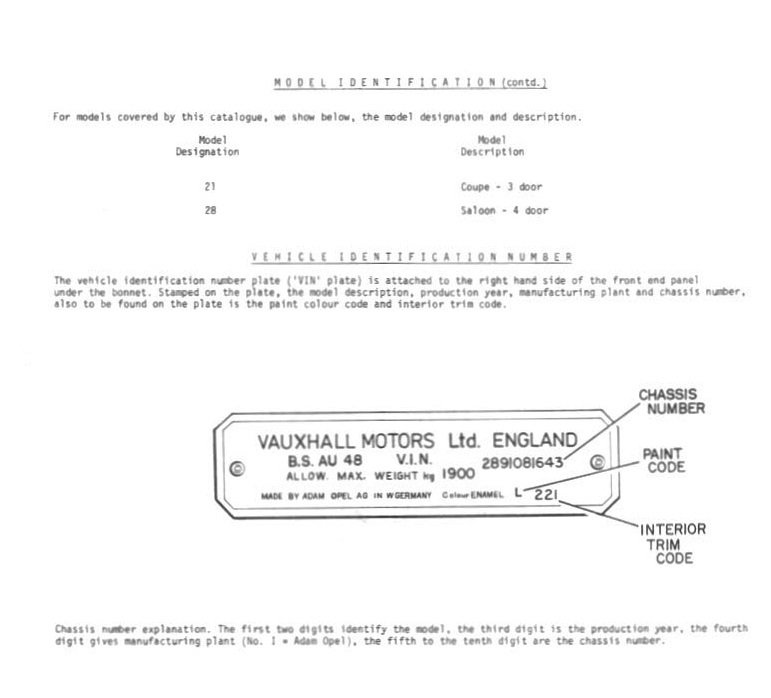 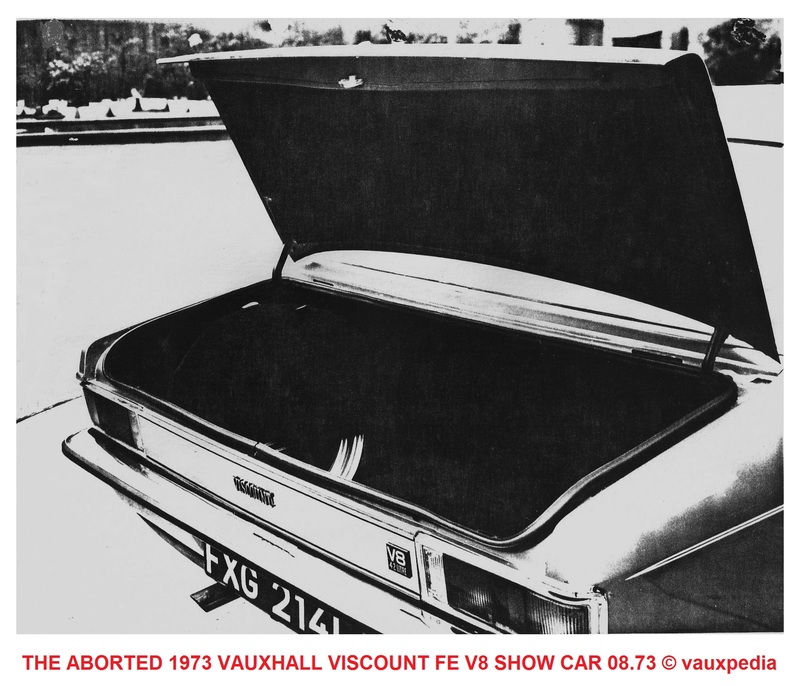 Within Vauxhall the FE range, based on the GM V72 Car Platform, had been introduced in February 1972 and was planned to be a “mid-range” model slotting under a proposed larger PD Cresta & Viscount model range. 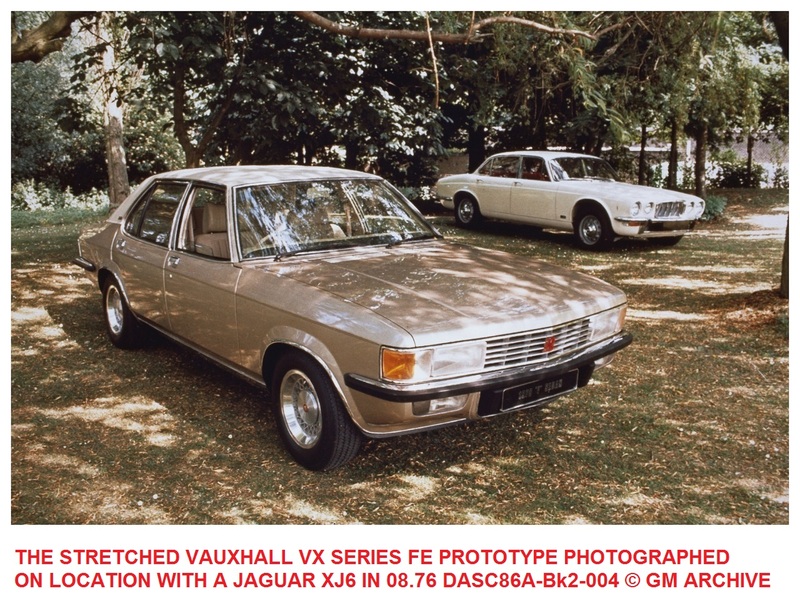 As we now know the PD project was cancelled and was done so after development of the FE was well under way and ended up with only a six month overlap after the cars launch with the PC Cresta & Viscount models which were withdrawn in August 1972, long after their respective sell by dates. 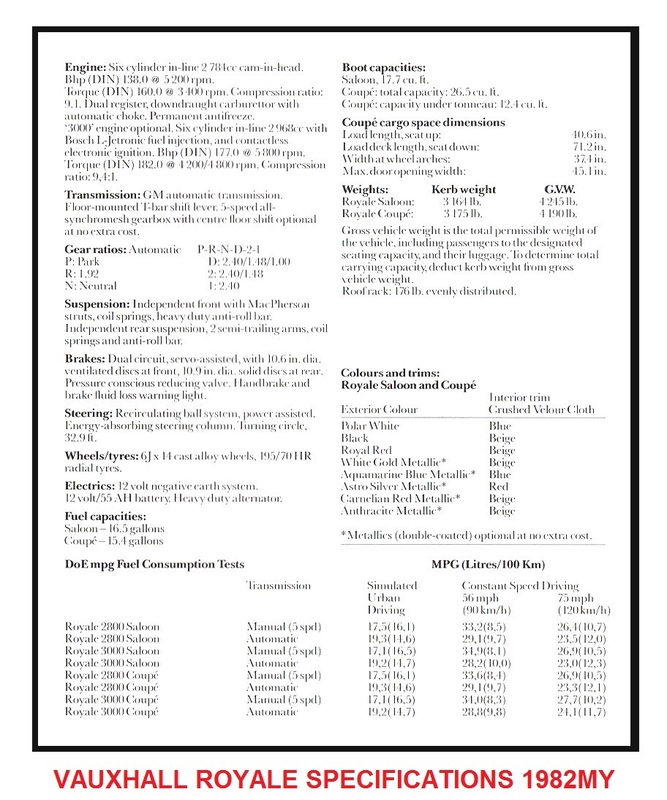 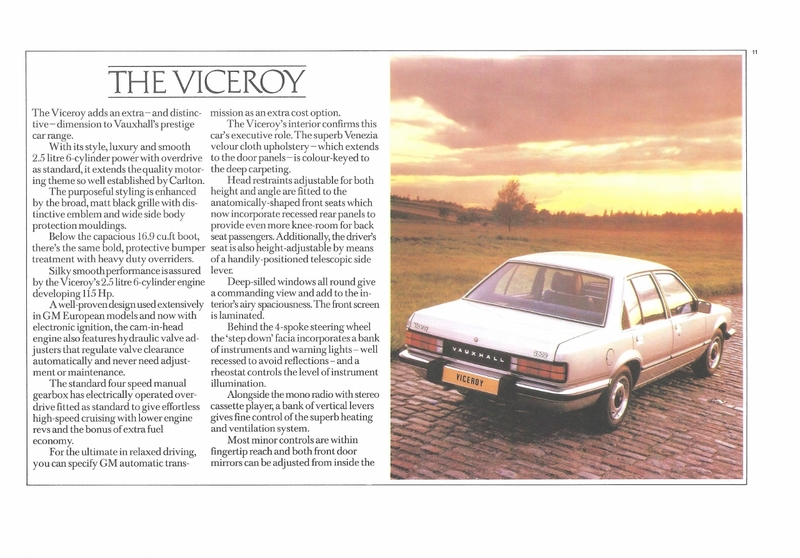 Unfortunately, at least initially, the FE Victor / VX4/90 & Ventora were not particularly competitive. 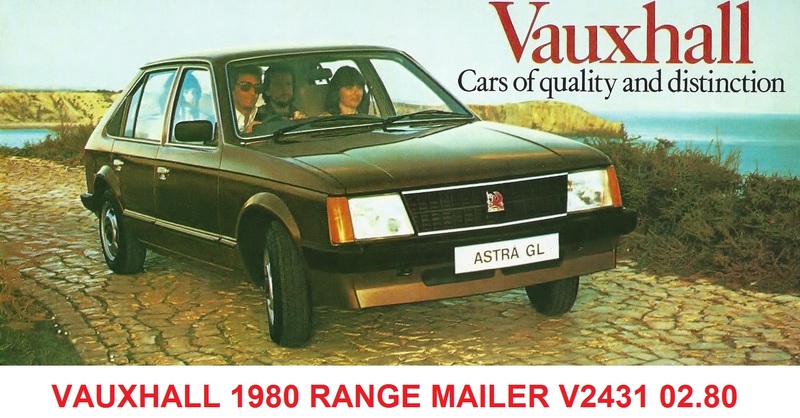 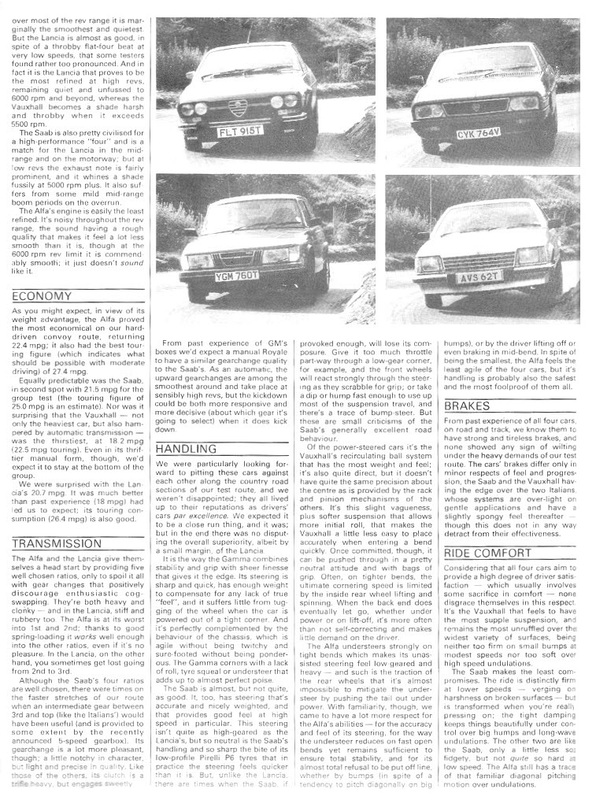 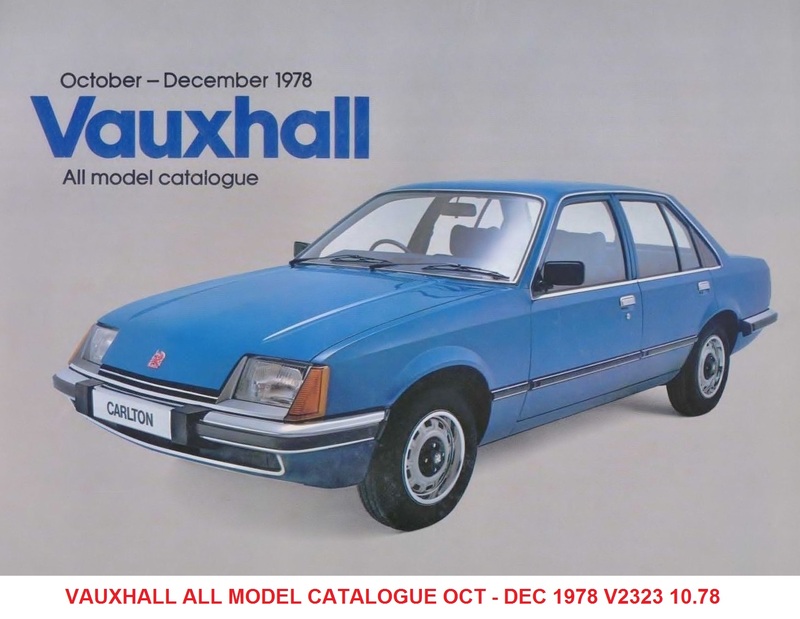 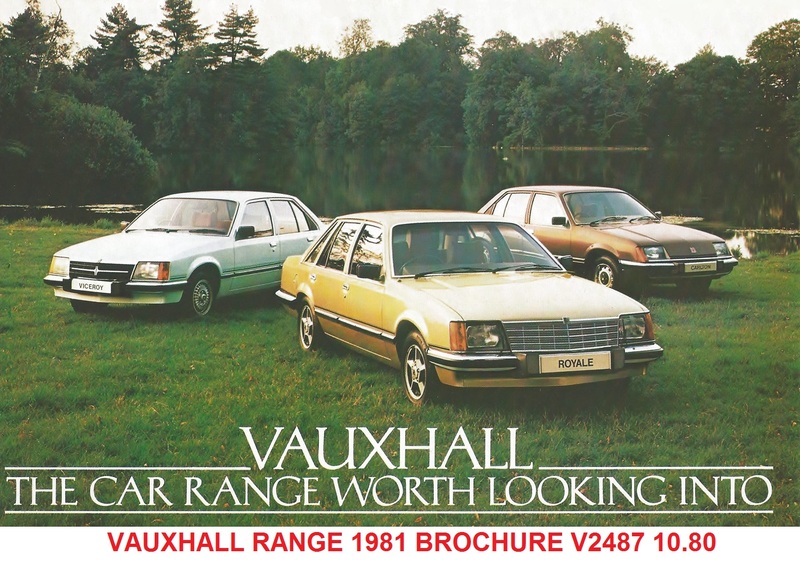 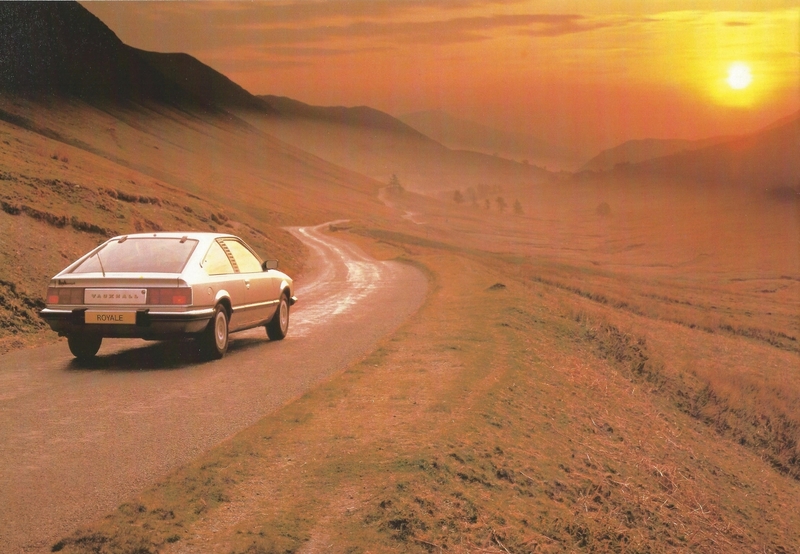 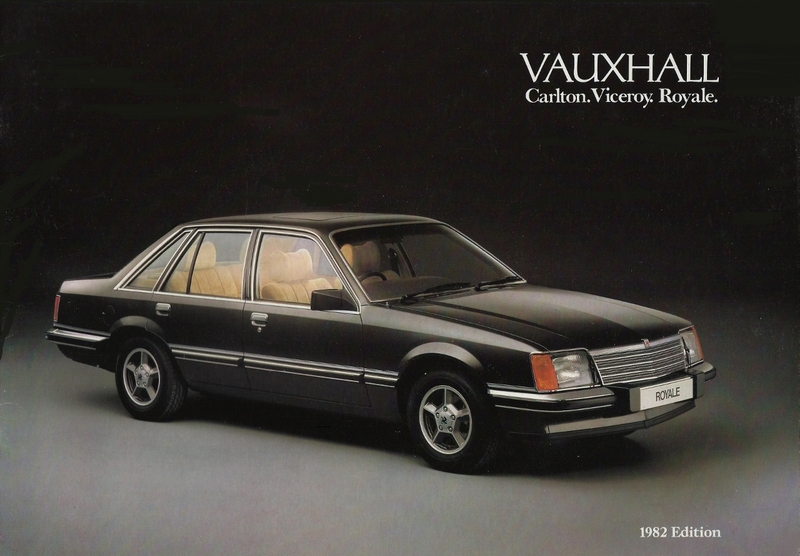 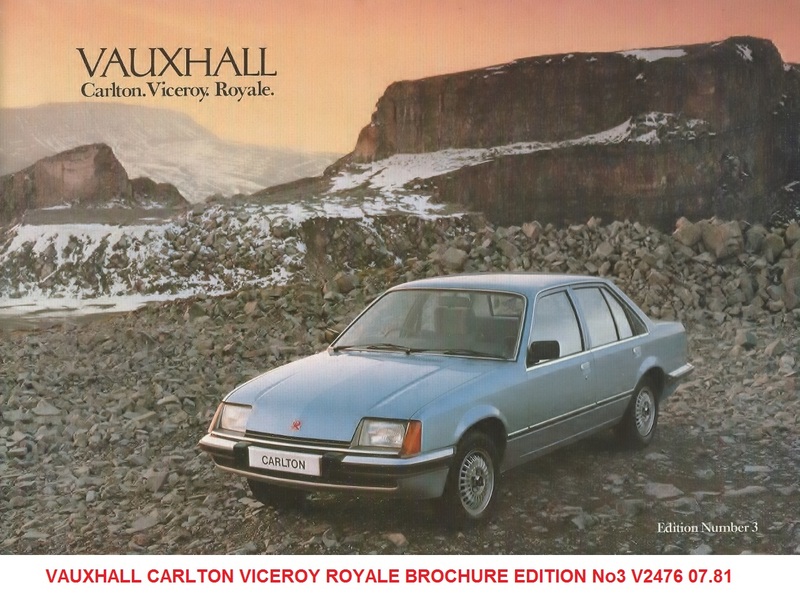 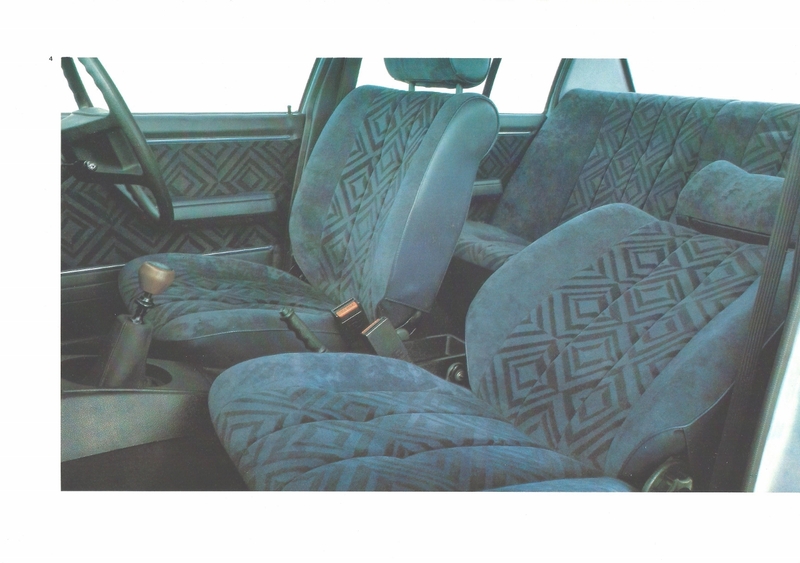 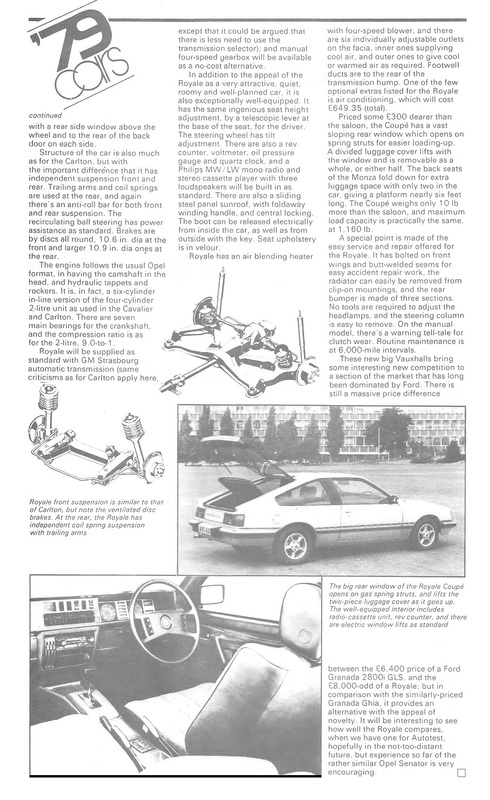 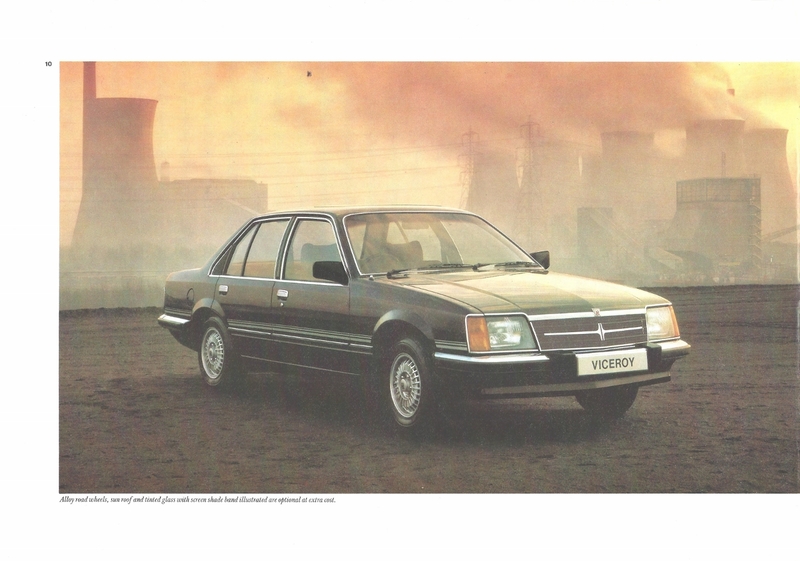 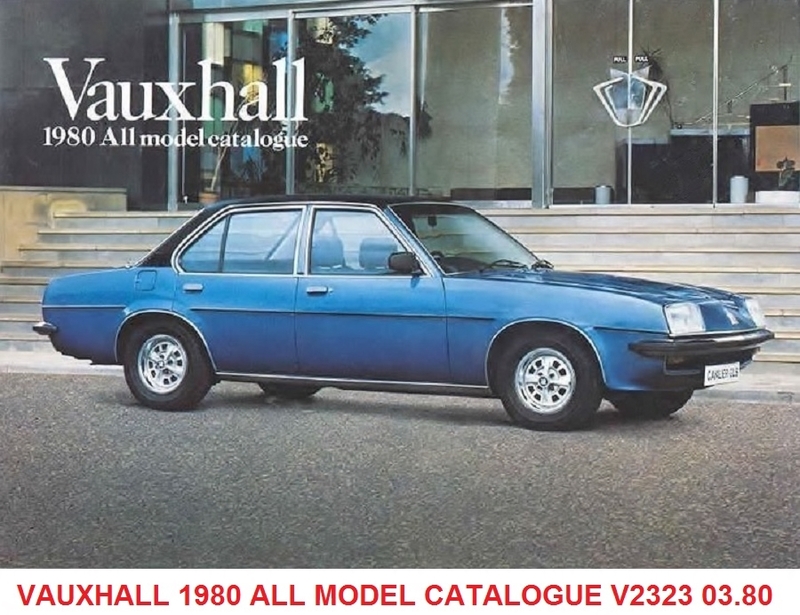 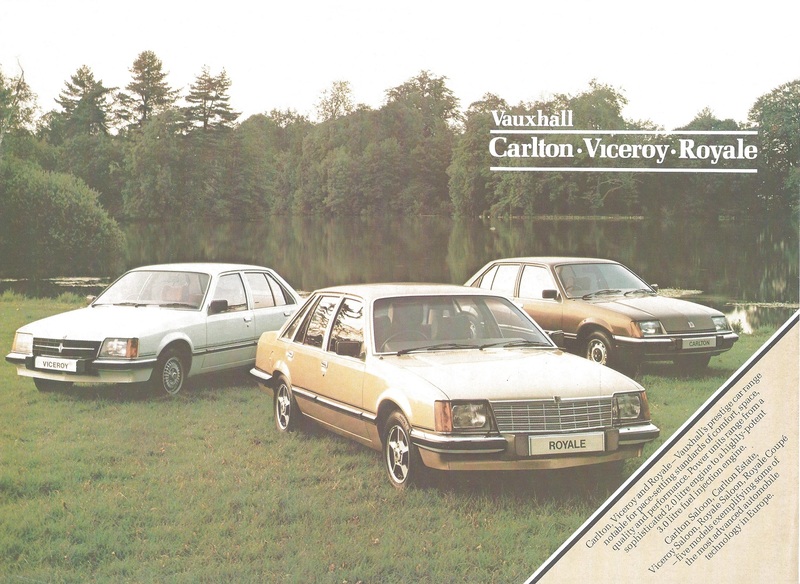 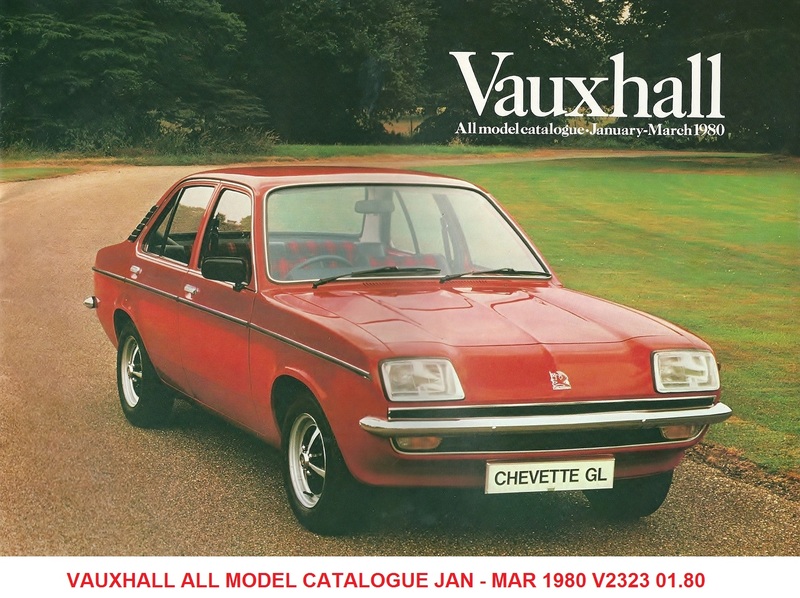 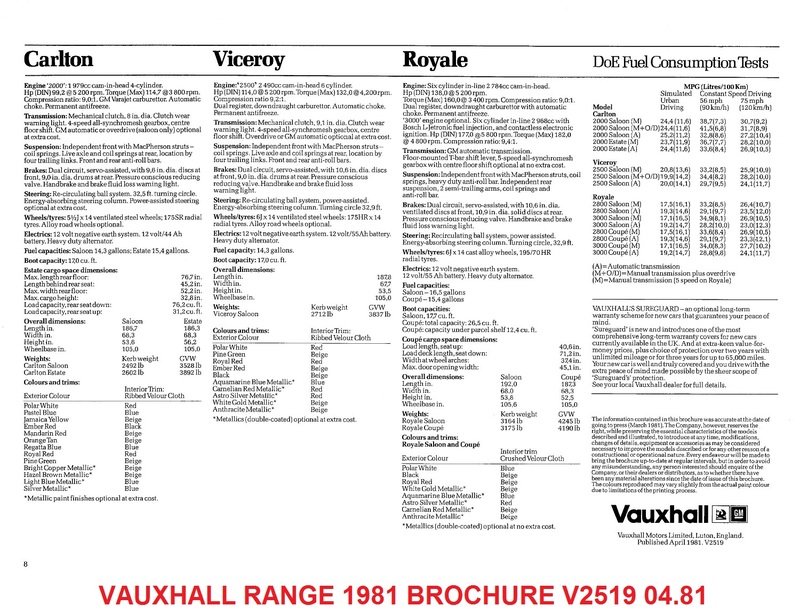 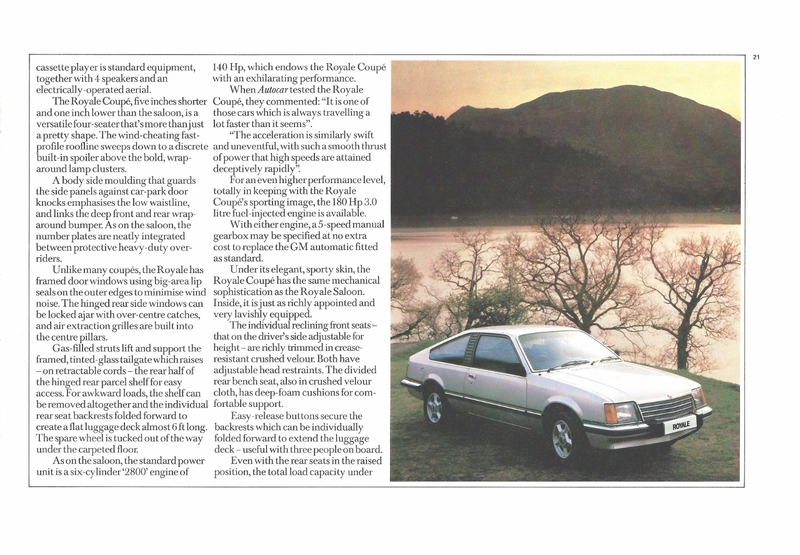 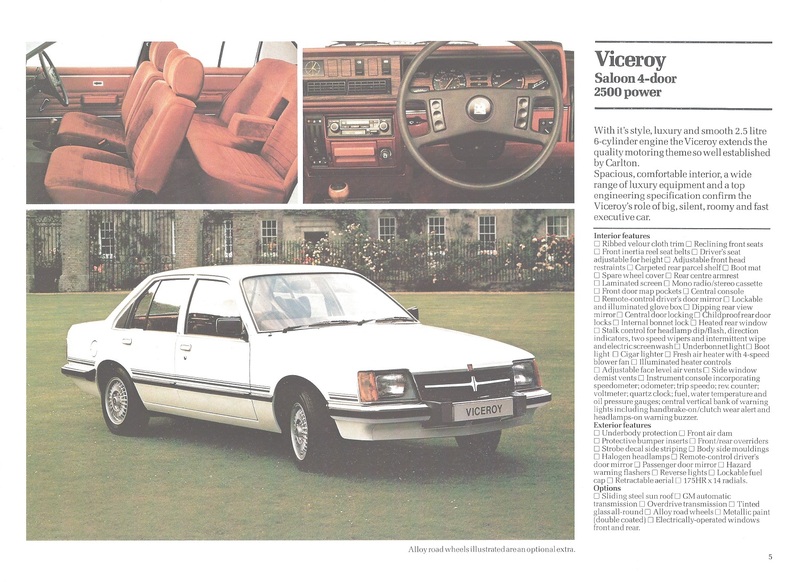 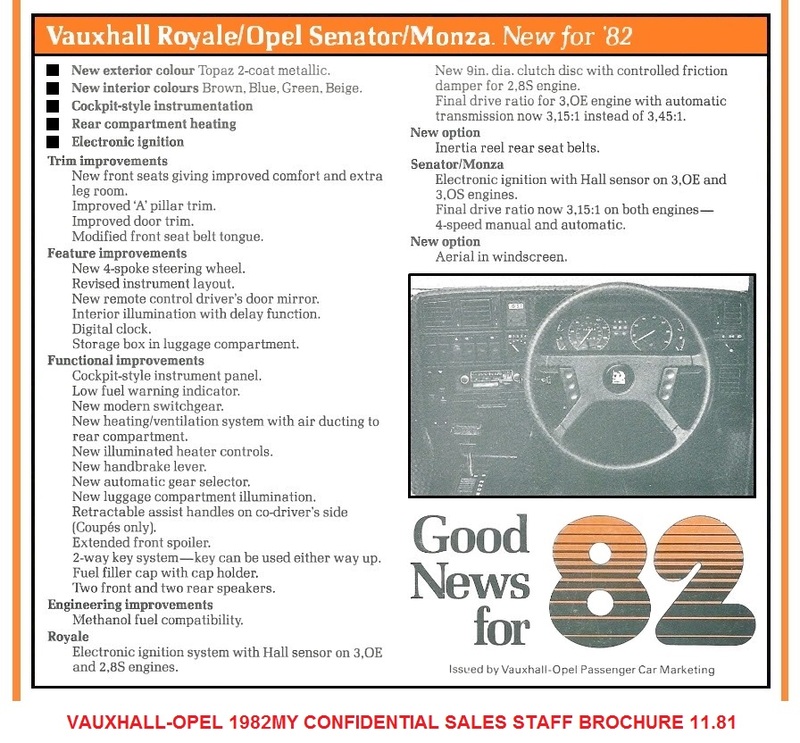 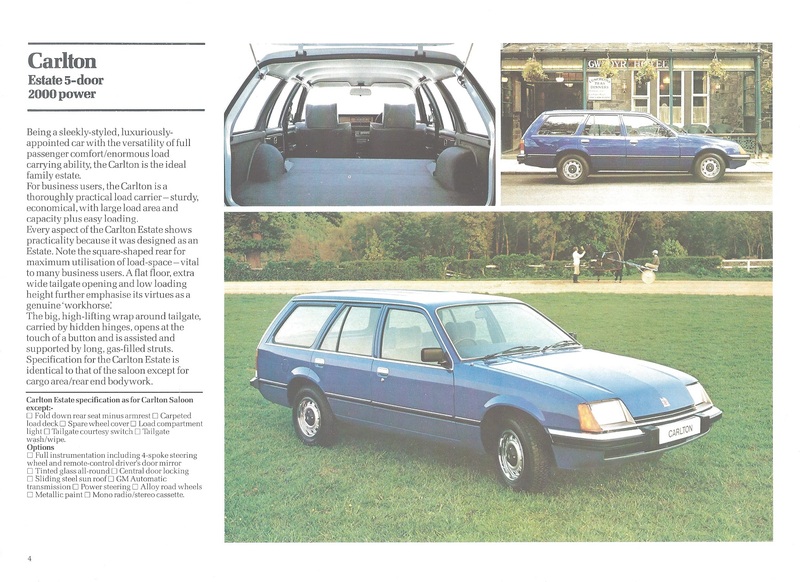 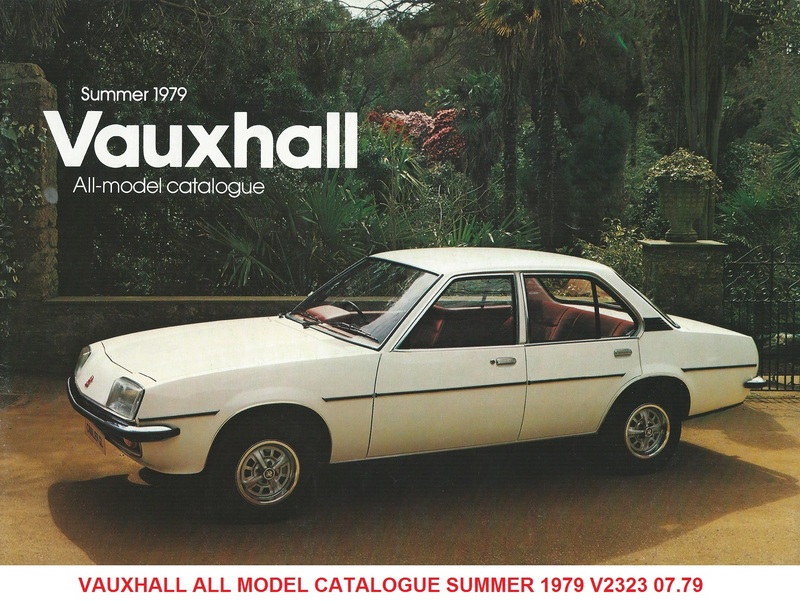 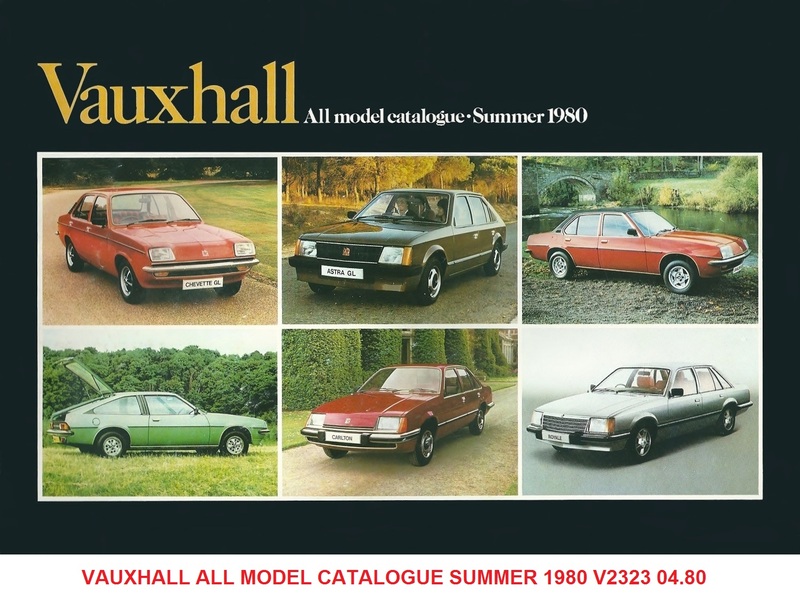 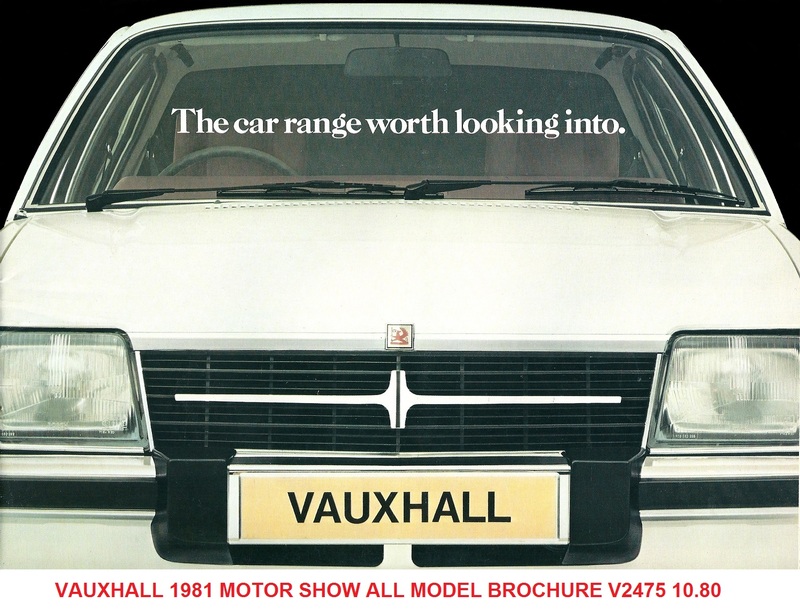 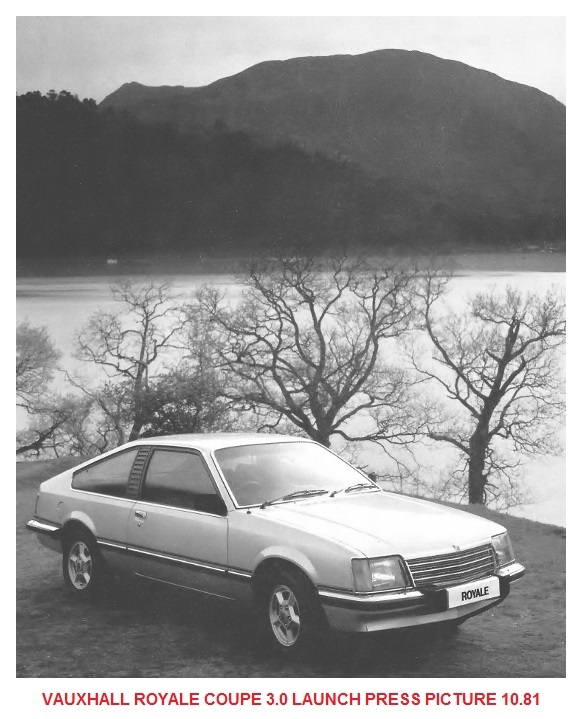 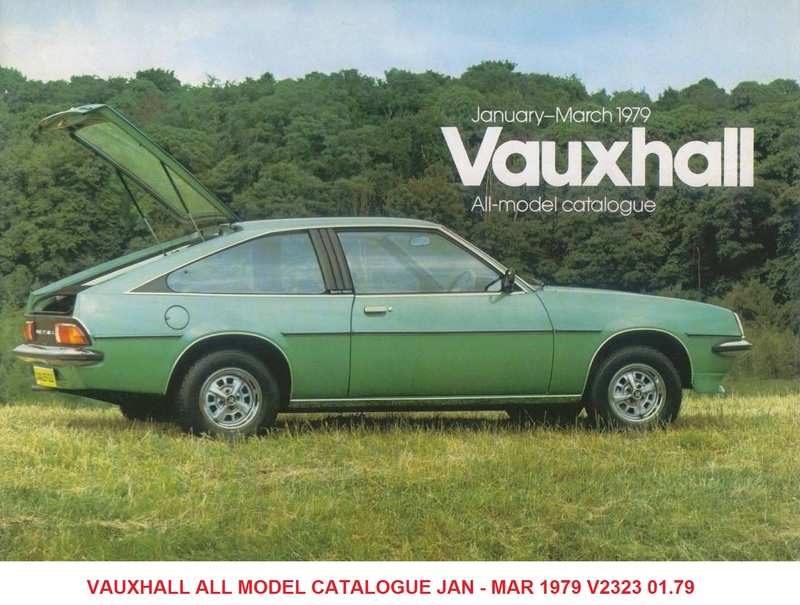 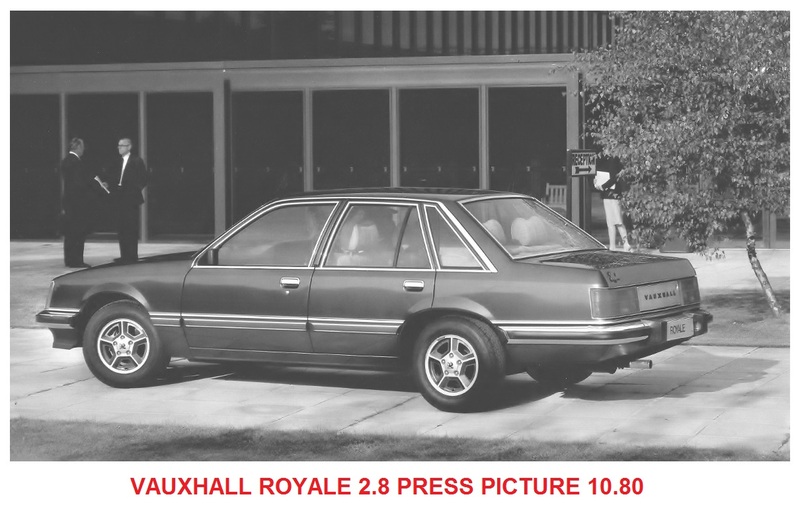 The car was gradually improved, particularly with the VX Series, although after 1976 when the Ventora was phased out Vauxhall no longer had a six cylinder car in their range for the first time since the 1920s. 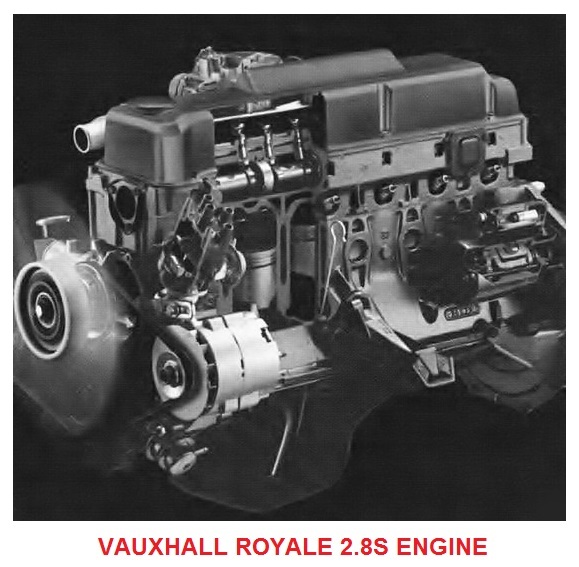 The problem of the lack of a true prestige top model was not lost or ignored by Vauxhall, there were many concepts such as the FE Viscount V8, killed by the fuel crisis, the Ventora SS V8 Concept proposed during the development of the FE range and the most serious proposal of all - the 2.5litre six cylinder stretched FE VX Series built by Panther. 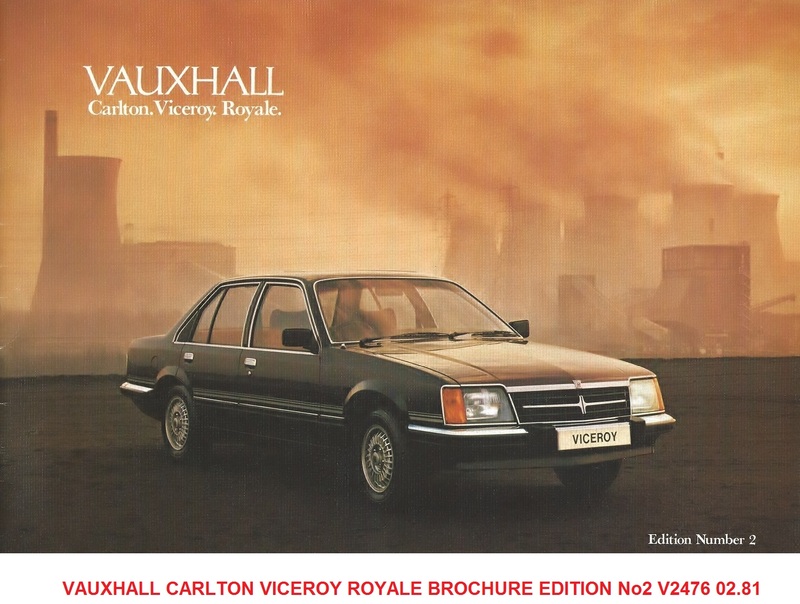 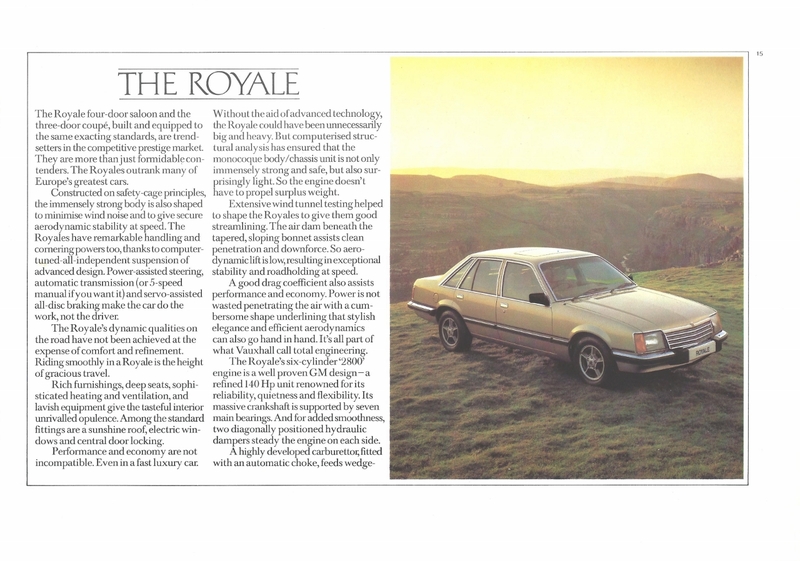 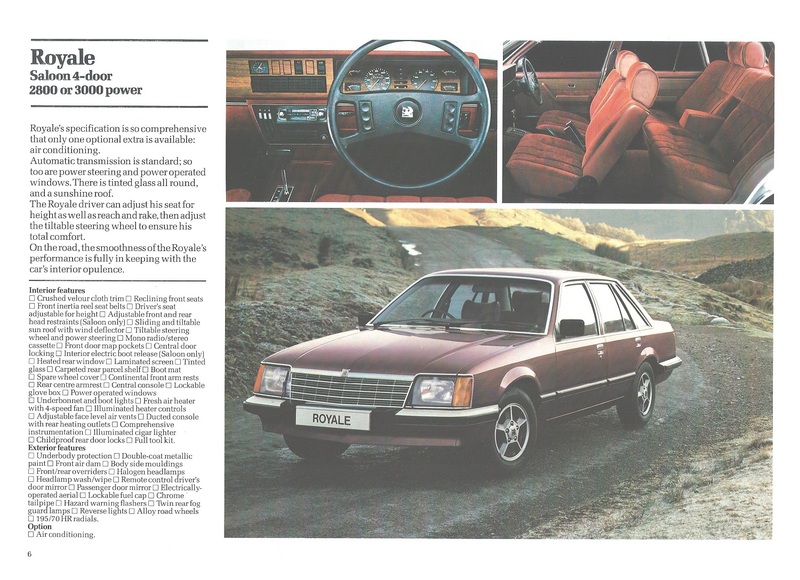 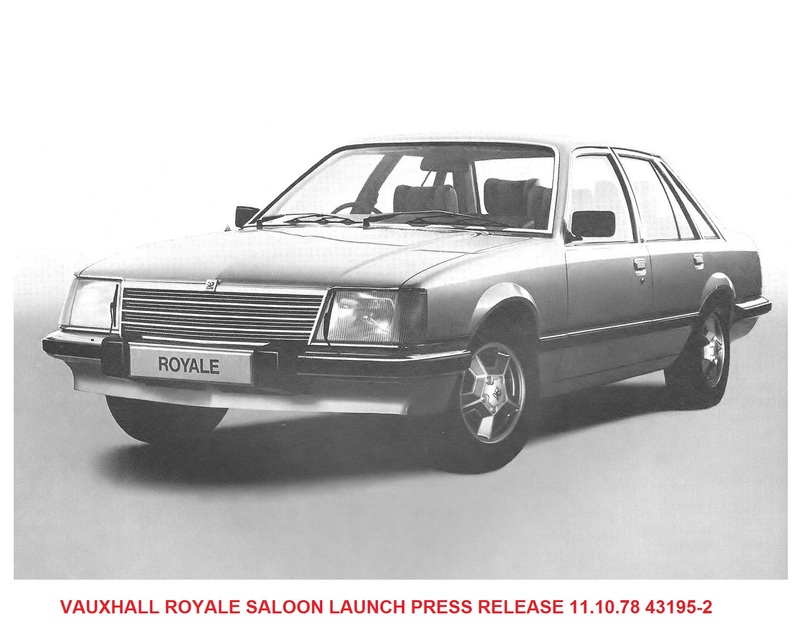 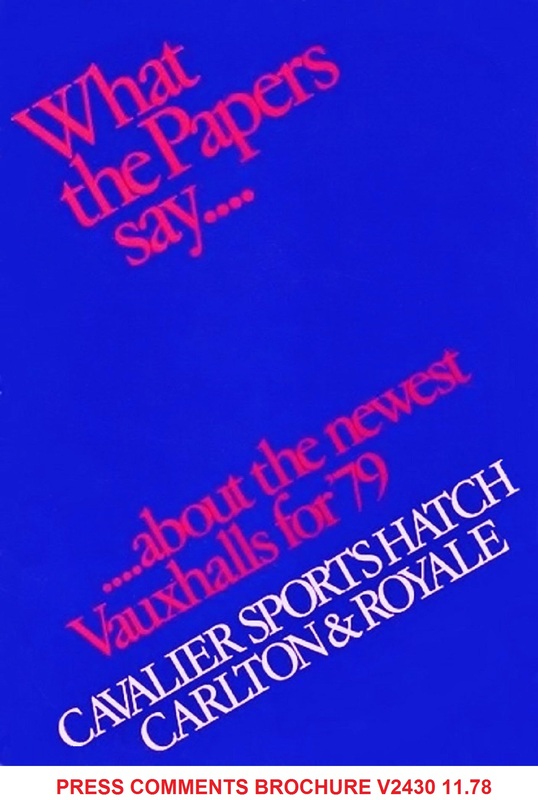 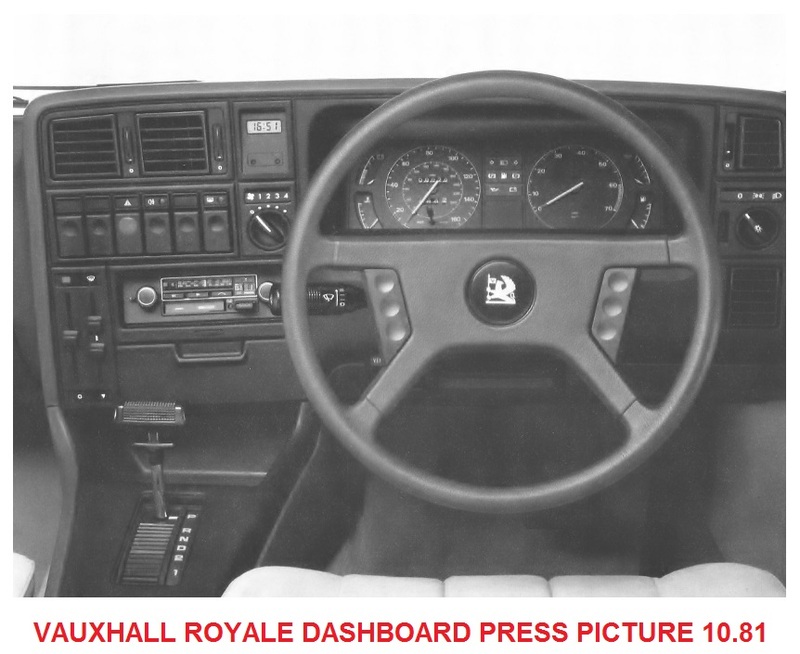 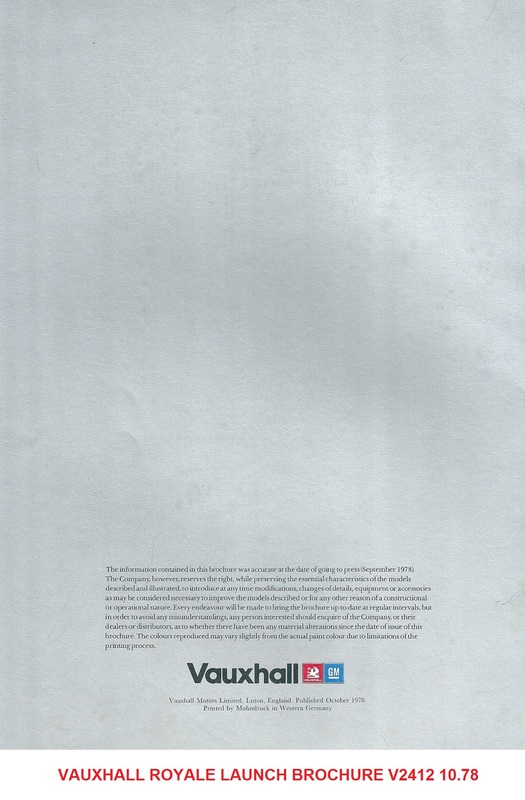 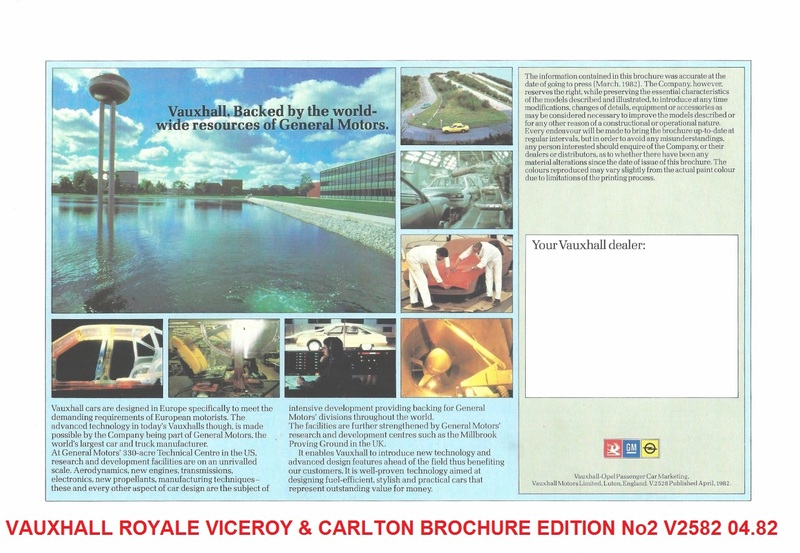 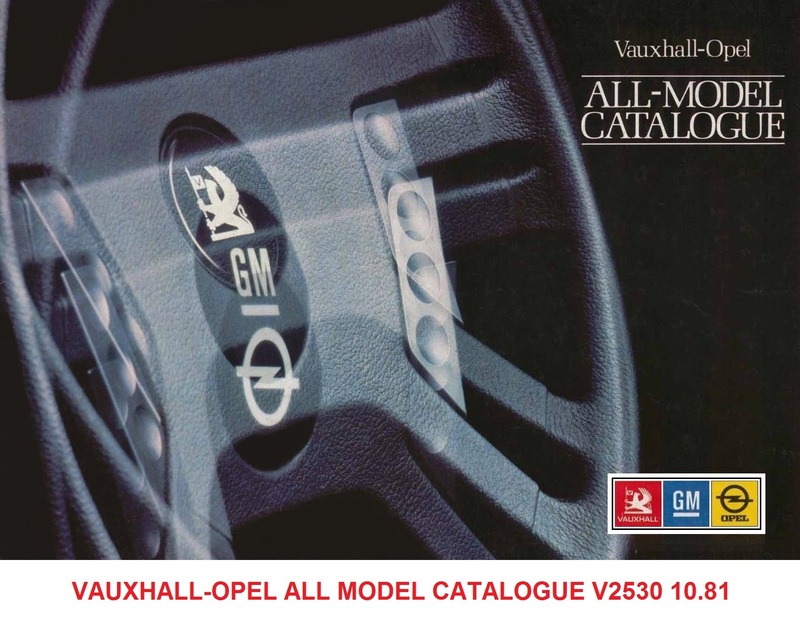 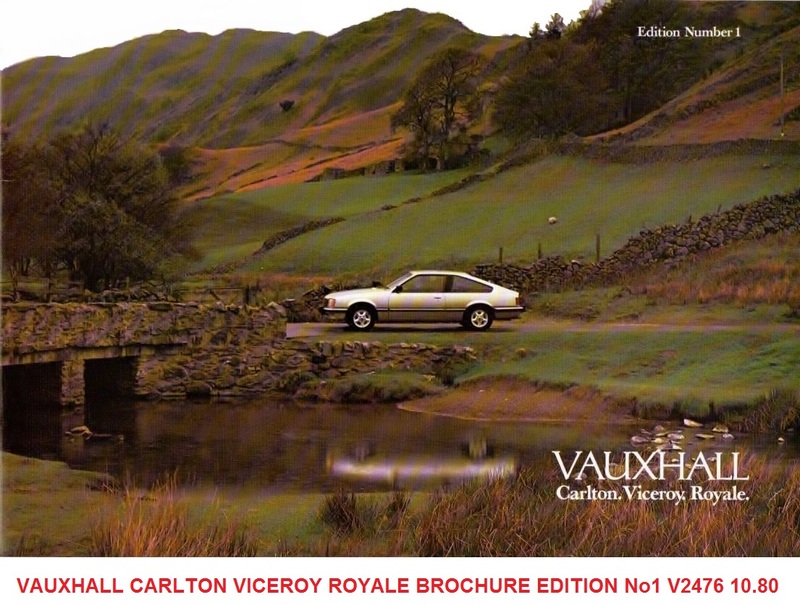 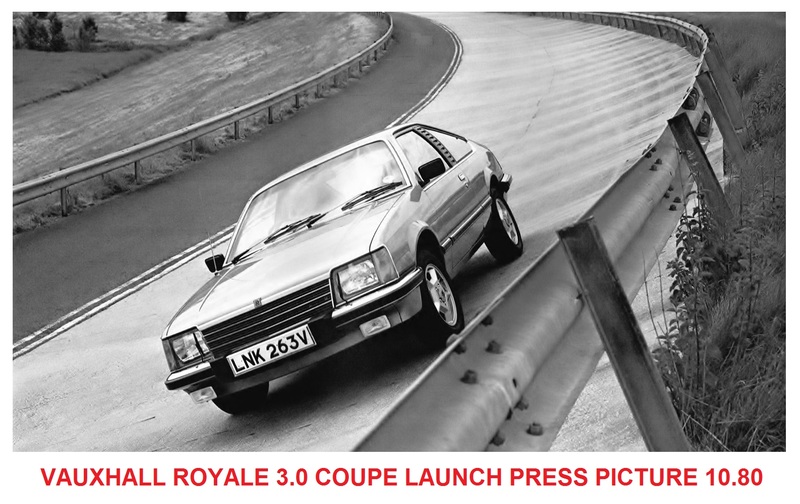 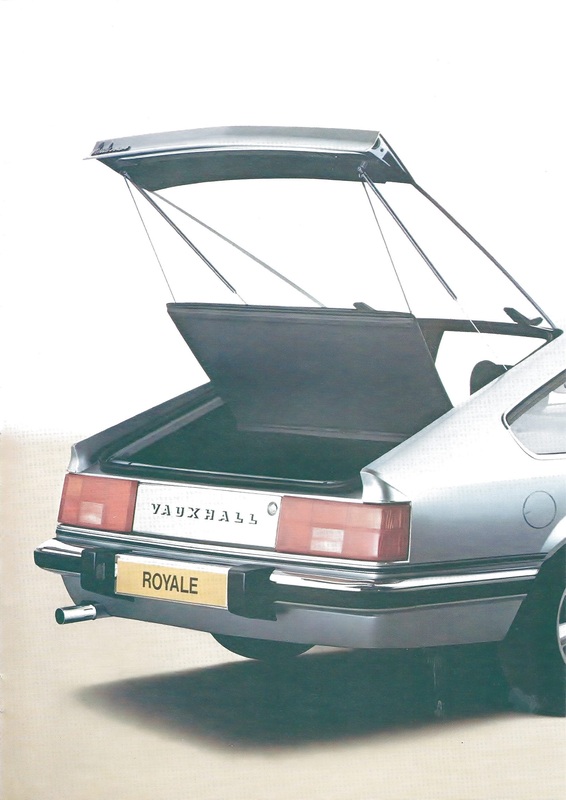 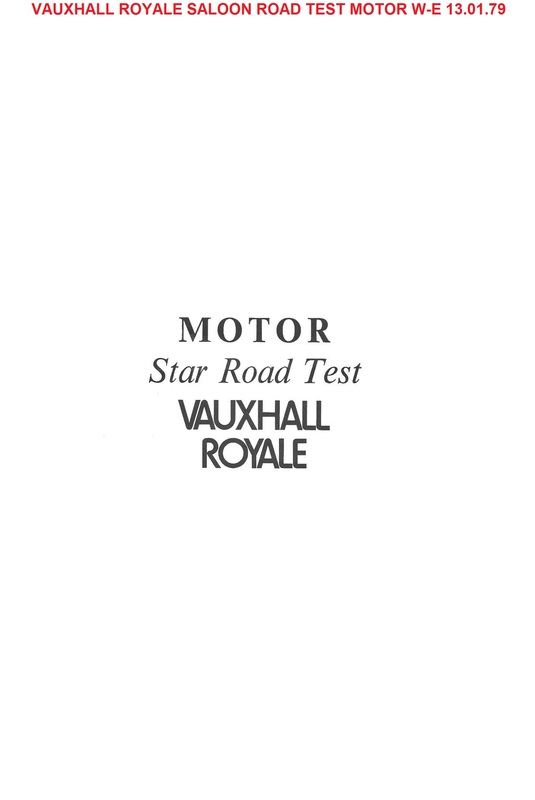 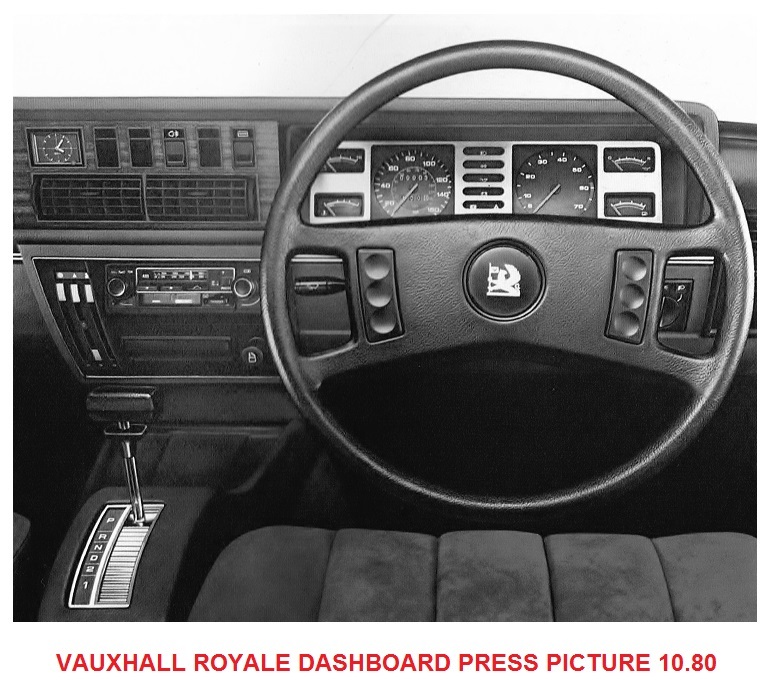 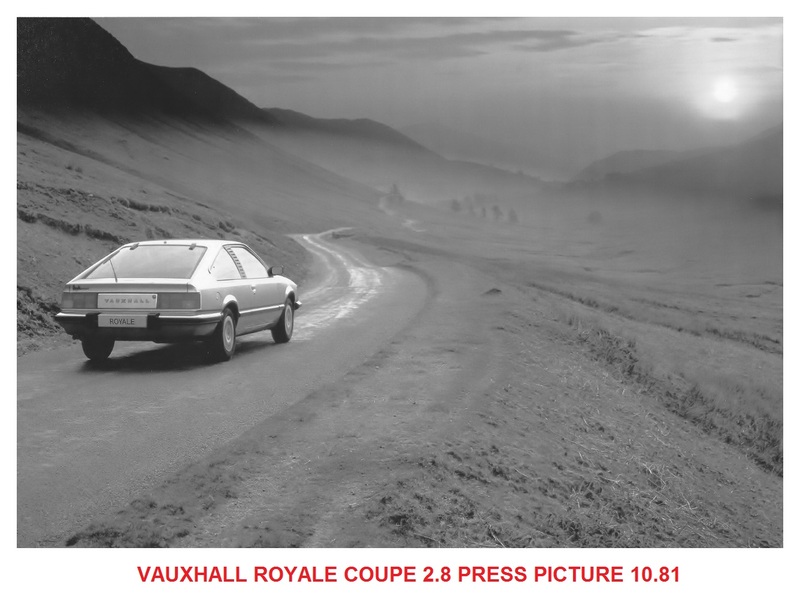 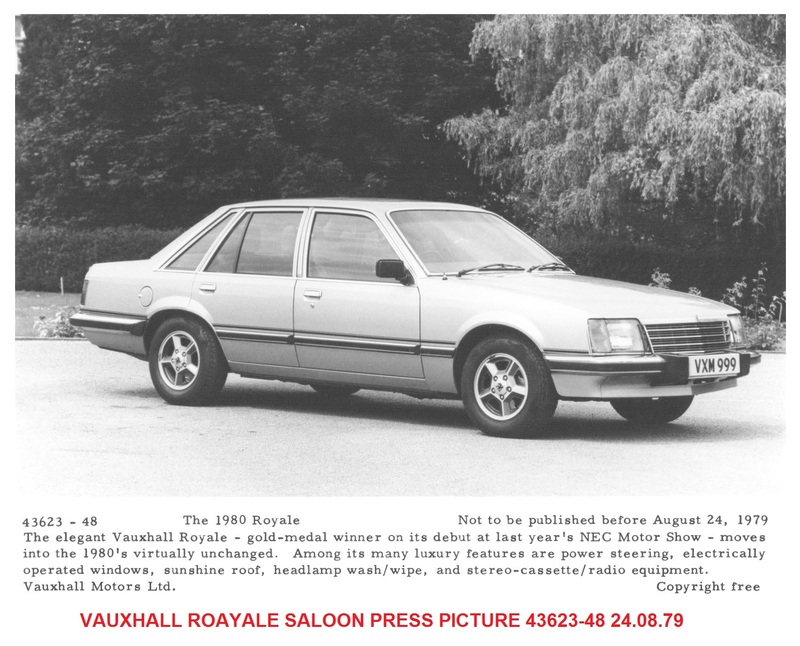 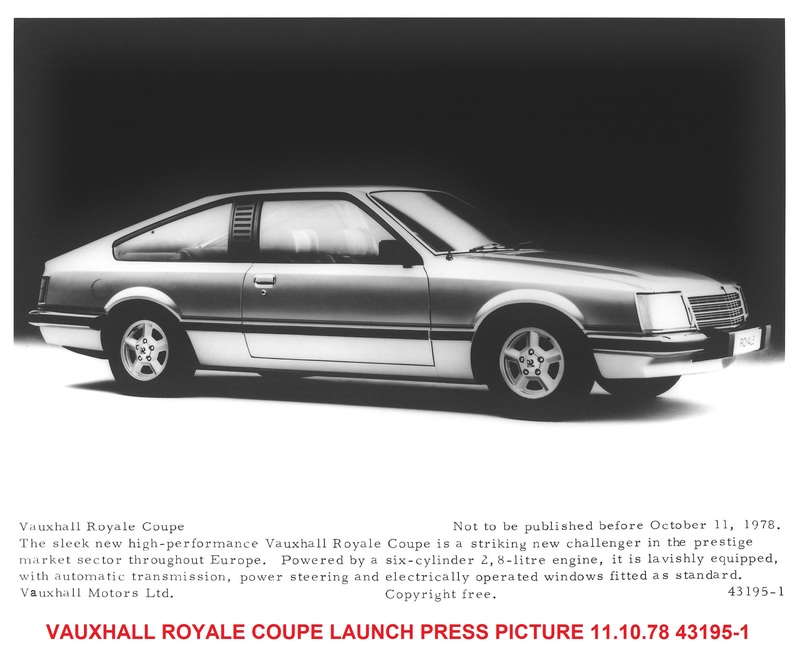 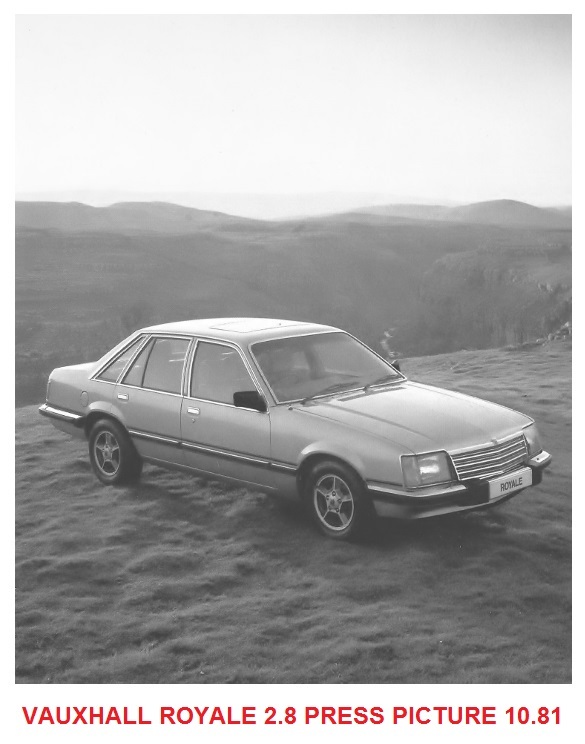 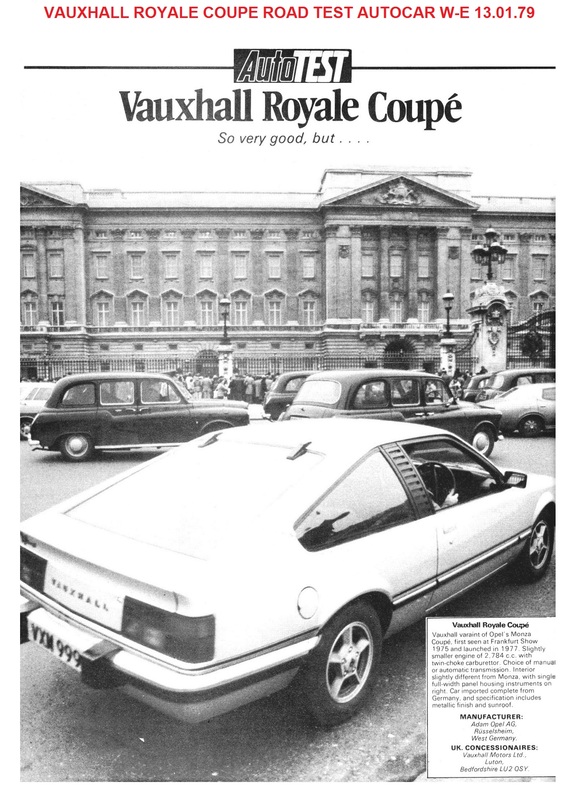 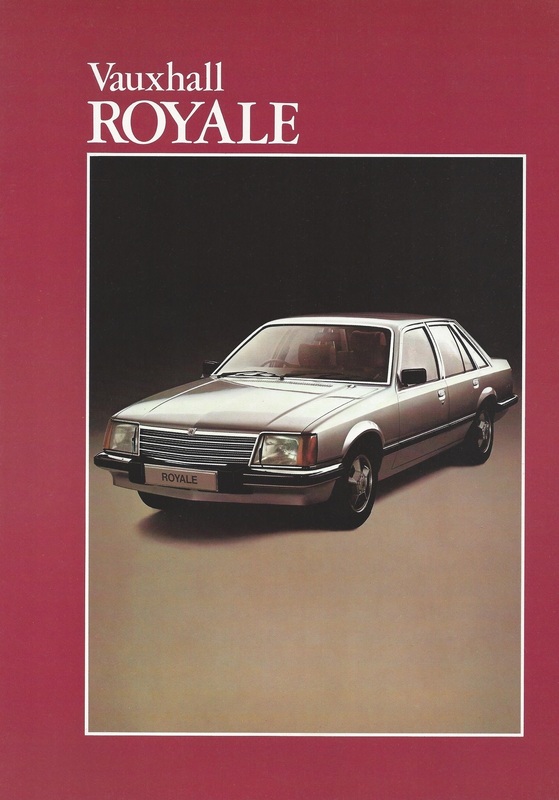 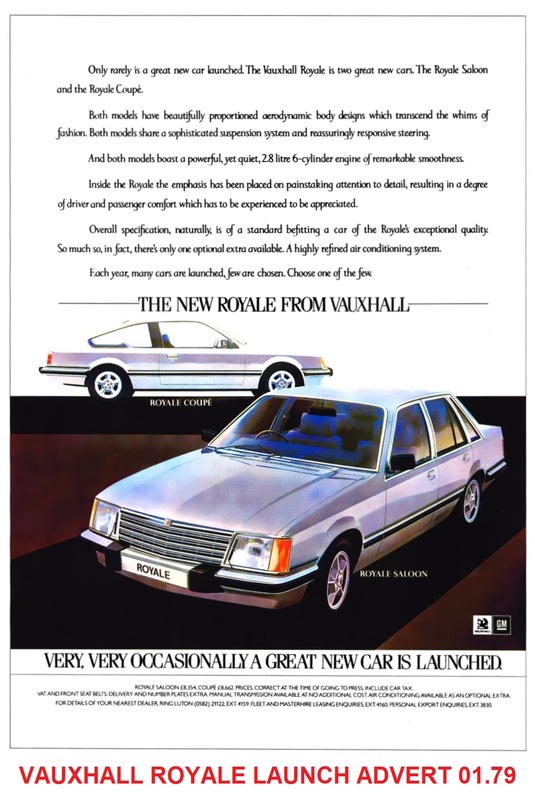 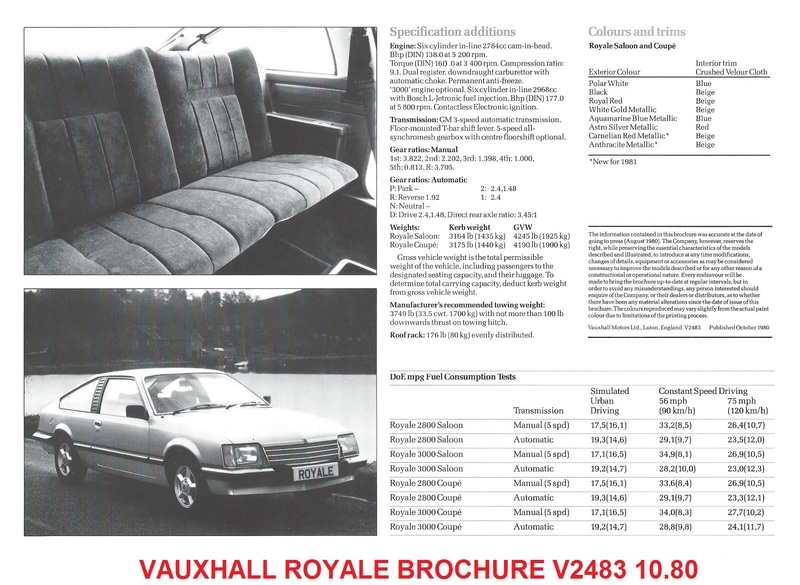 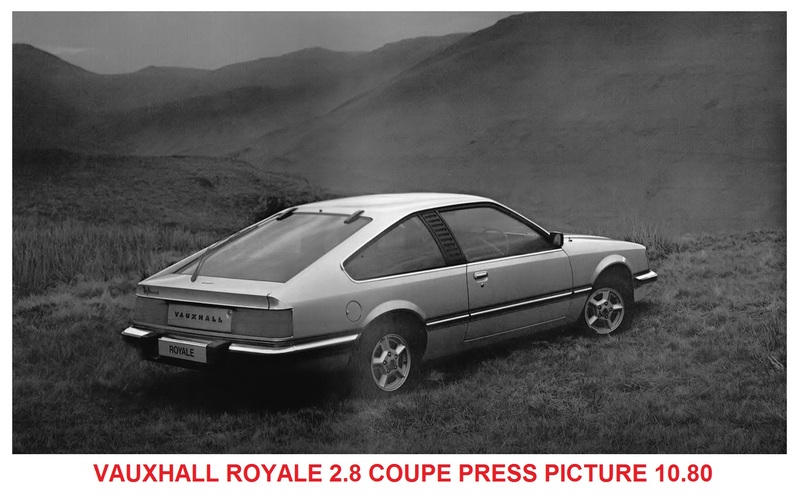 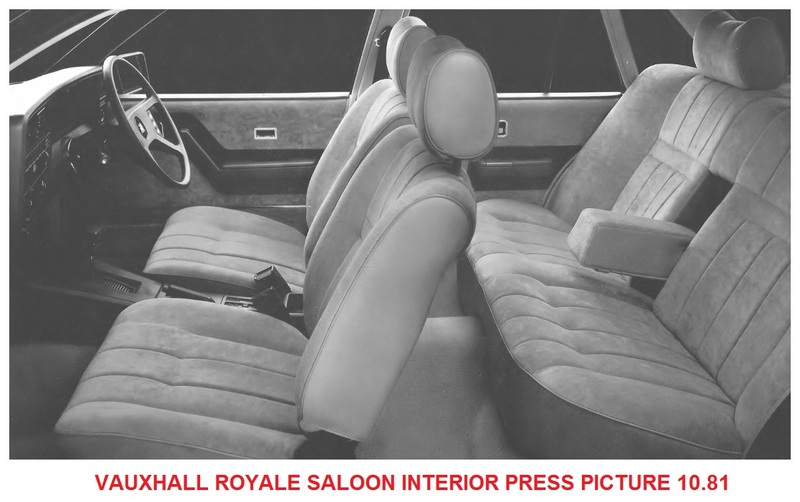 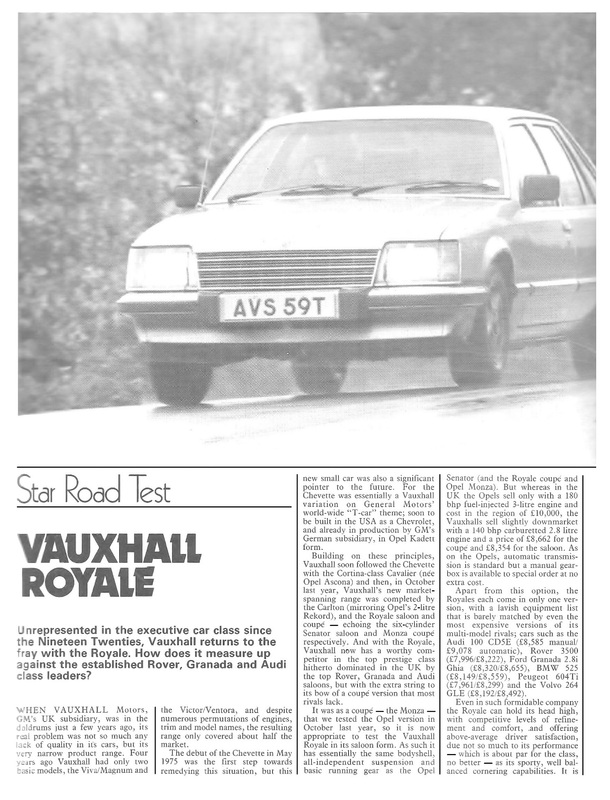 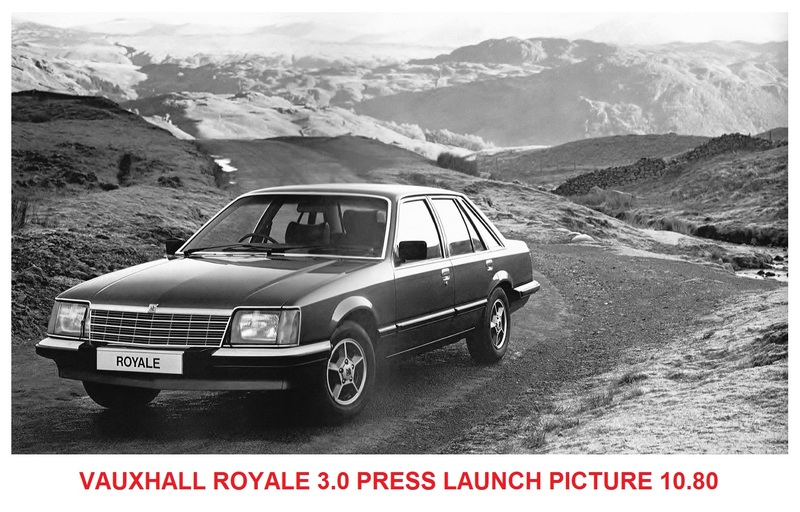 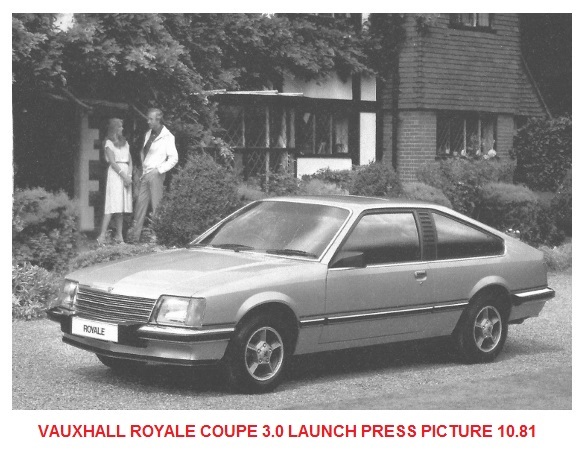 This is where the story of the Vauxhall Royale begins. 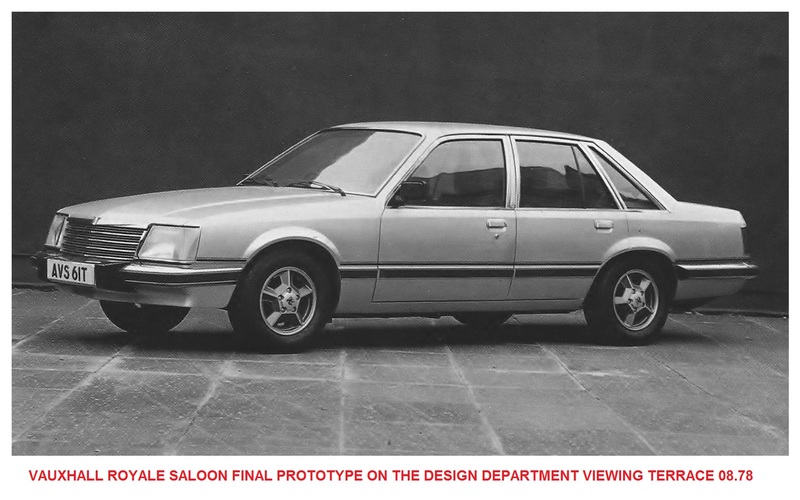 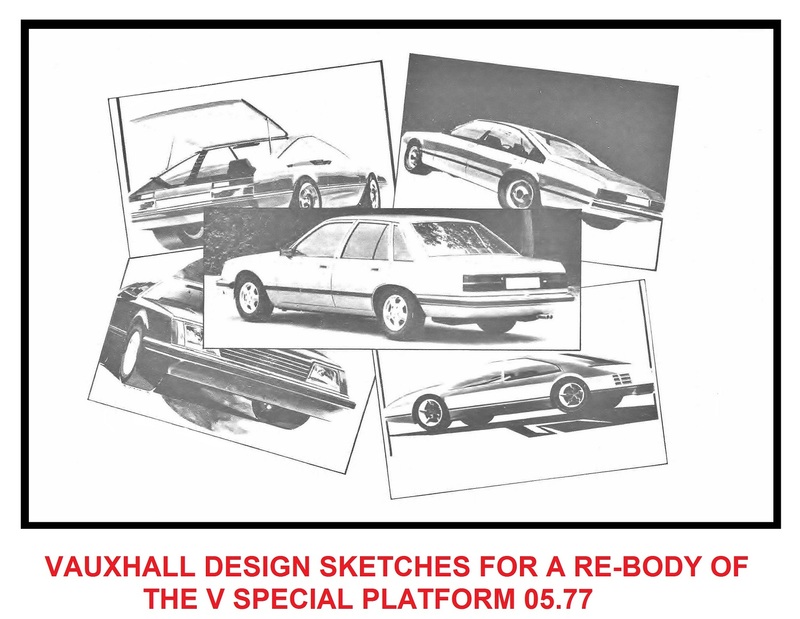 The Luton Design Department, under Wayne Cherry, identified three distinct alternatives for a top of the range Vauxhall flagship model. 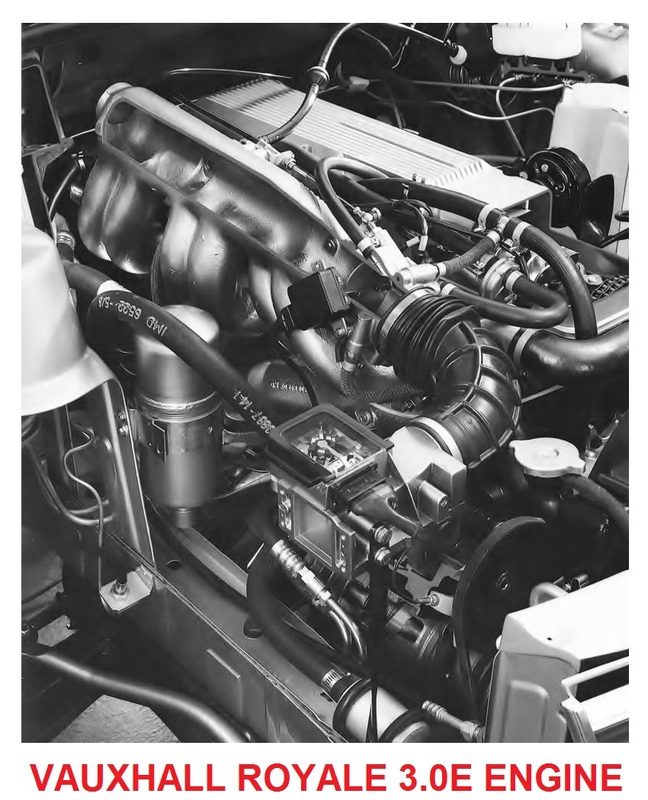 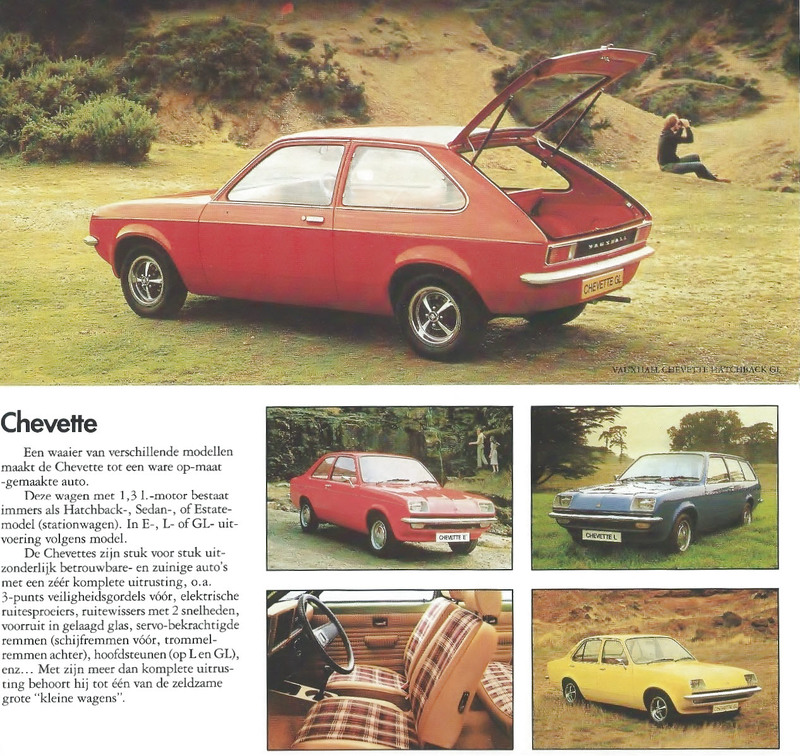 The first of these was the stretched FE, built by Panther in 1976 and based on a 1975 Design Concept, this would have comprised 2 model range starting with the six cylinder Opel 2.5litre CIH with a 2.8litre version as a performance option and all using the same body and trim level with a provisional name badge of Viscount. 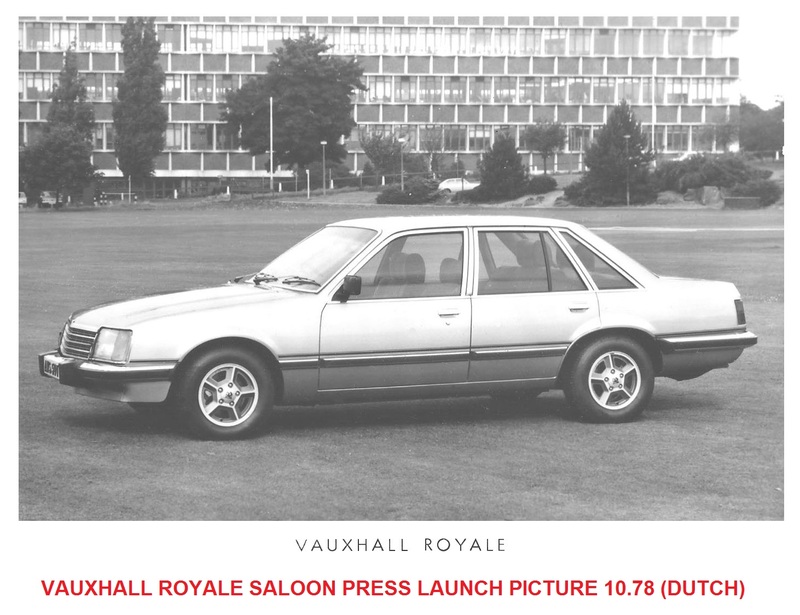 The one running prototype built was lavishly appointed and luxurious, it featured an imposing & attractive front end design that was immediately identifiable as a Vauxhall. 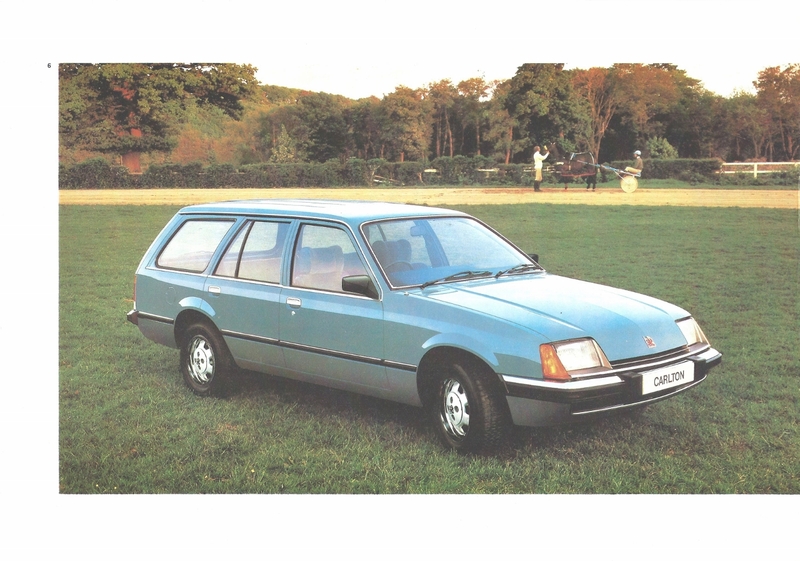 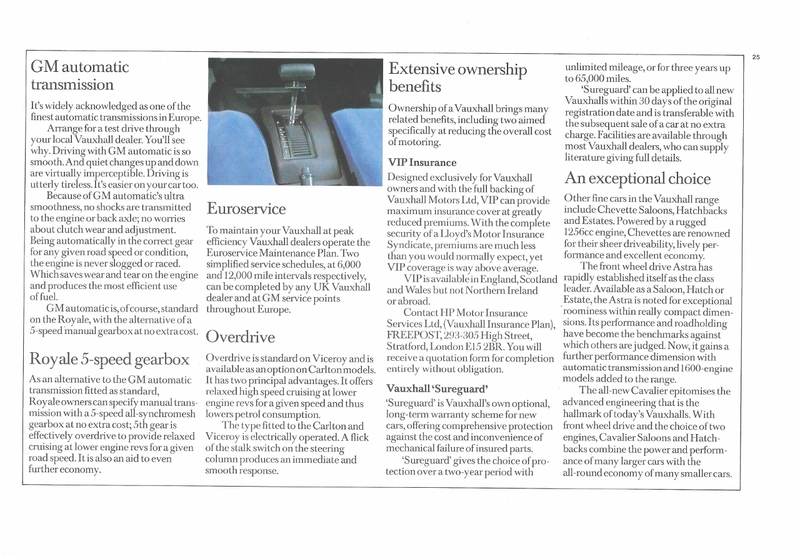 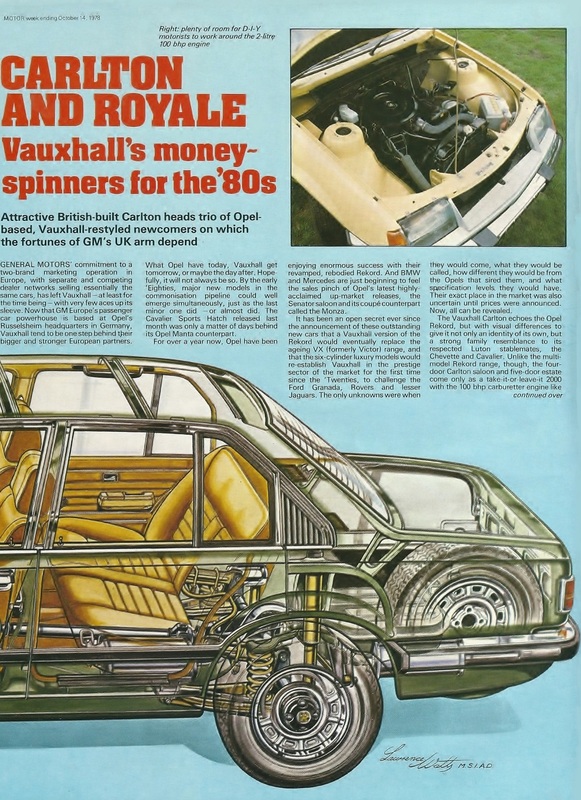 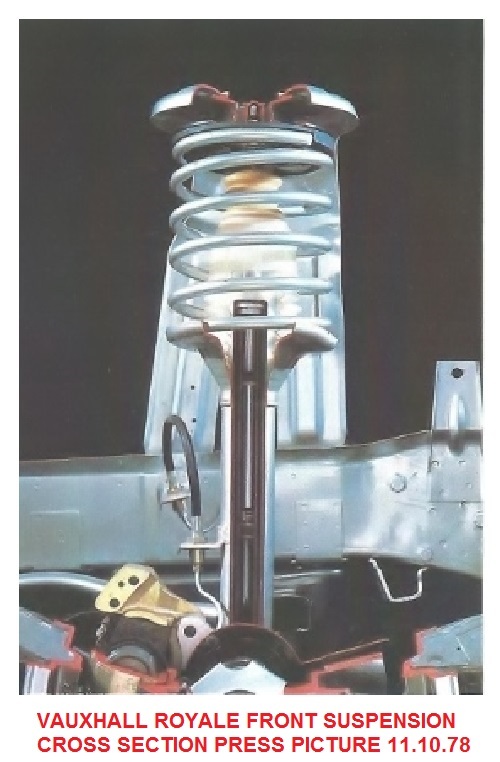 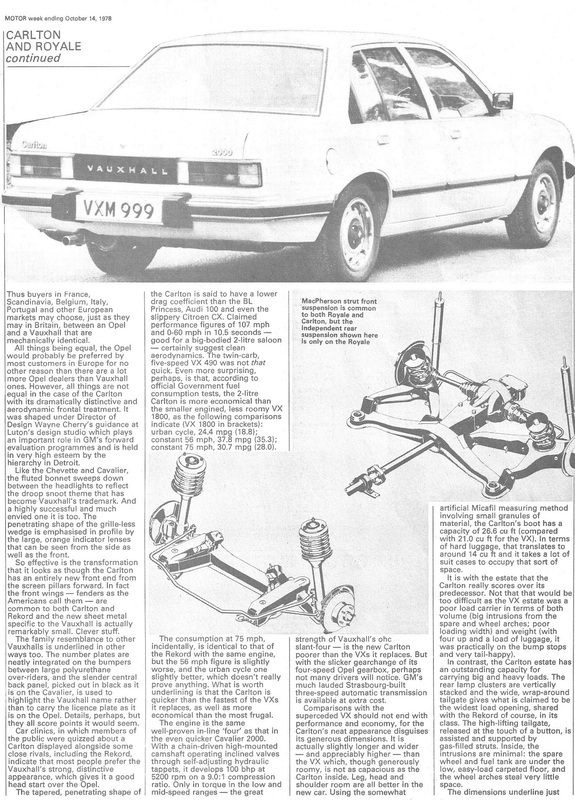 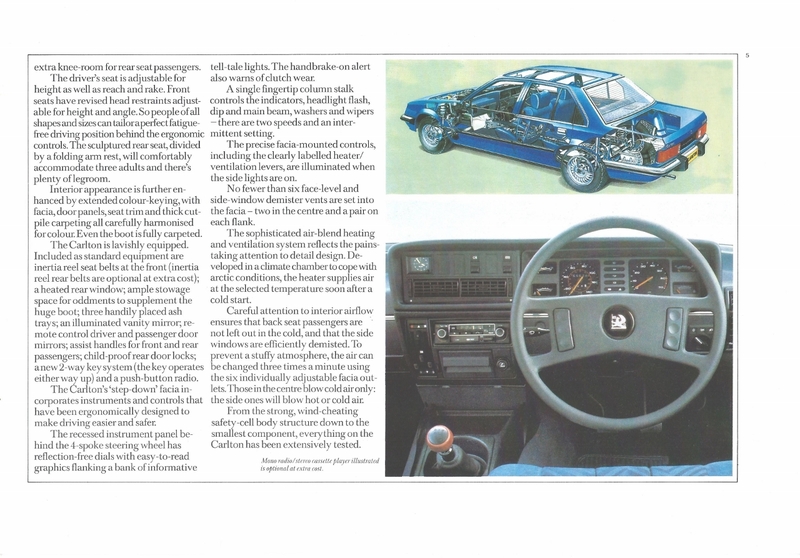 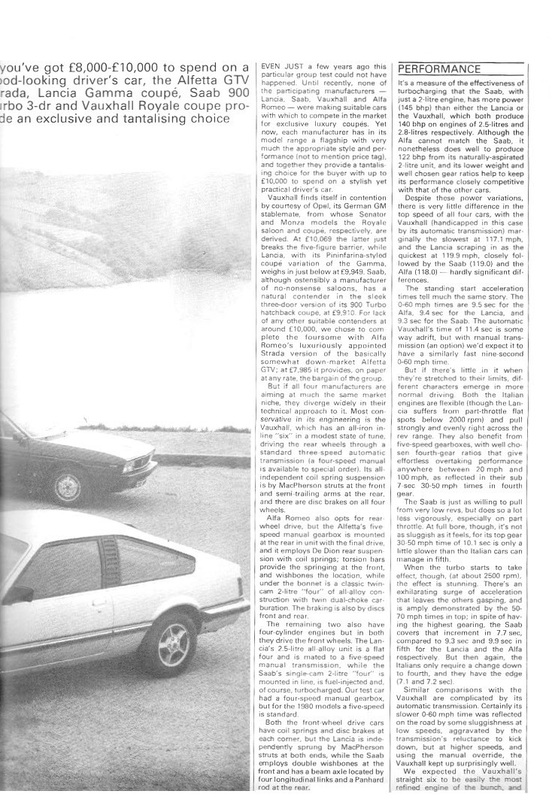 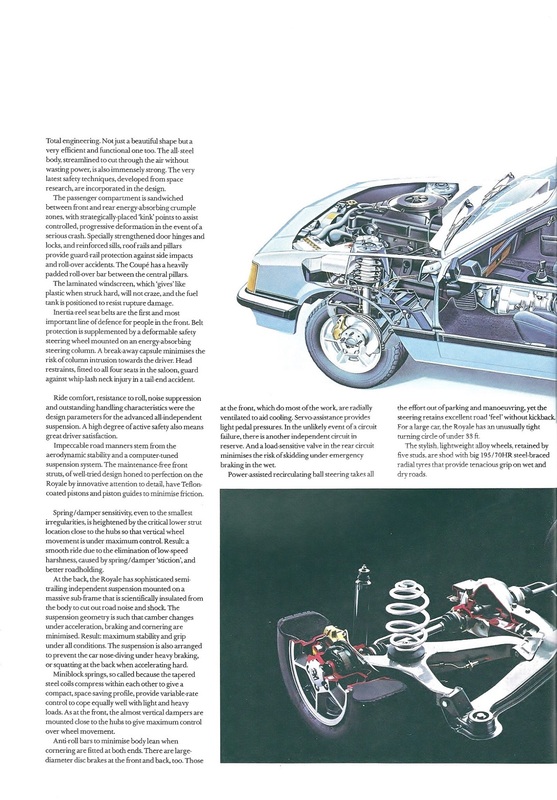 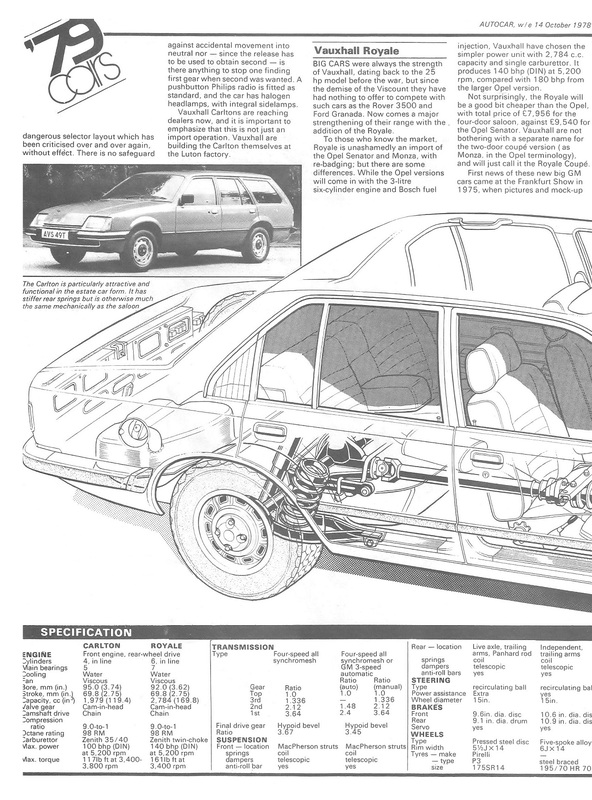 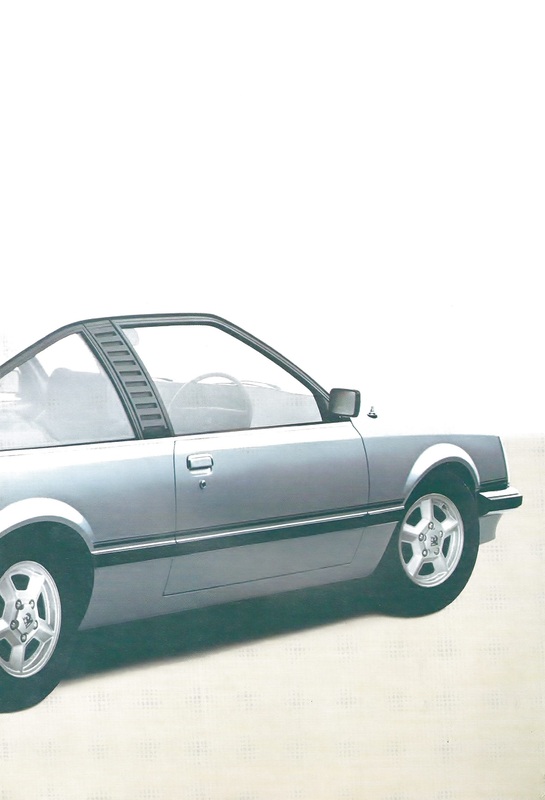 The reason for not pursuing the project was that it was still based on a standard, albeit longer, FE VX Series chassis which had been developed to as good as it could get and was not felt to be competitive in the sector of the market that its prospective price would have placed it and Vauxhall were aiming for. 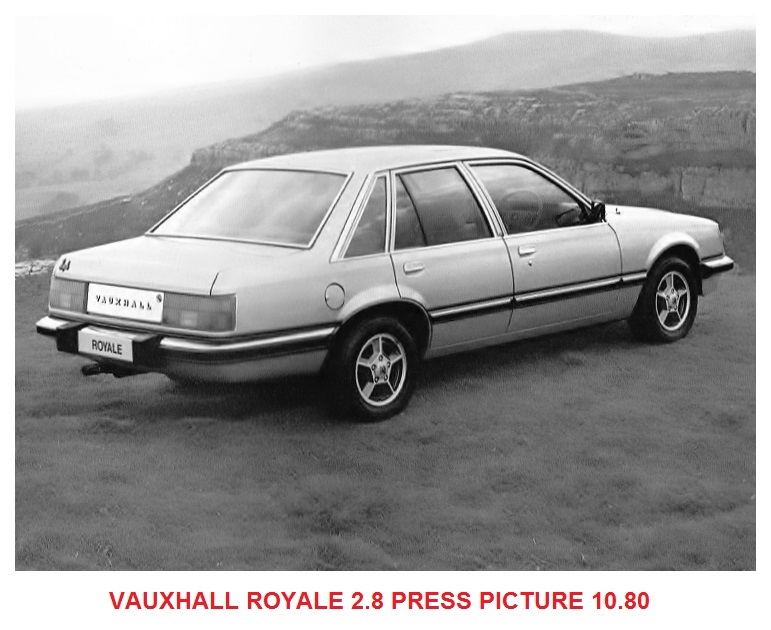 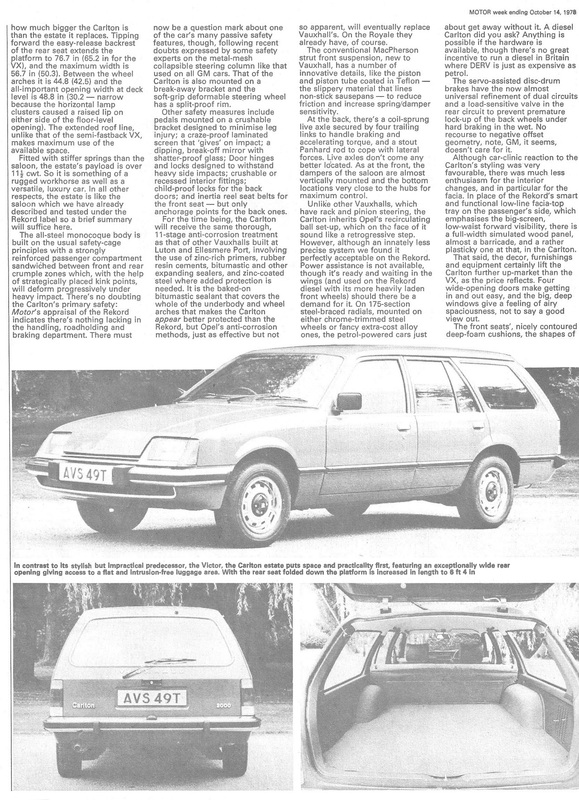 The second was to make use of the new V-6 Special platform being developed by Opel with a wholly Vauxhall designed body, a similar option was being considered lower down the range with the V-4 Platform based 5 door Hatchback Ventora Concept. 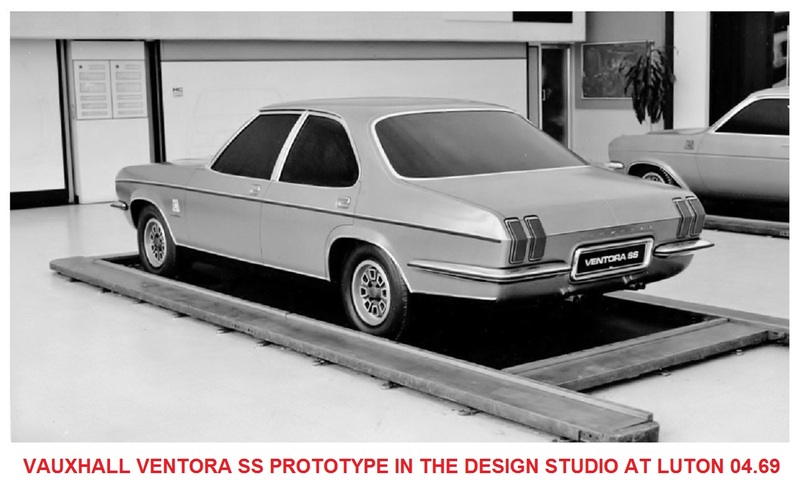 A styling mock-up was built and followed a conventional 4 door saloon configuration and even a conventional front grille albeit aerodynamically slanted. 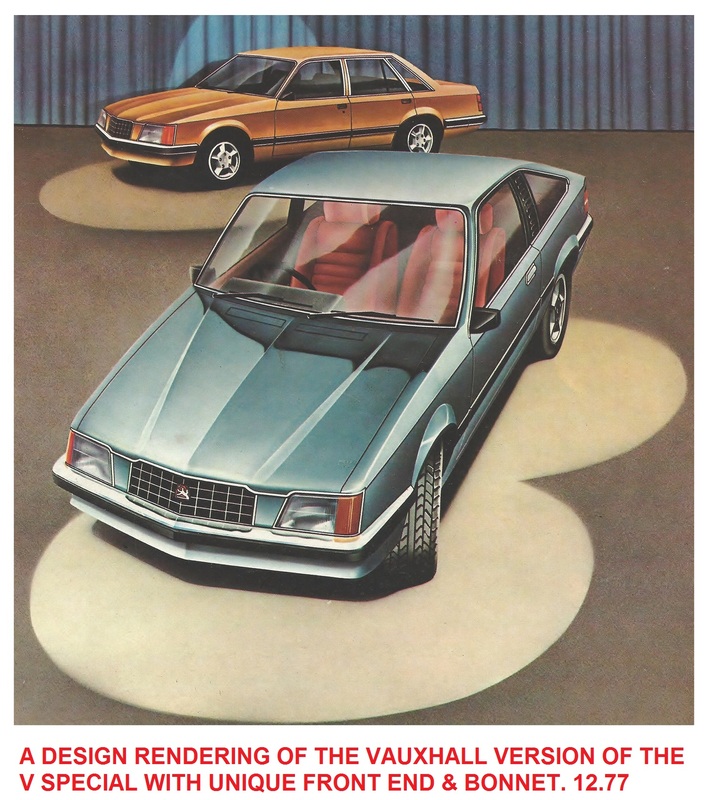 The irony was that the Vauxhall Concept, which had been designed independently of Opel, ended up looking remarkably similar in profile. 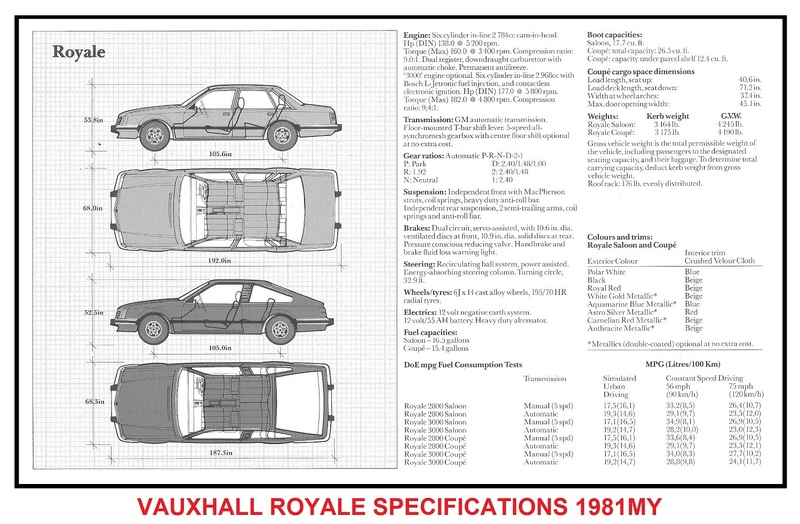 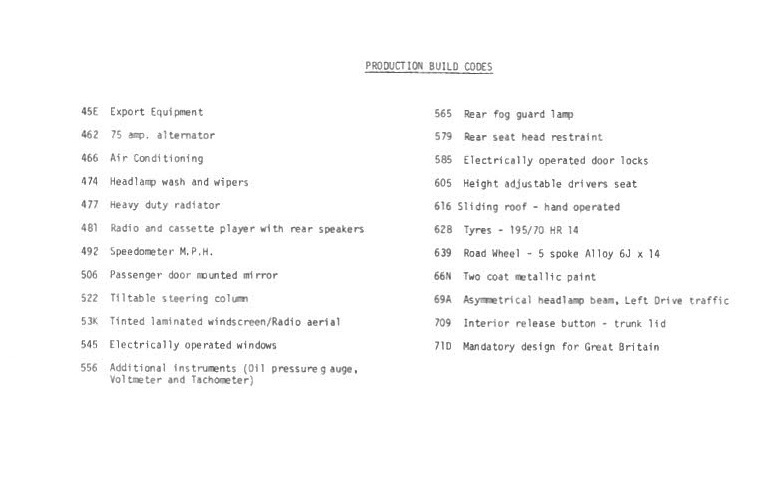 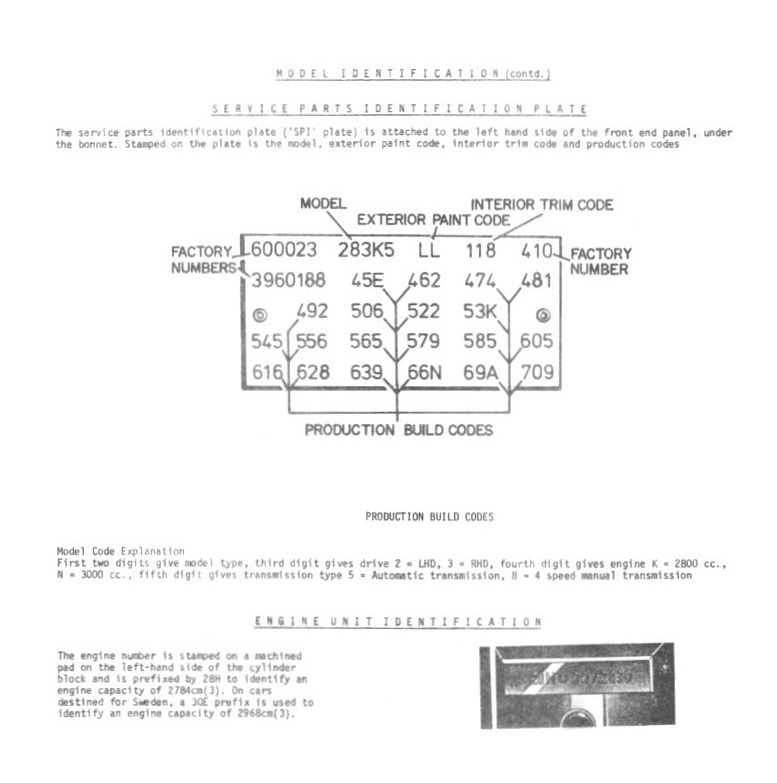 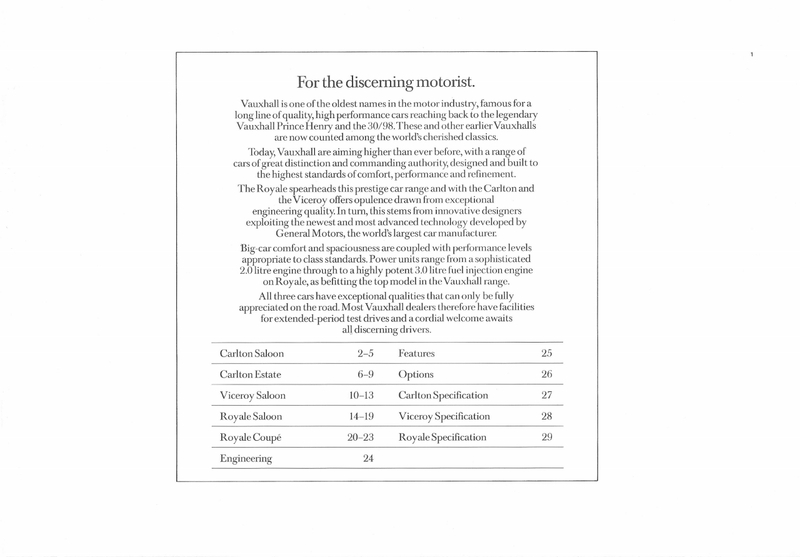 The Product Planning Committee had researched the prospective sales volumes likely and made the case for a unique Vauxhall design uneconomic and so the project was dropped. 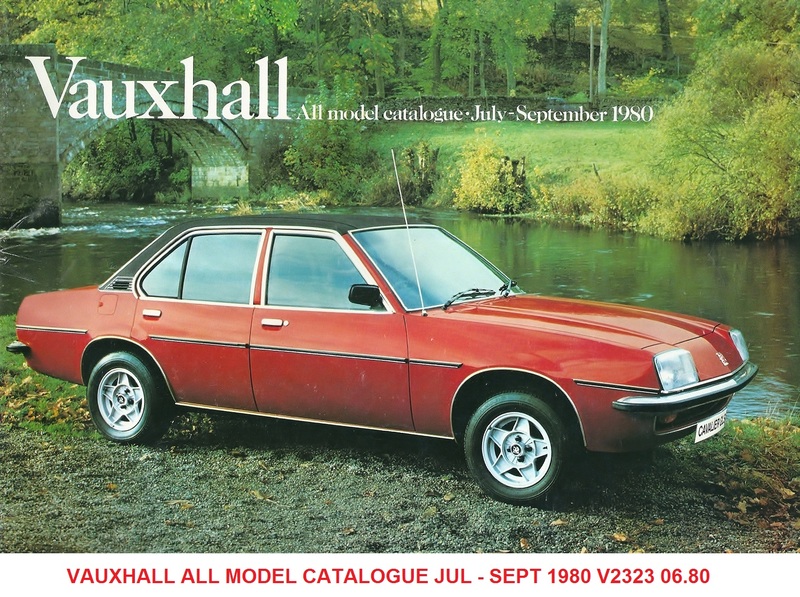 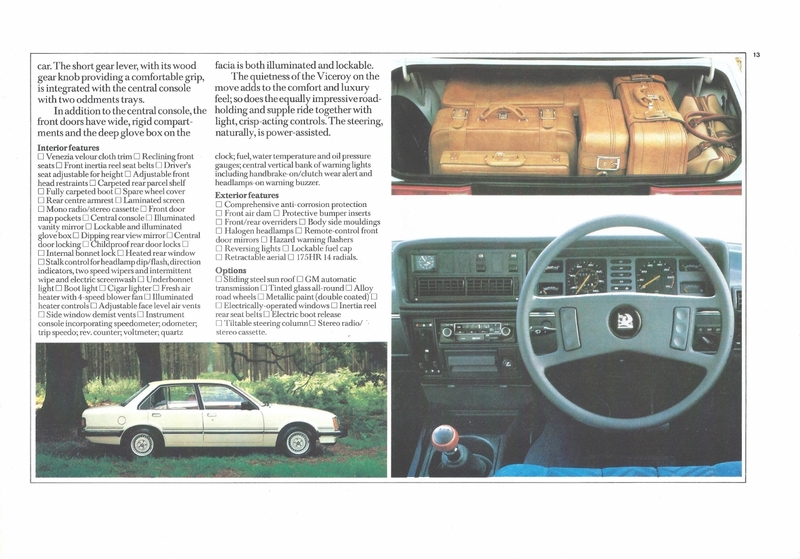 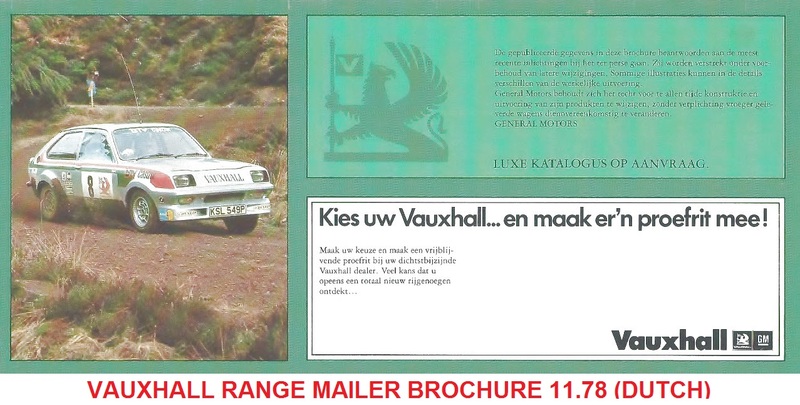 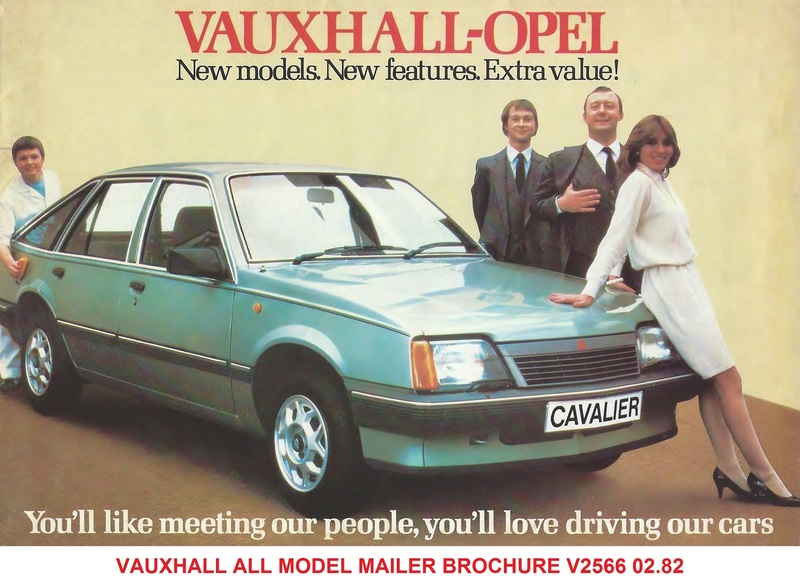 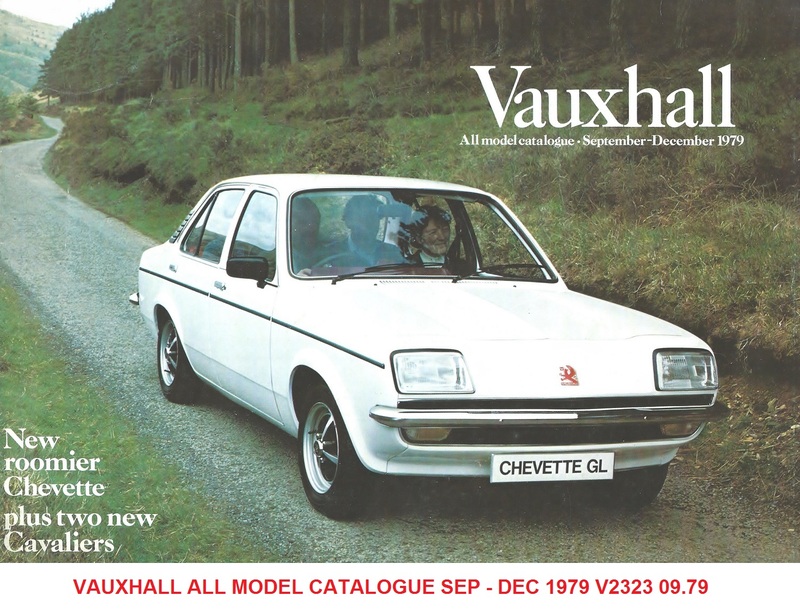 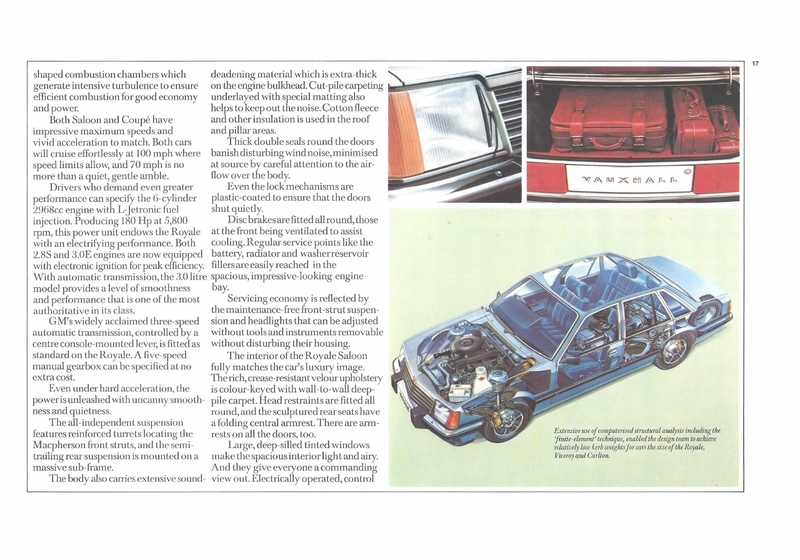 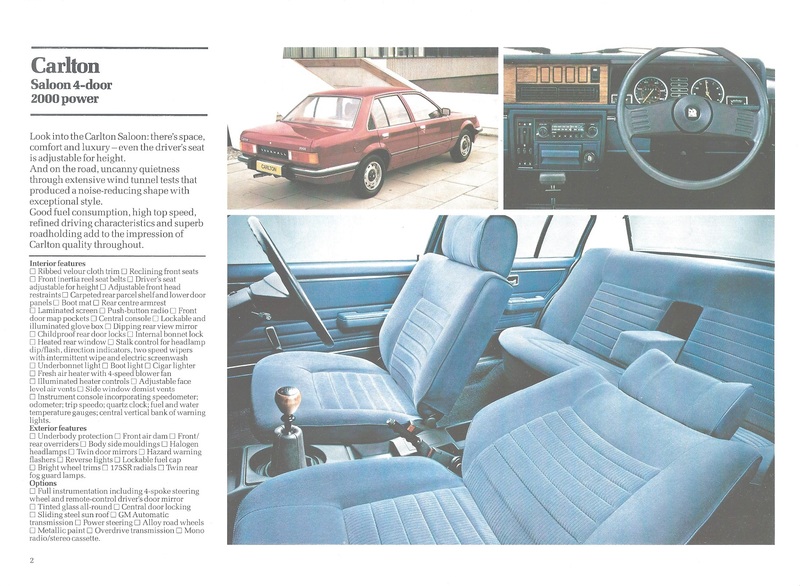 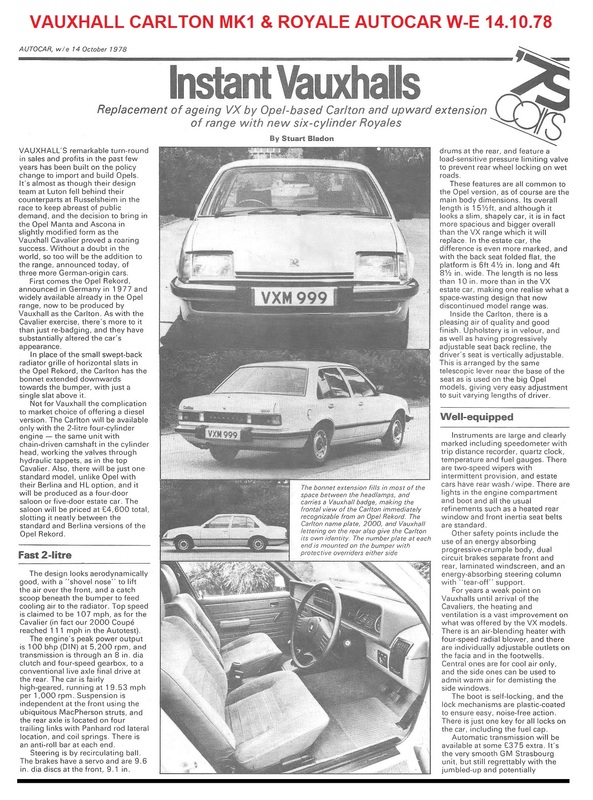 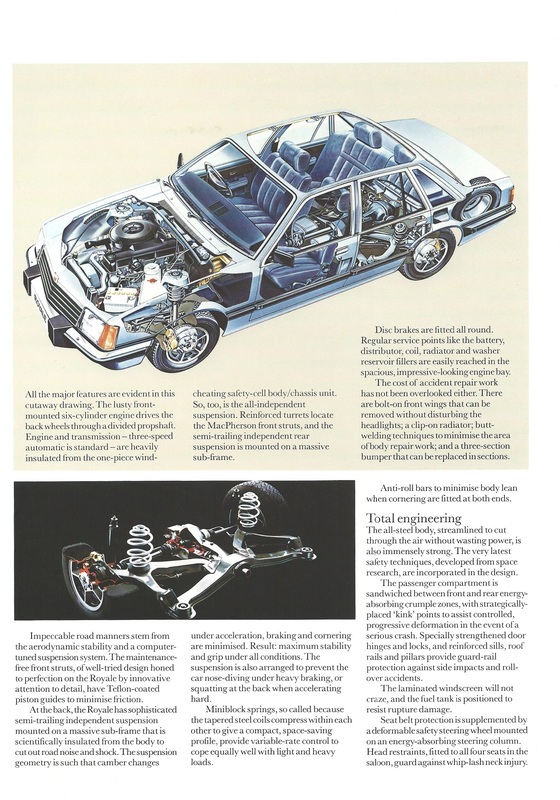 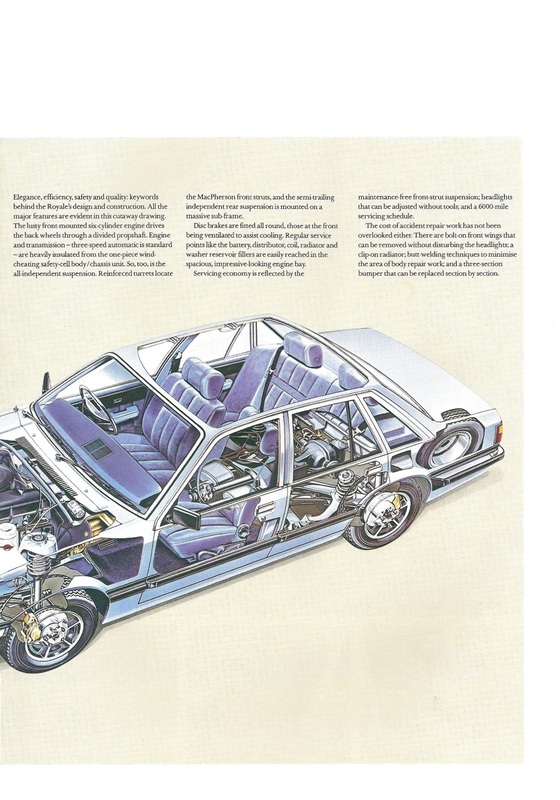 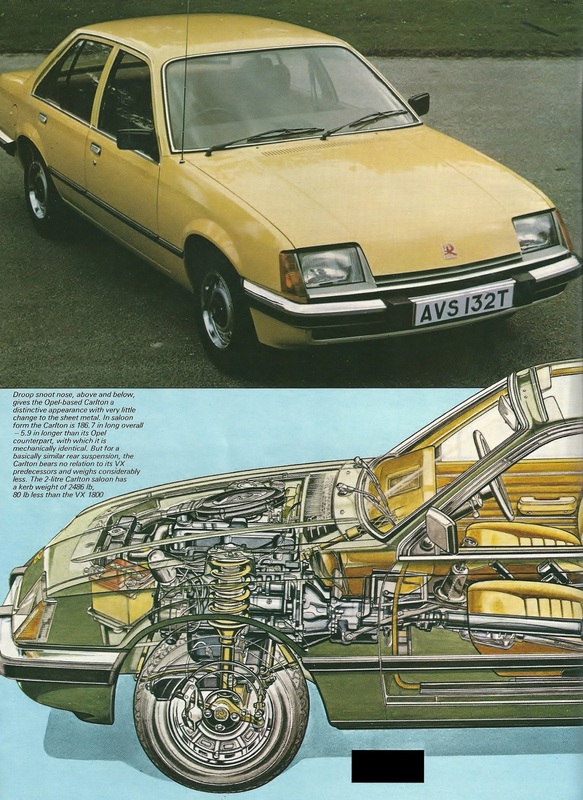 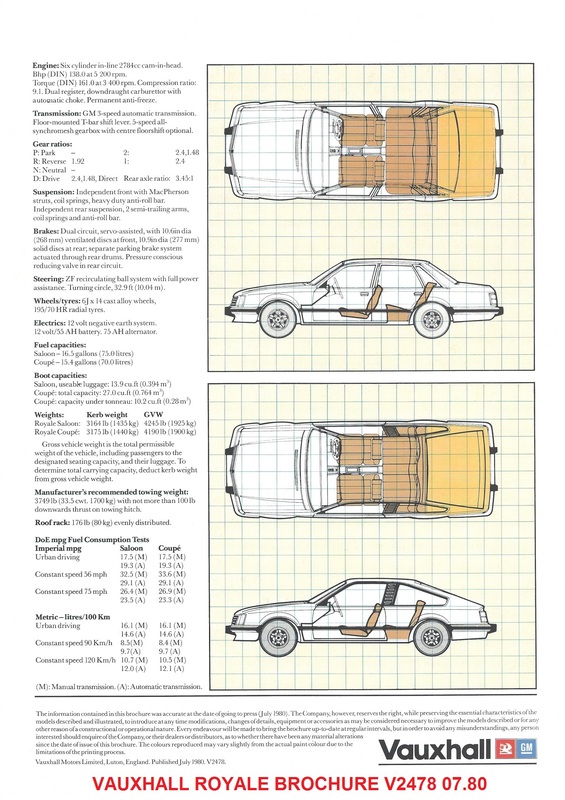 The third option was to resort to an already tried and tested formula that had been set with the Chevette & Cavalier MK1, meaning to take an Opel design and modify the front & rear design and interior to create a distinctly recognisable Vauxhall style. 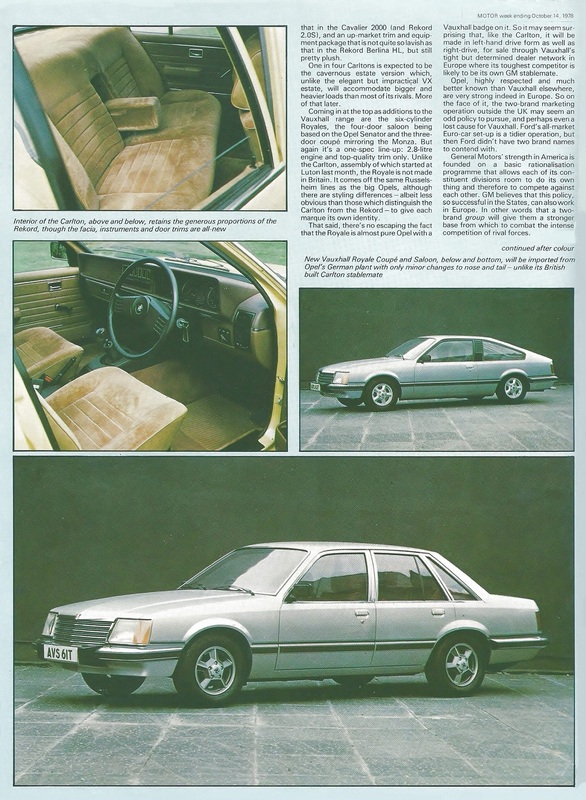 Ironically, Opel were in a similar position to Vauxhall in that their replacement for the Diplomat & Admiral B, the Diplomat C, was well into its development when it was cancelled late in 1974 due to Opel’s same worries about the likely demand for very large cars, especially with a V8 engine, in the wake of the fuel crisis. 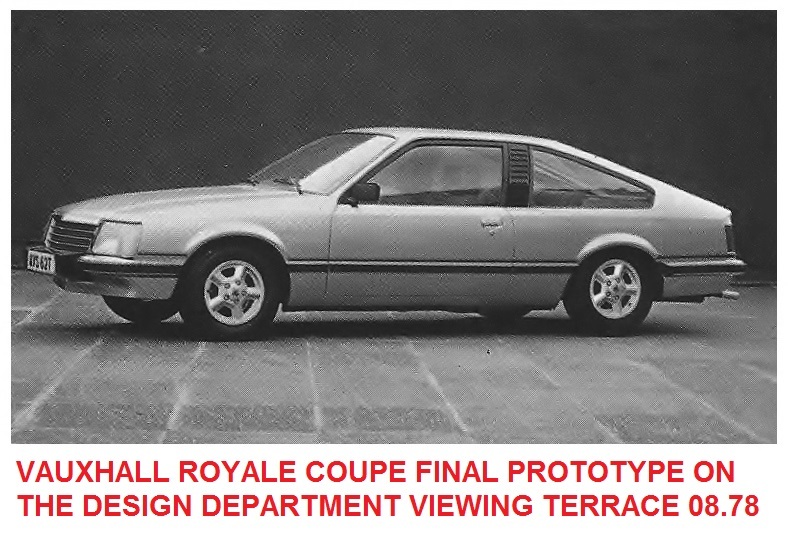 A planned Admiral / Diplomat B facelift, planned for 1974, had also previously been cancelled because of dwindling sales and meant the models were forced to plod on until August 1977 by which time, and like the PC Cresta & Viscount in 1972, they were well beyond their sell by date. 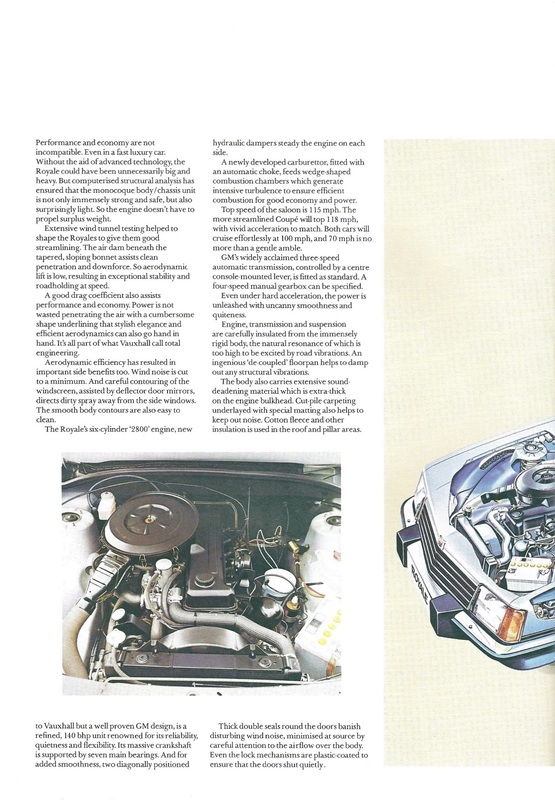 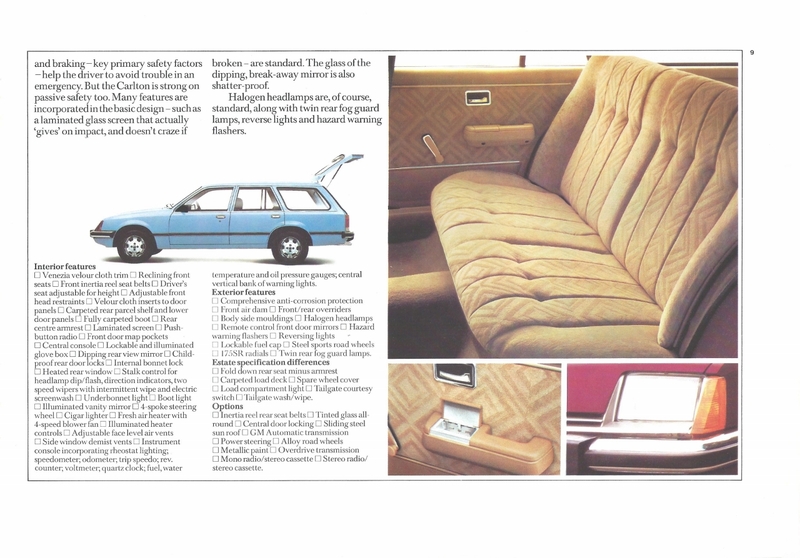 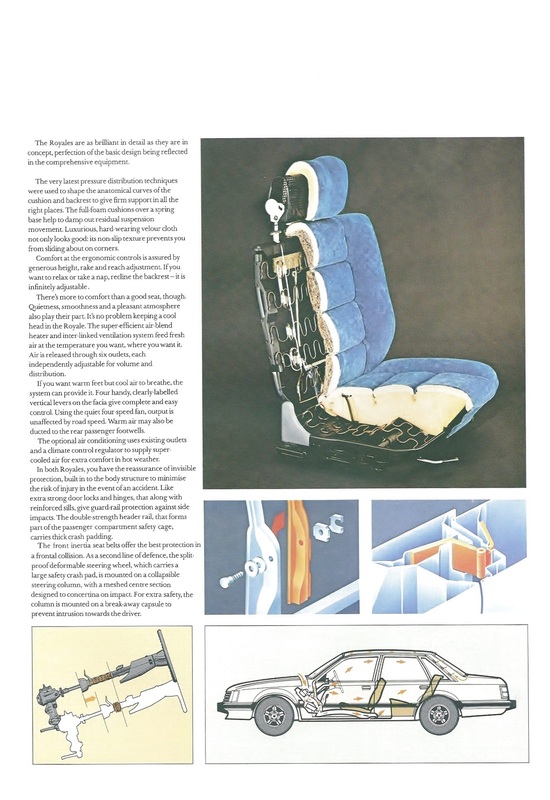 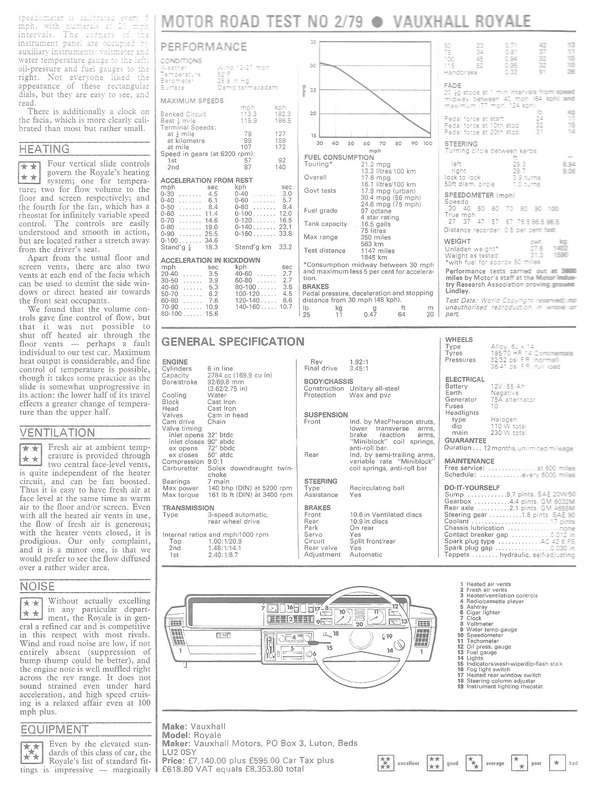 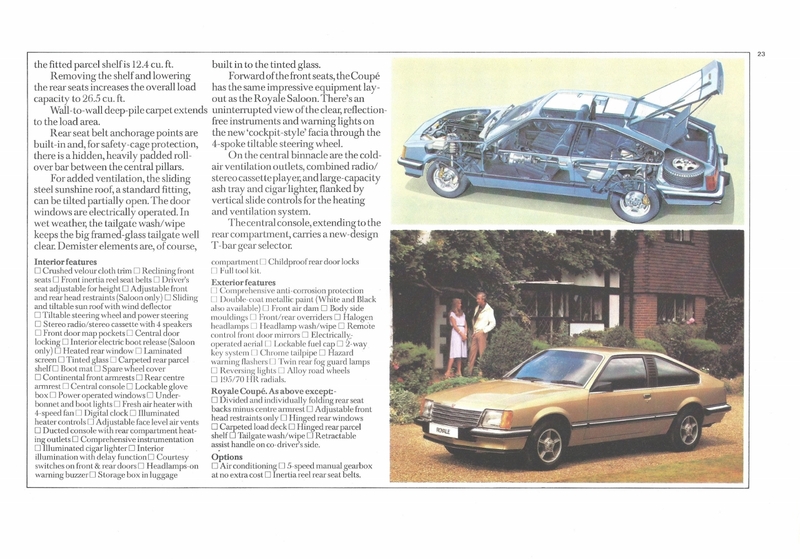 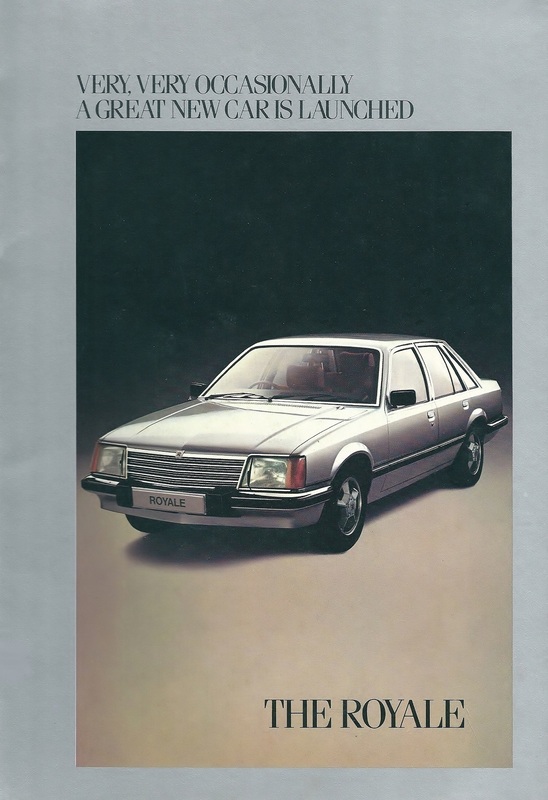 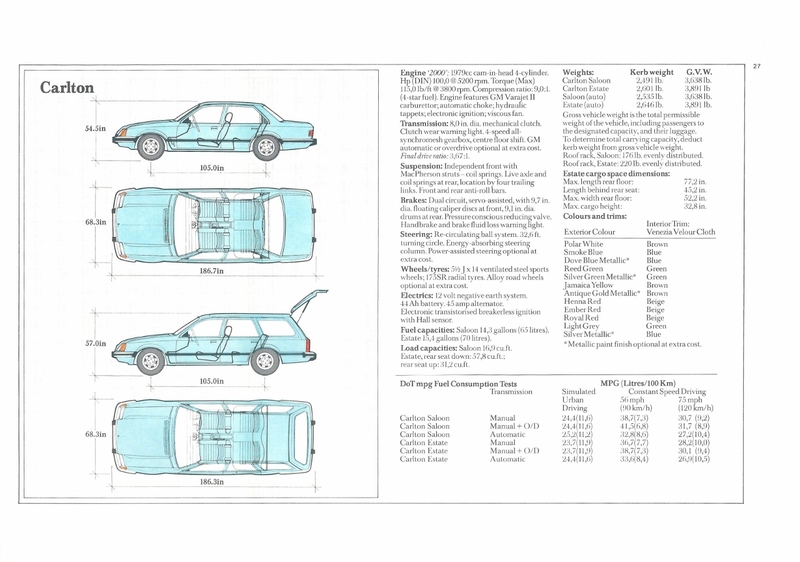 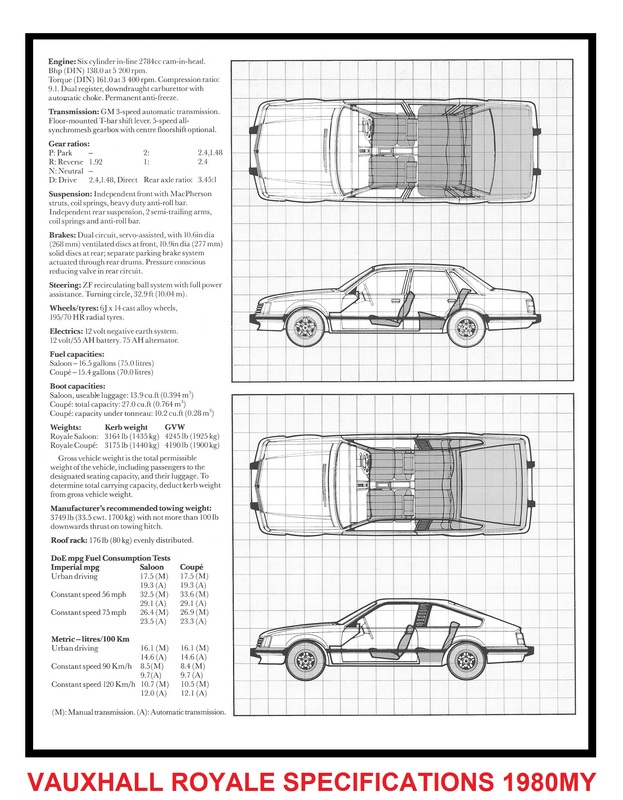 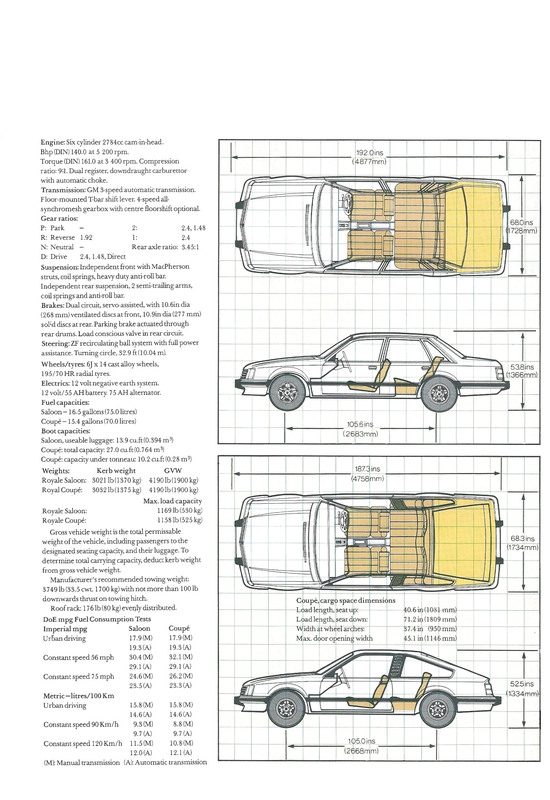 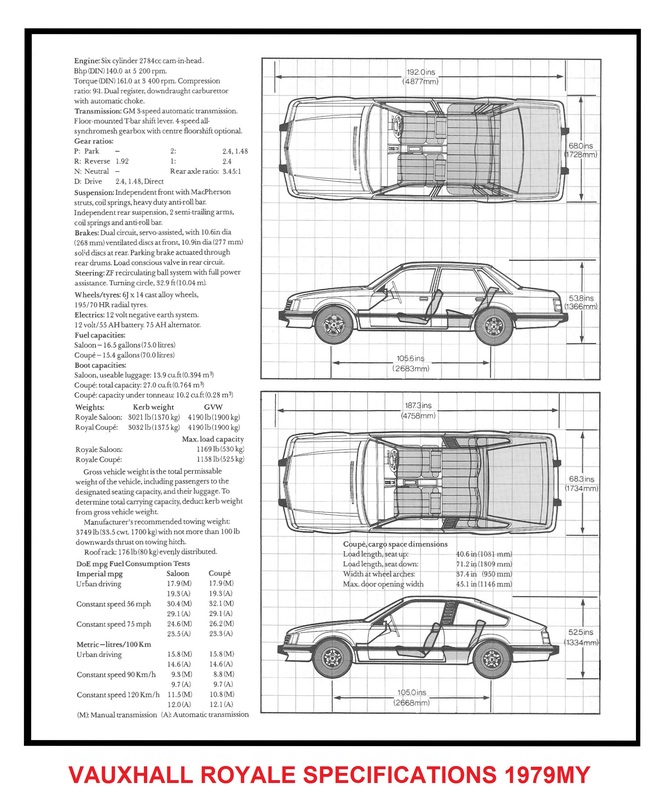 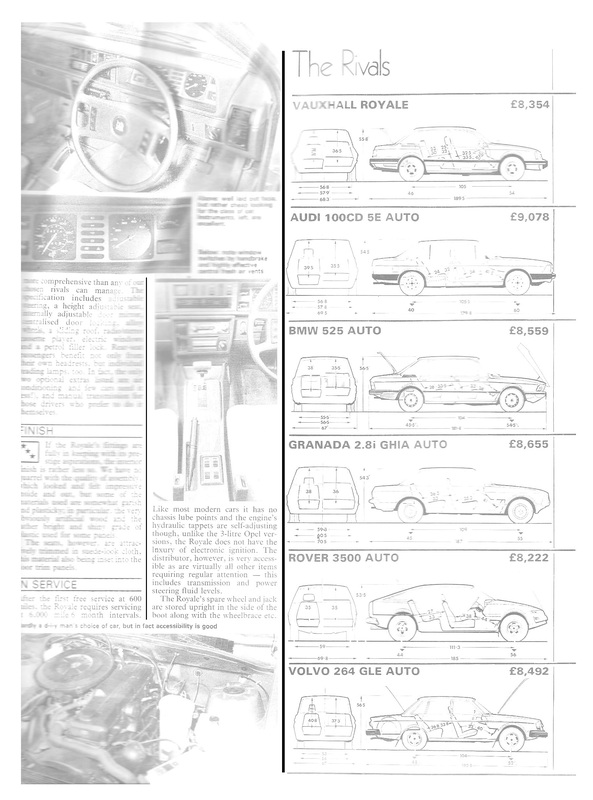 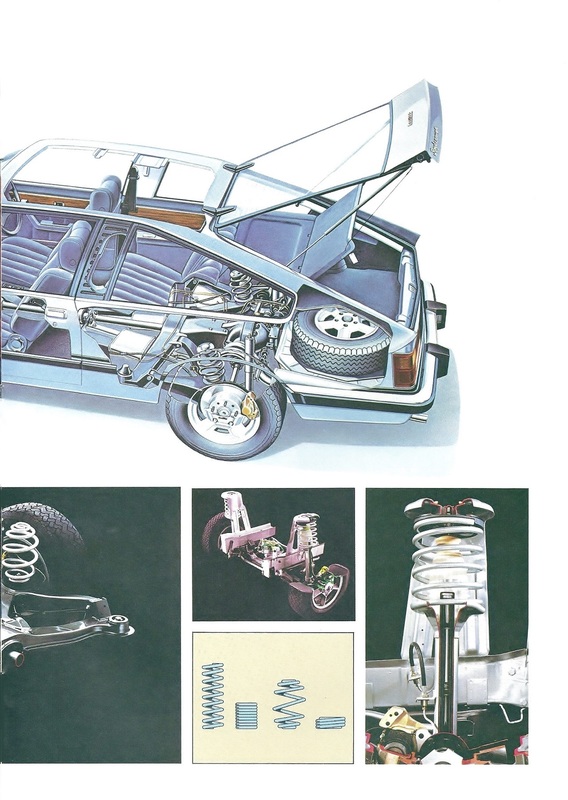 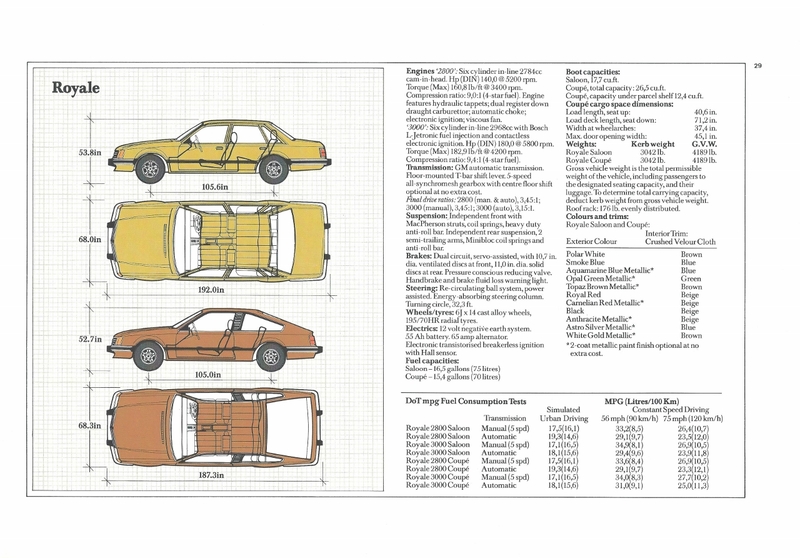 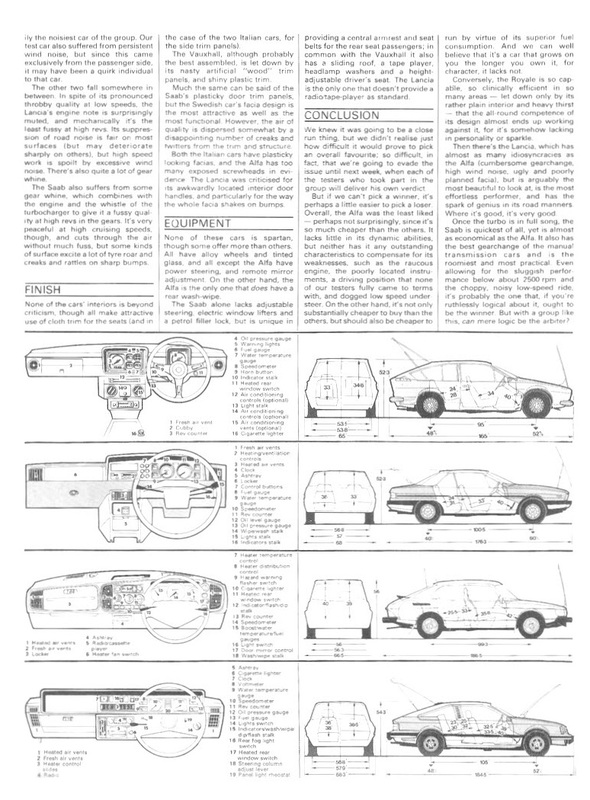 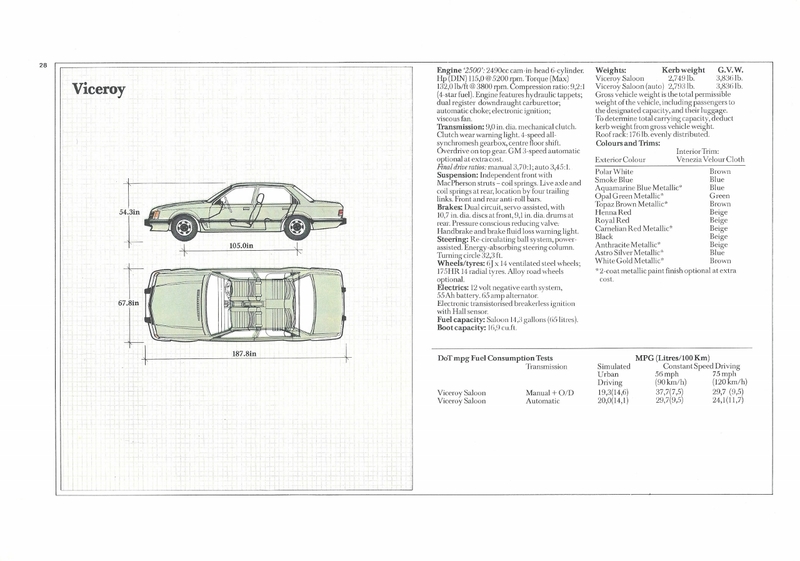 The original design brief for the Senator in 1975 was as a replacement for the Commodore B but with the demise of the Diplomat C project the Rekord E, which was already half way through its development, would be adapted with an extended front end to accommodate Opel’s CIH 6 cylinder engine but retain the rest of the Rekord E bodywork from the windscreen back. 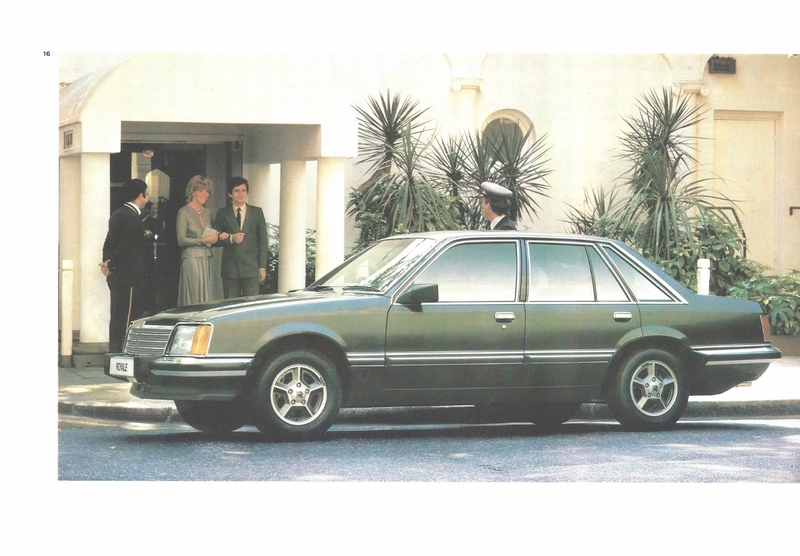 The Senator was now moved up in size and designed to be distinct from the Commodore whilst still using as many components from the standard V Car platform as possible. 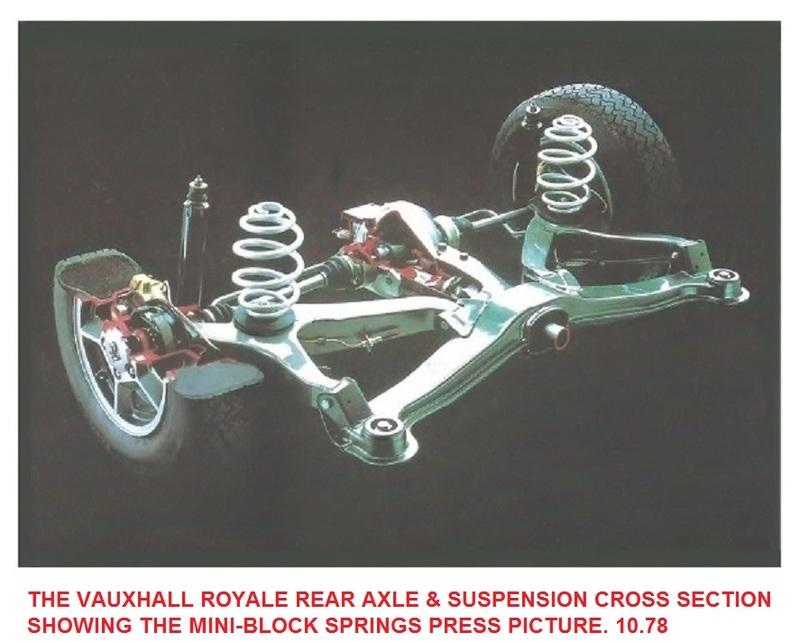 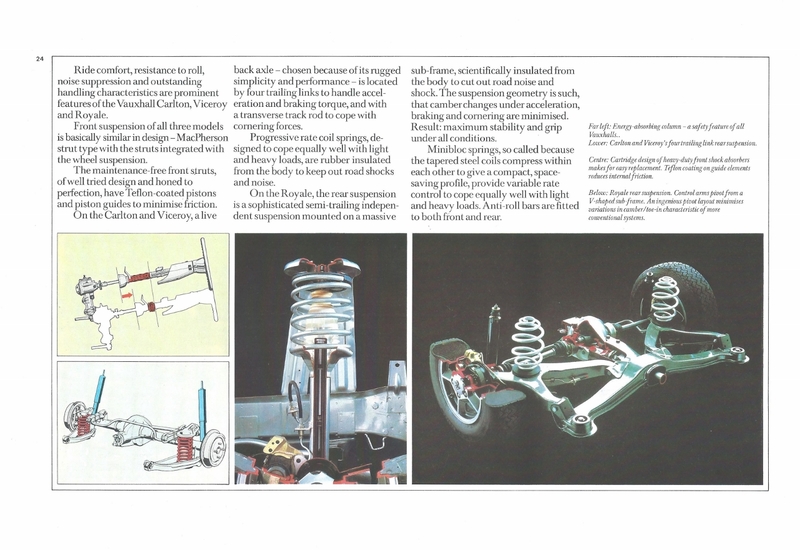 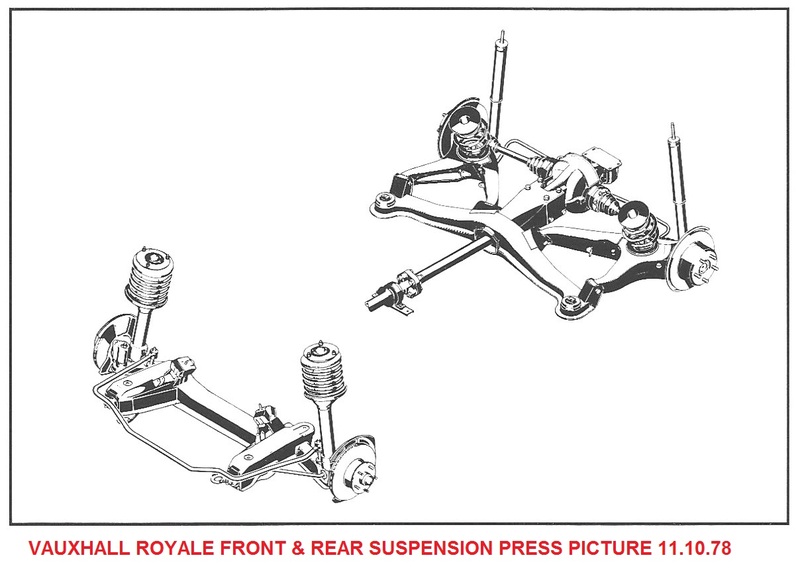 Due to the continuing sophistication of competitive models in the prestige segment it was decided to develop a sophisticated independent rear suspension using Mini-Block springs for the first time on the new car, the platform was now designated V-6 Special. 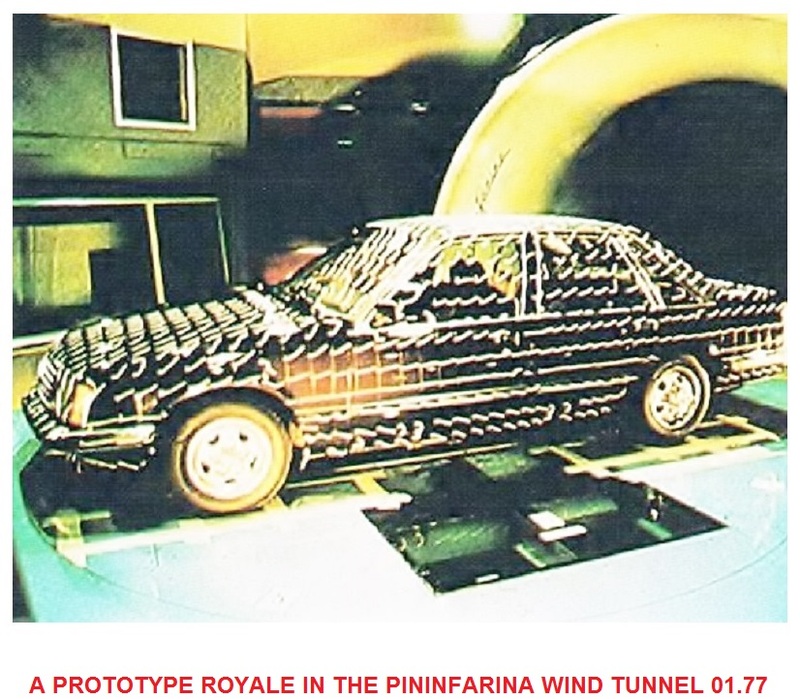 Great detail attention was paid to exterior aerodynamics and many hours were spent fine tuning the exterior in the Pininfarina wind tunnel. 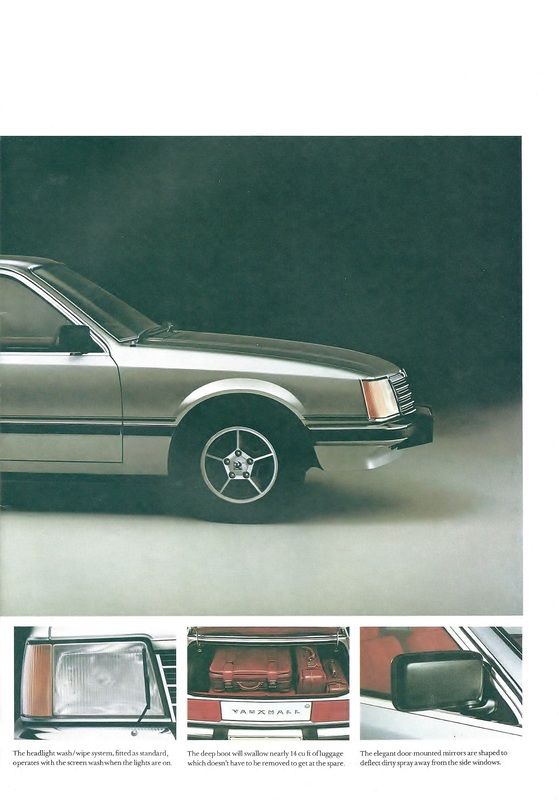 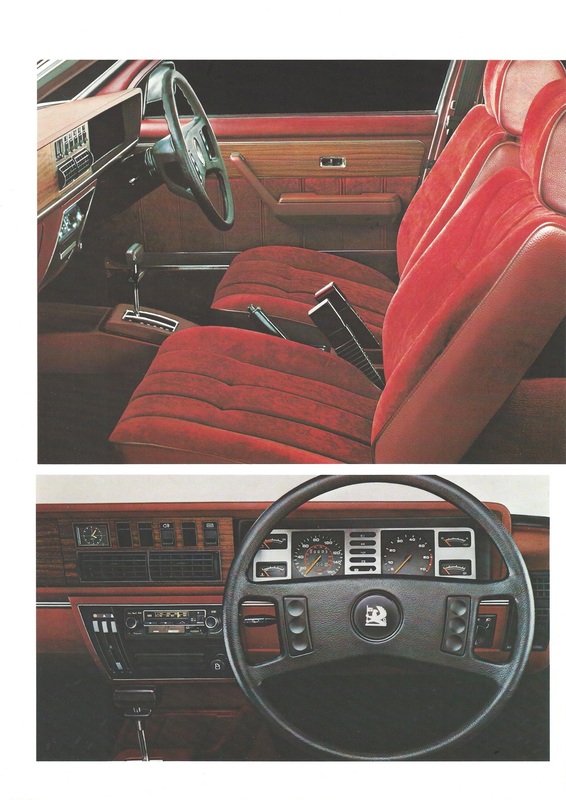 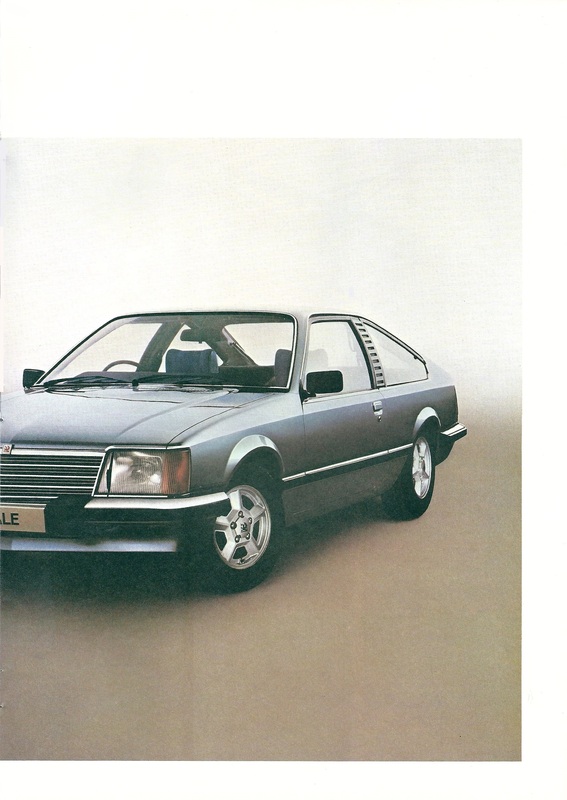 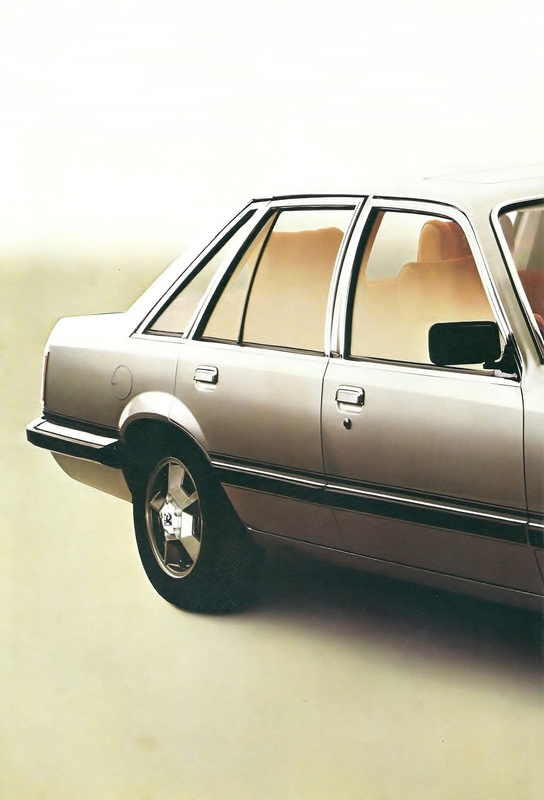 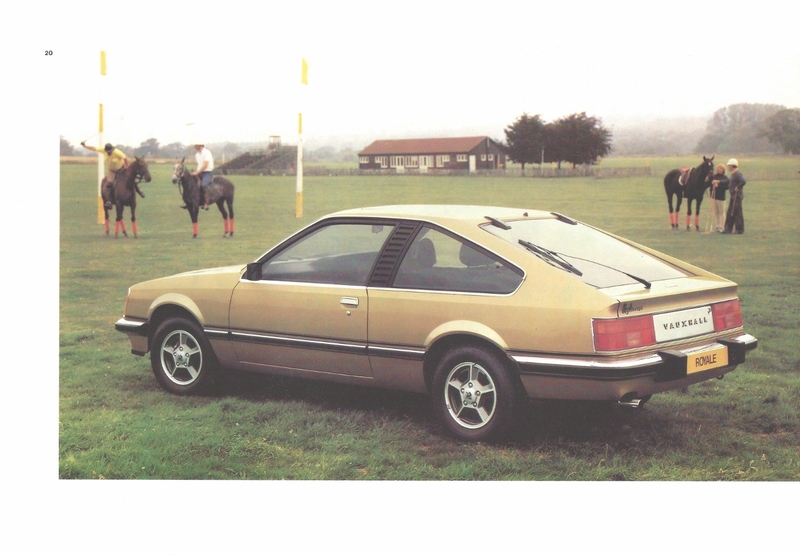 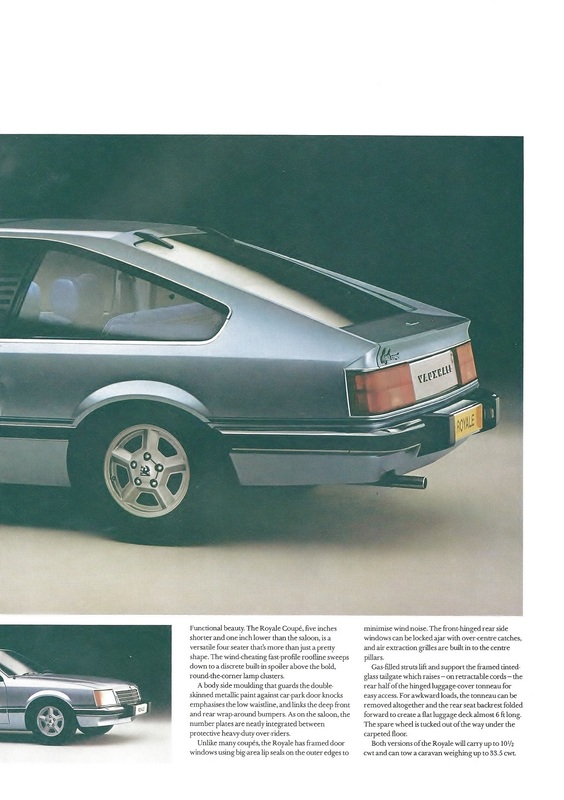 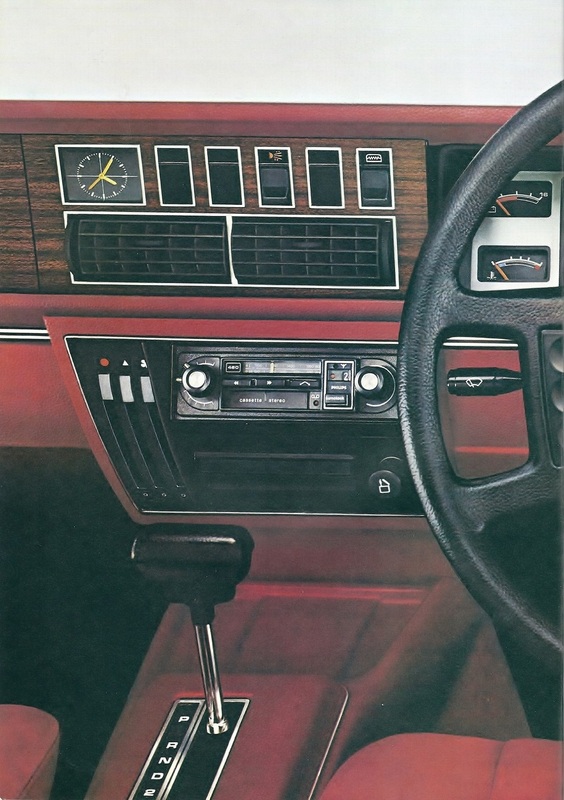 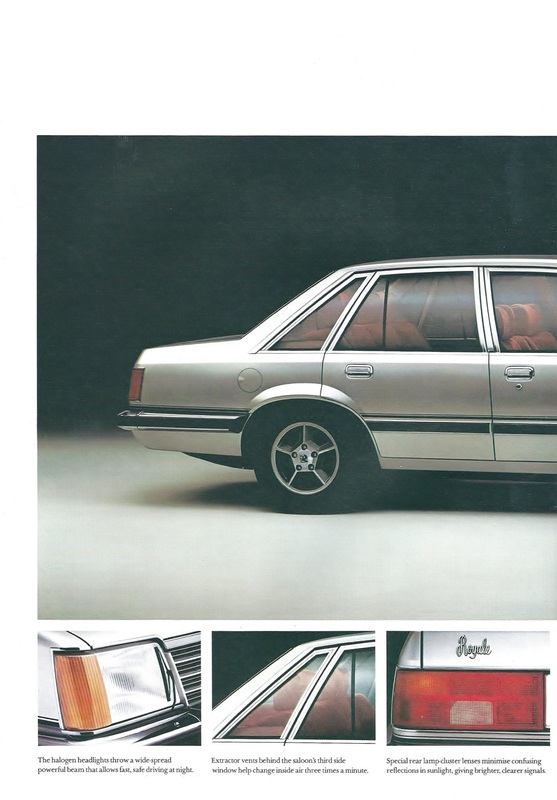 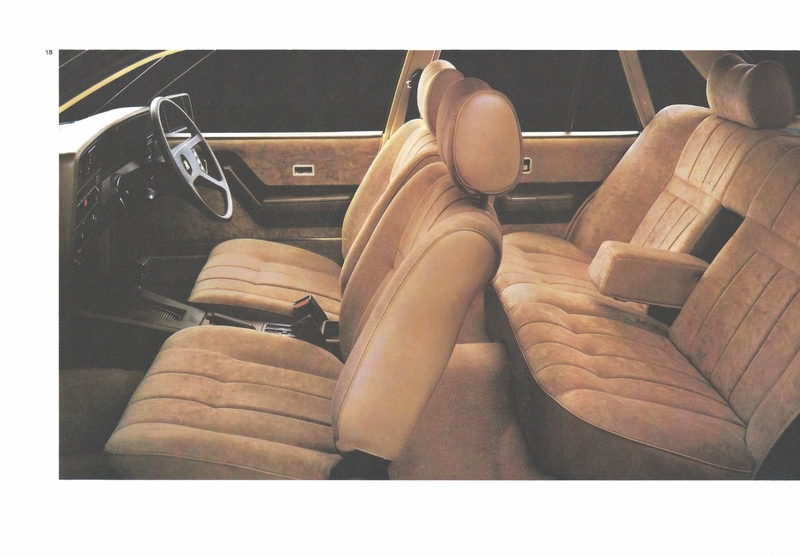 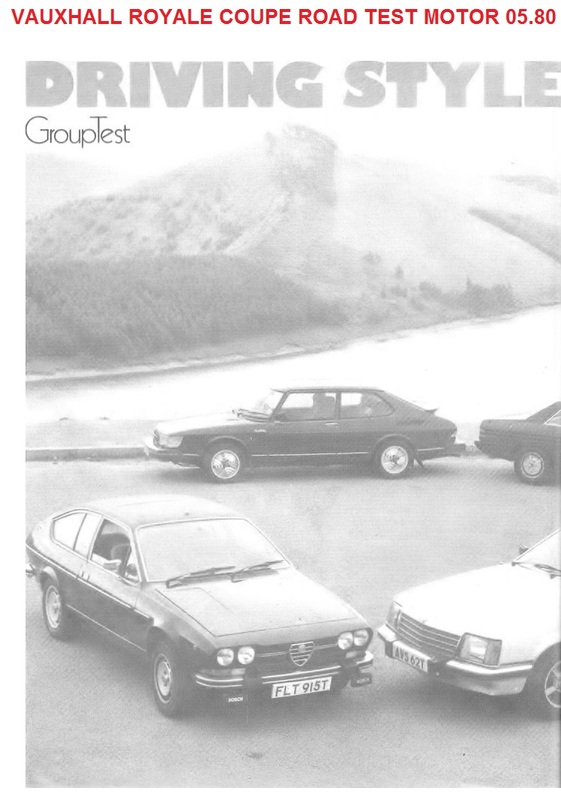 As no Commodore Coupe would be included in the new line up a 2 door Coupe version of the Senator was developed, the Monza, and prototypes of both were shown for the first time at the 1977 IAA but deliveries did not begin until May 1978. 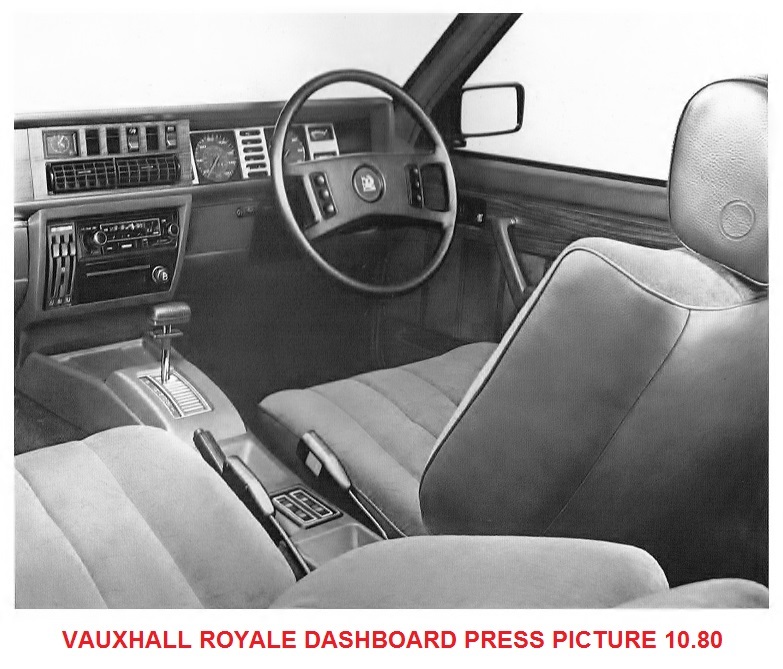 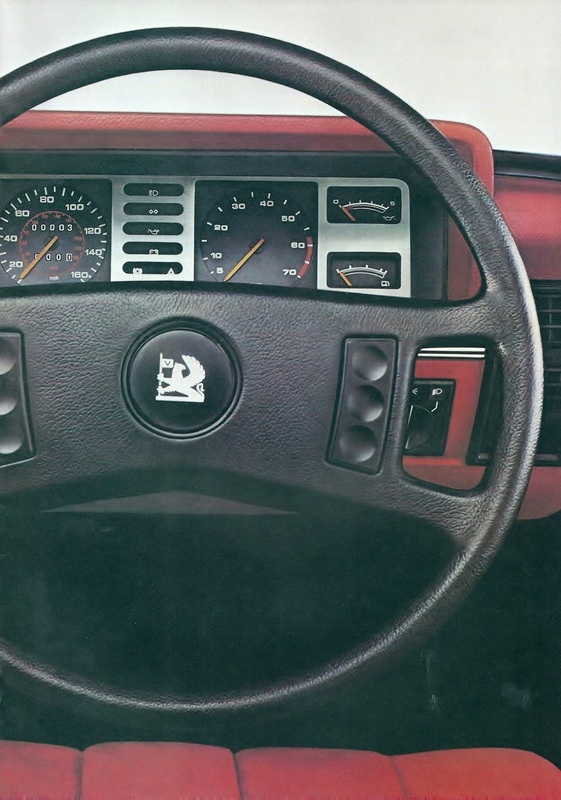 Meanwhile at Vauxhall Cherry’s Design team had modified the Senator with the dashboard from the upcoming Carlton but with additional instruments, a modified rear end which featured a brushed aluminium panel between the rear light units and a front end which used a different bonnet with traditional Vauxhall flutes, like the FE, and a black square slanted egg crate grille which gave a further link to the previous Ventora. 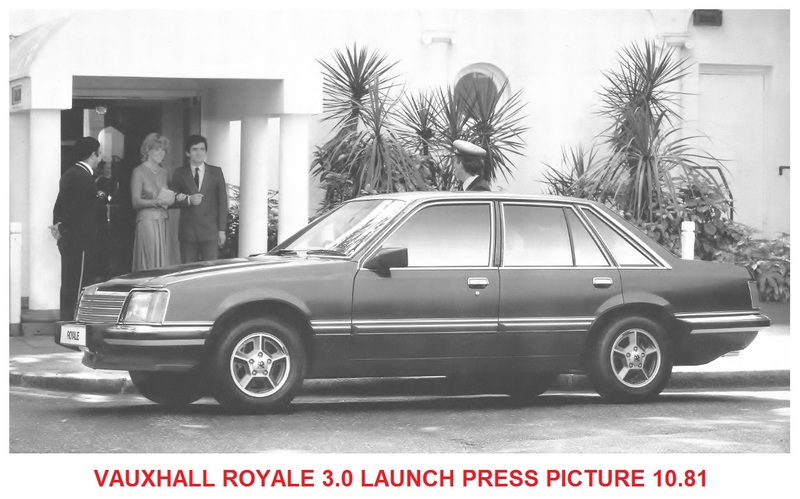 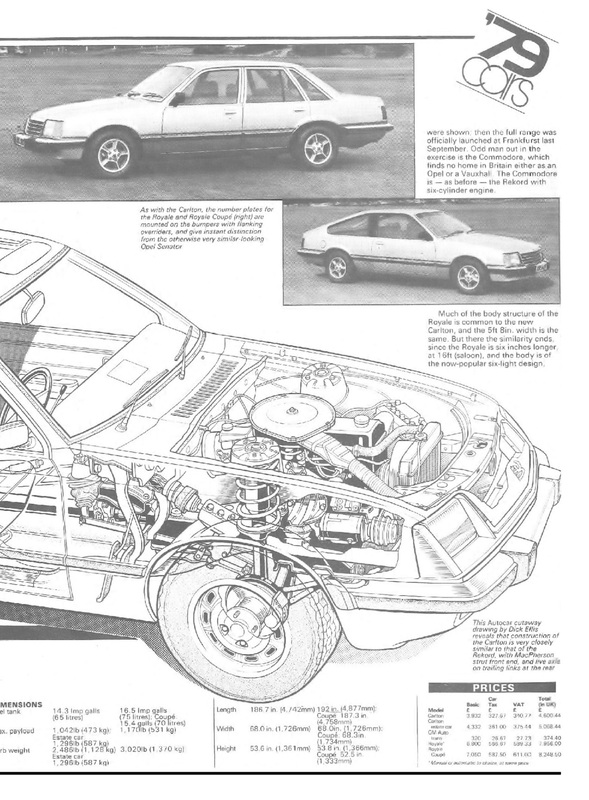 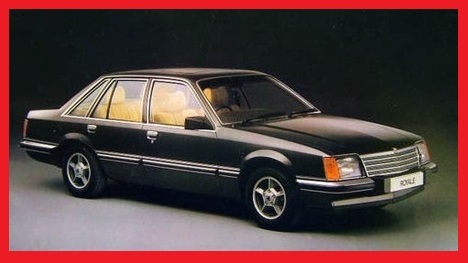 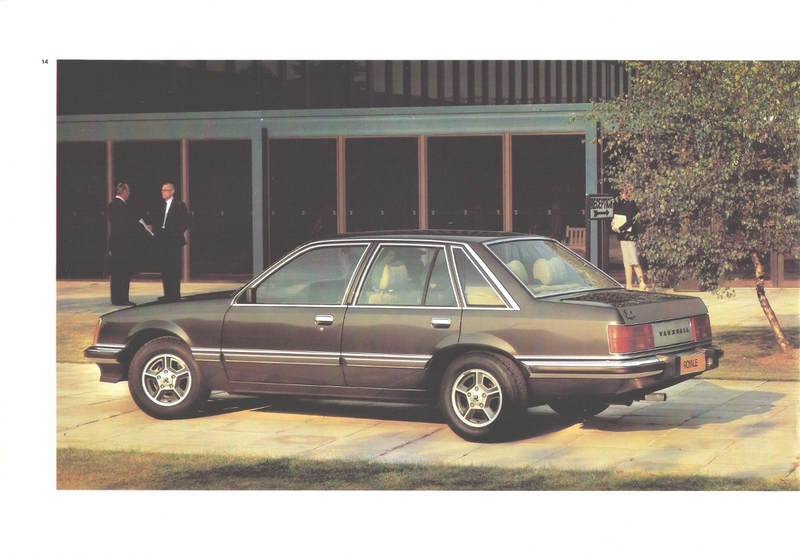 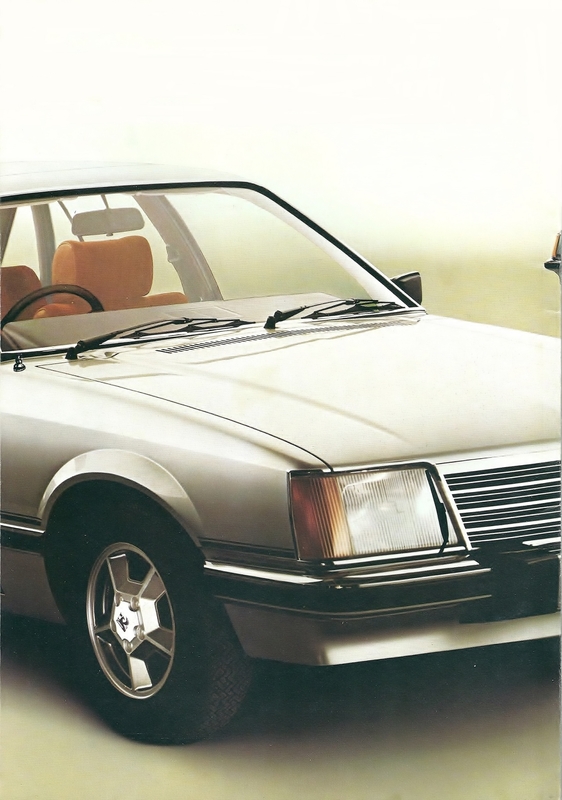 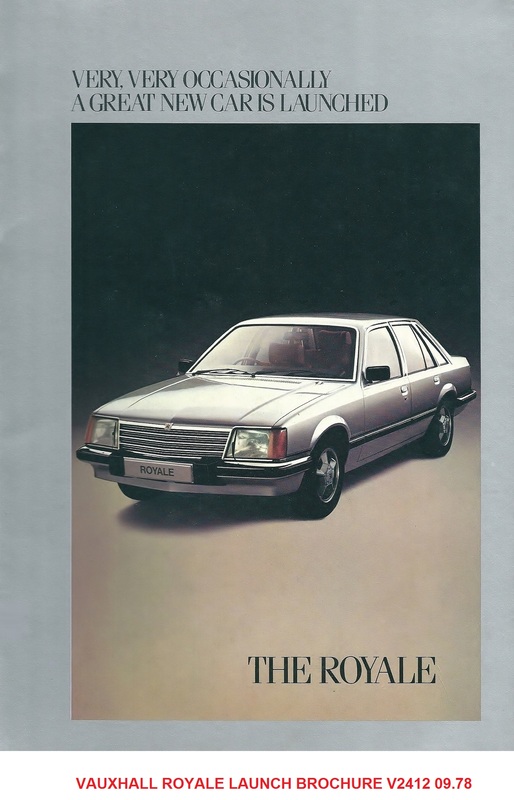 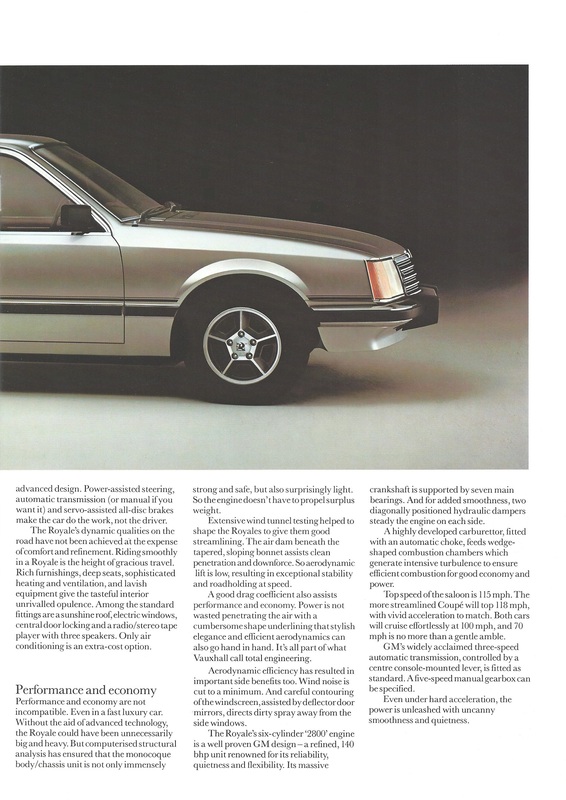 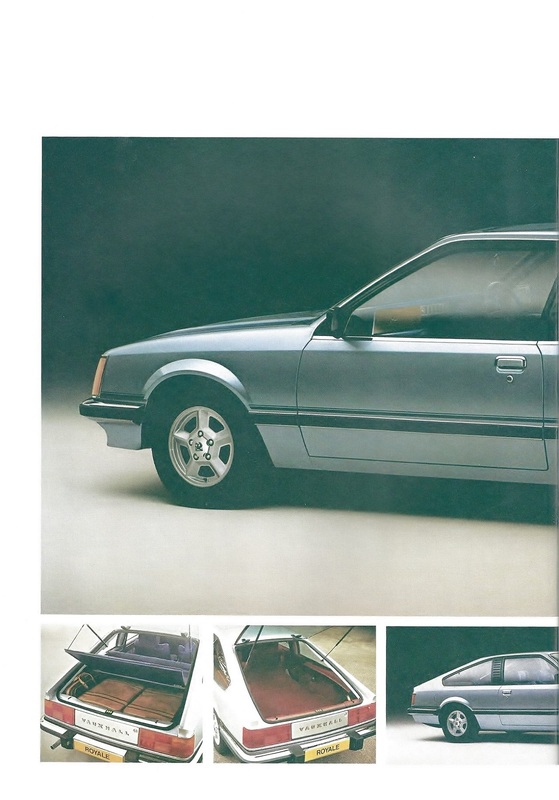 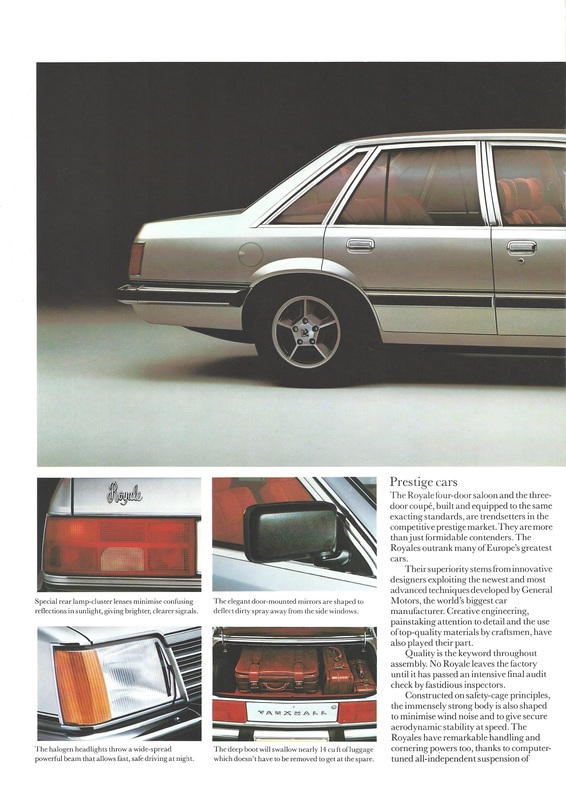 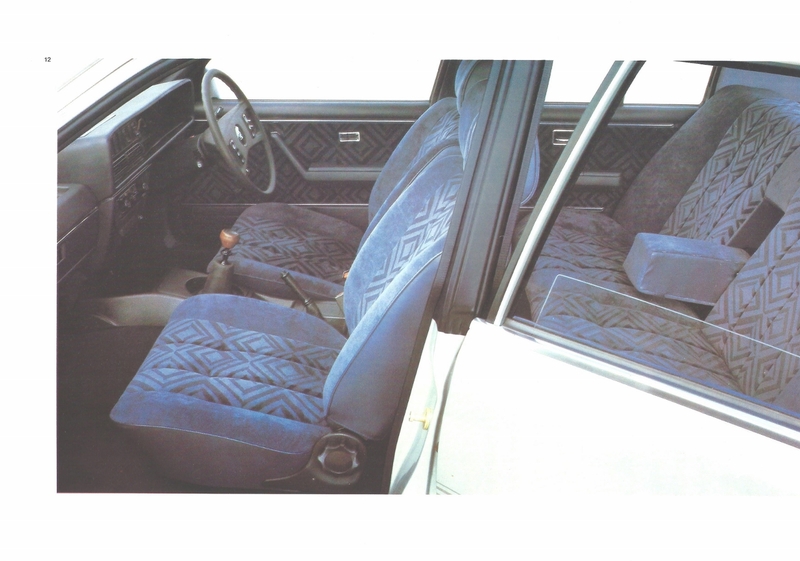 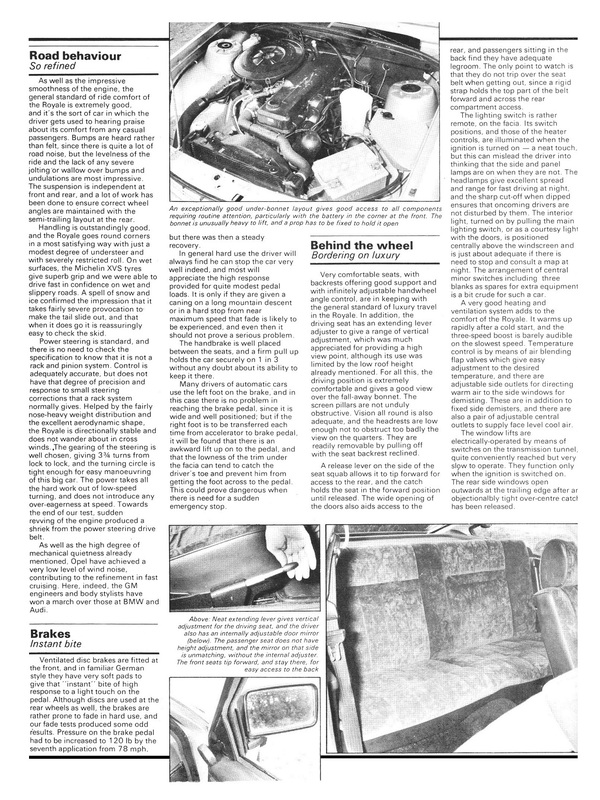 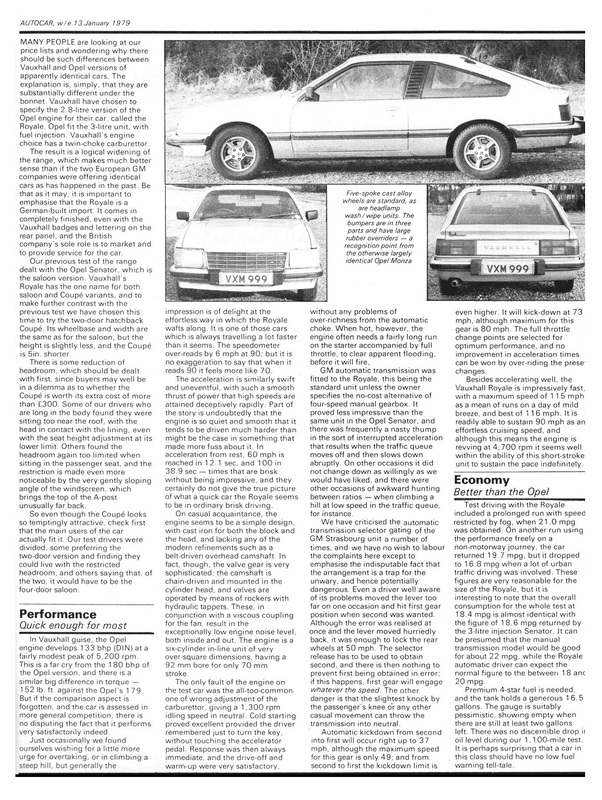 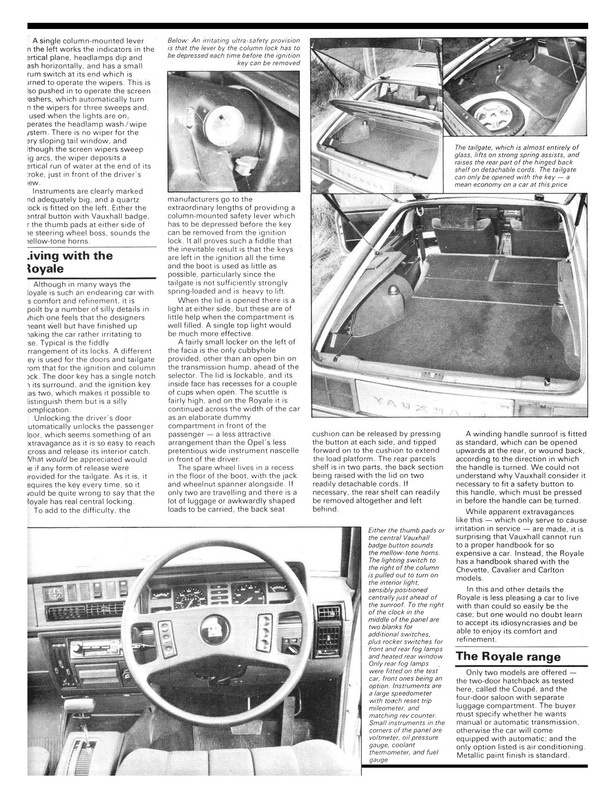 Unfortunately the cost constraints were so restricted on both sides of the Channel that the unique bonnet and front end panel for the Royale were dropped and a straight forward grille change was the only front end change, the grille was also used by Holden for the first VB Commodore in Australia and Daewoo in South Korea for their version which was also called Royale. 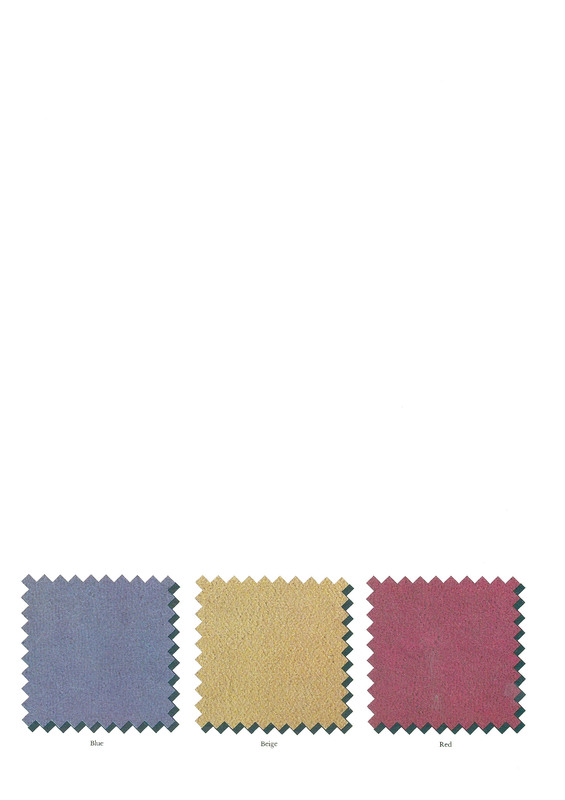 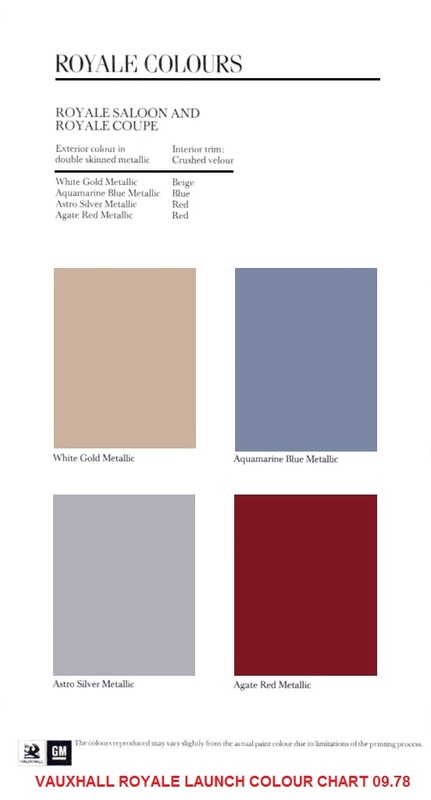 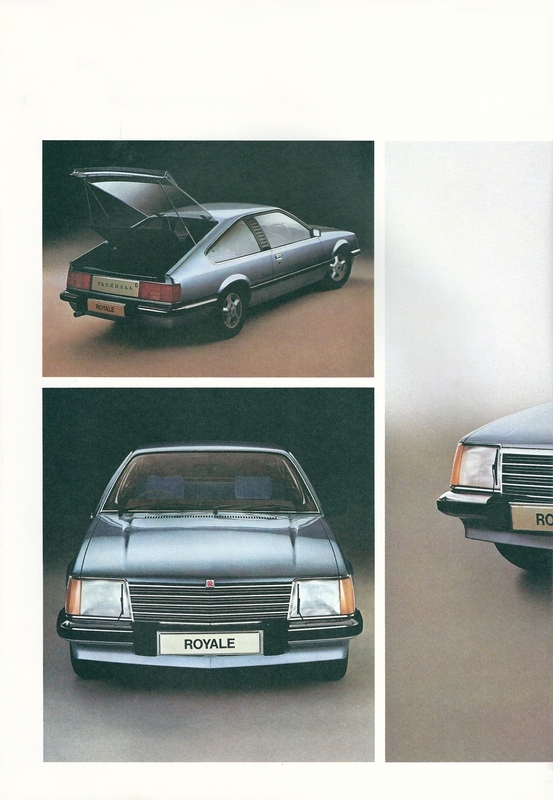 The Viscount name was dropped in favour of Royale because the name had been registered by United Biscuits for their new chocolate mint cream biscuit! 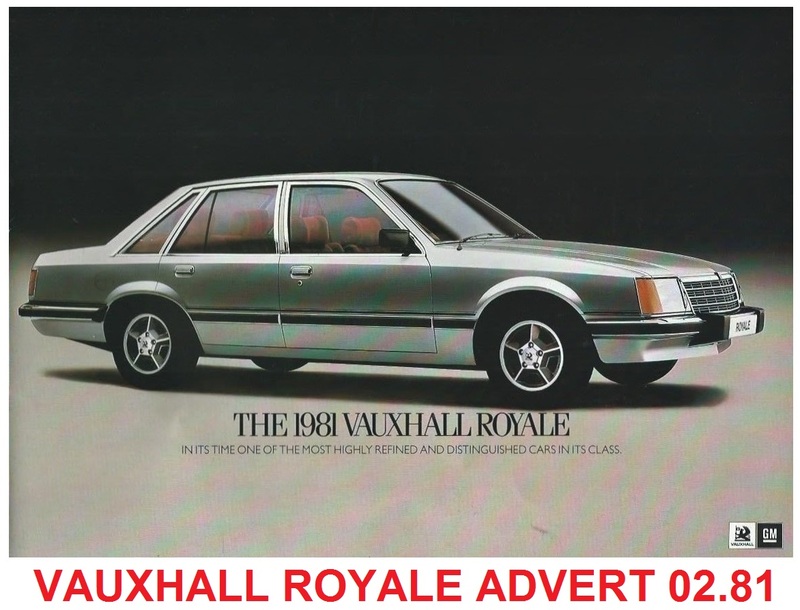 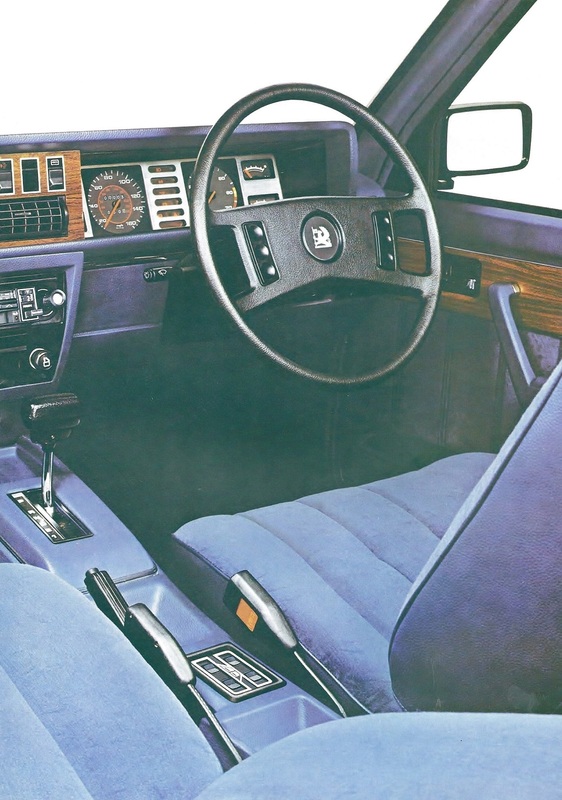 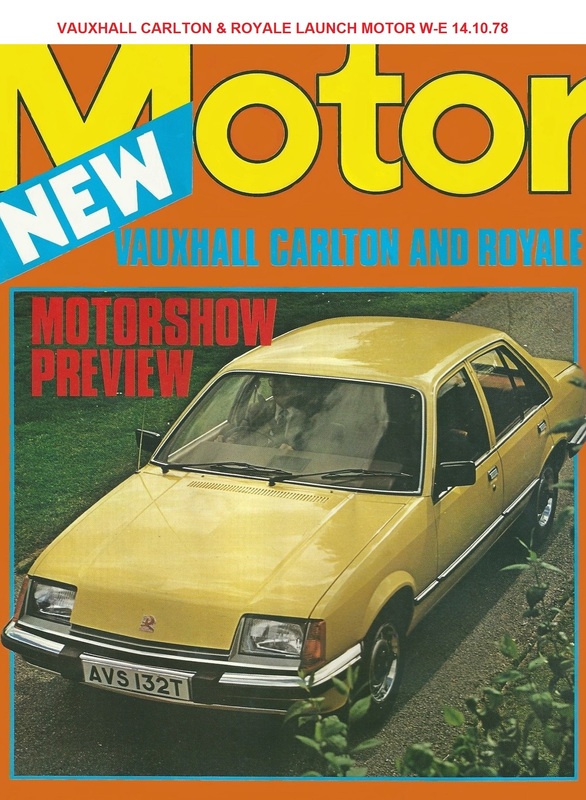 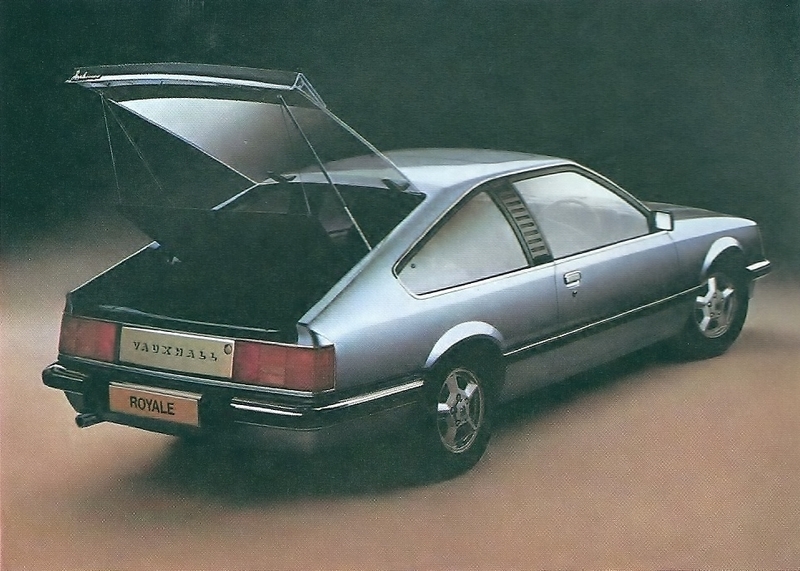 The Vauxhall Royale was first shown publically at the UK Motor Show in October 1978 and went on sale in November. 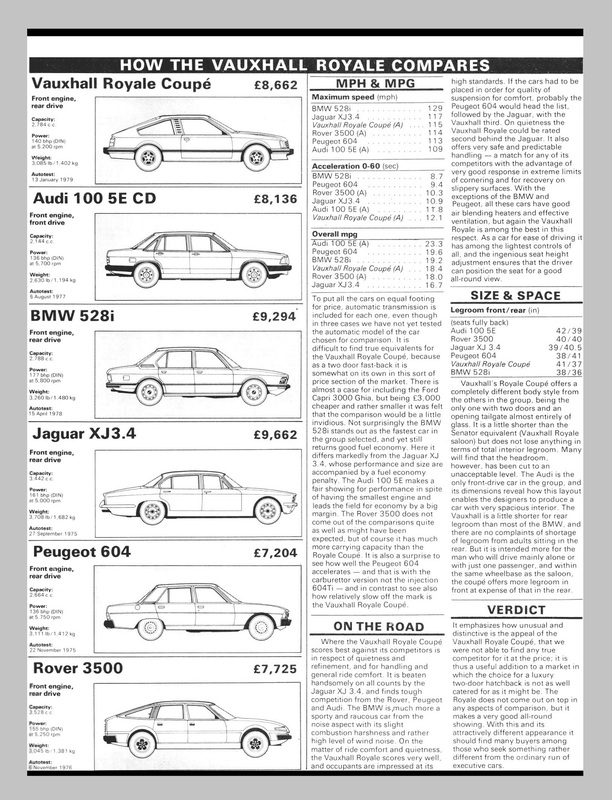 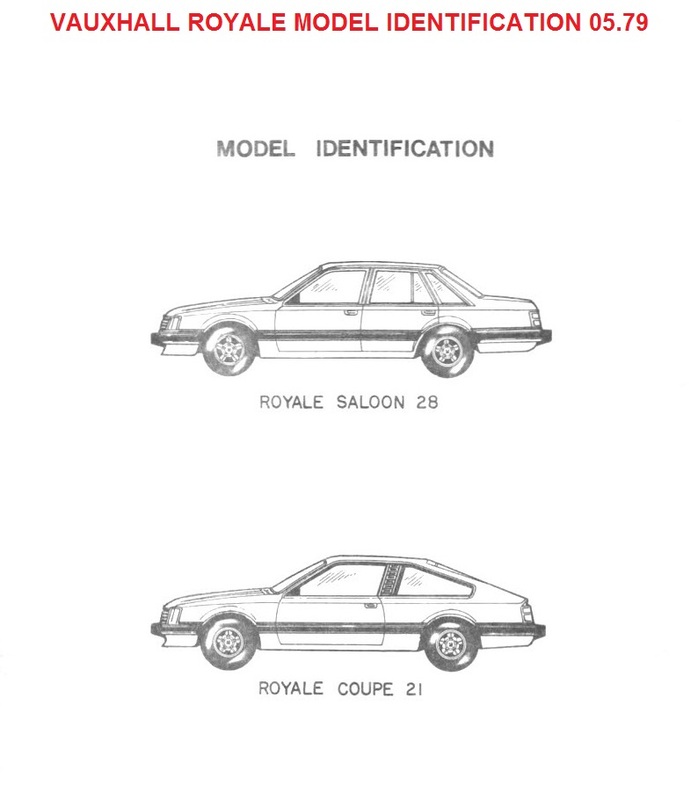 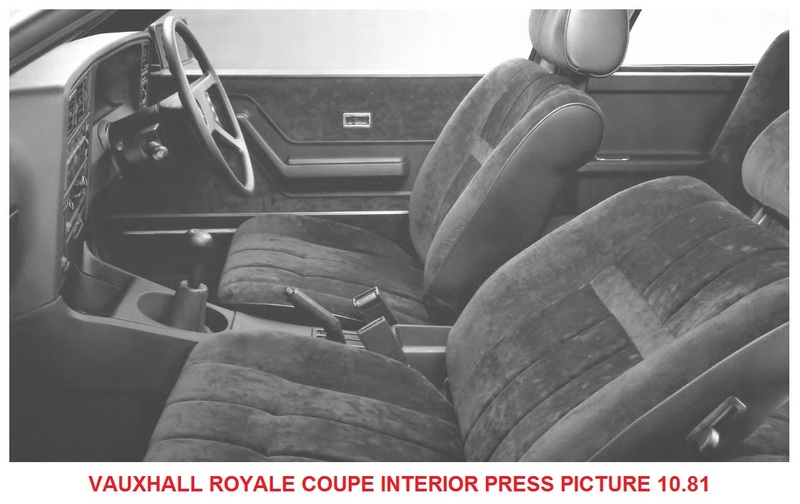 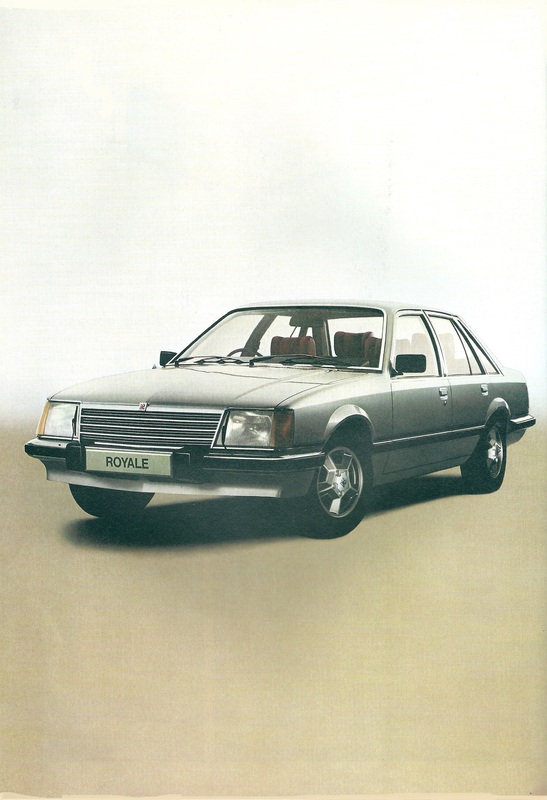 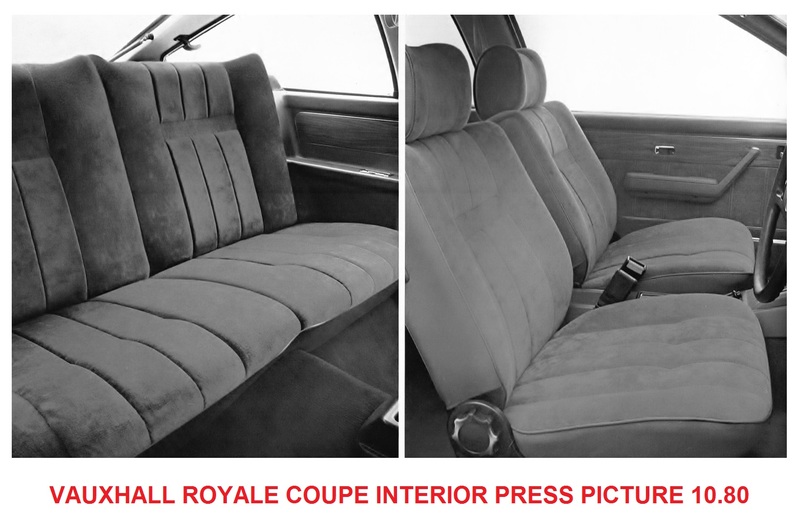 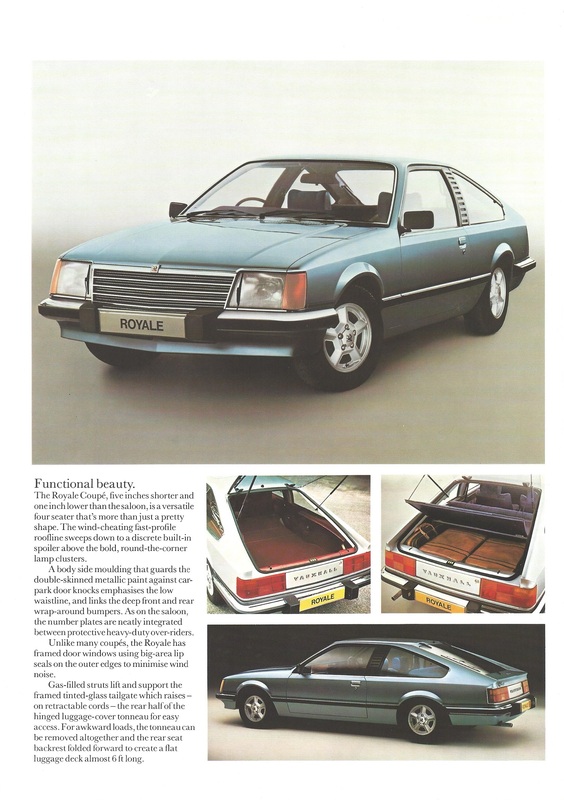 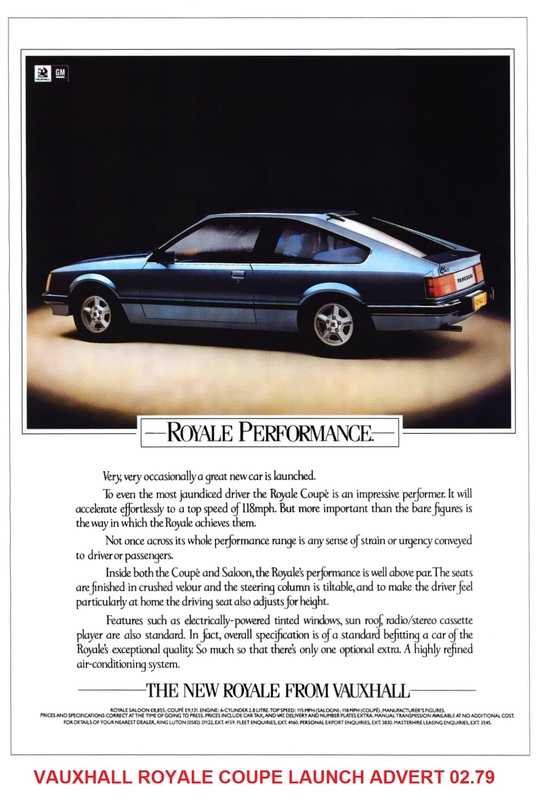 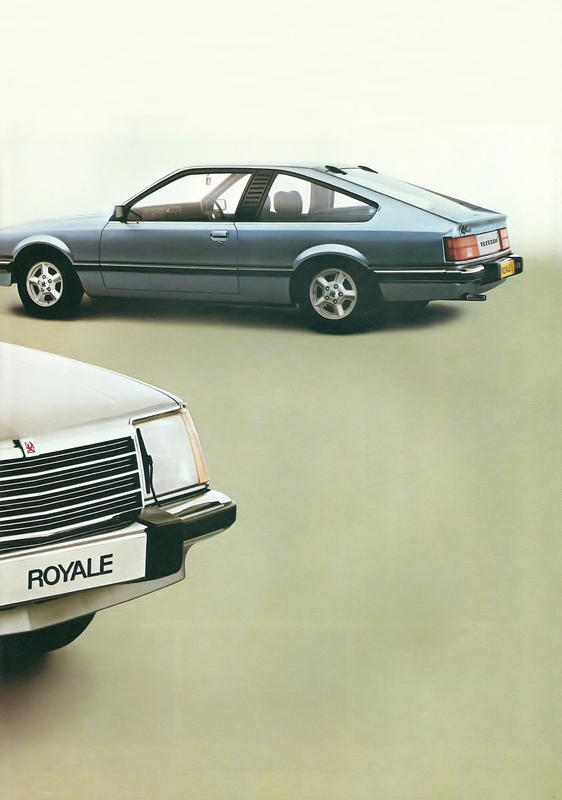 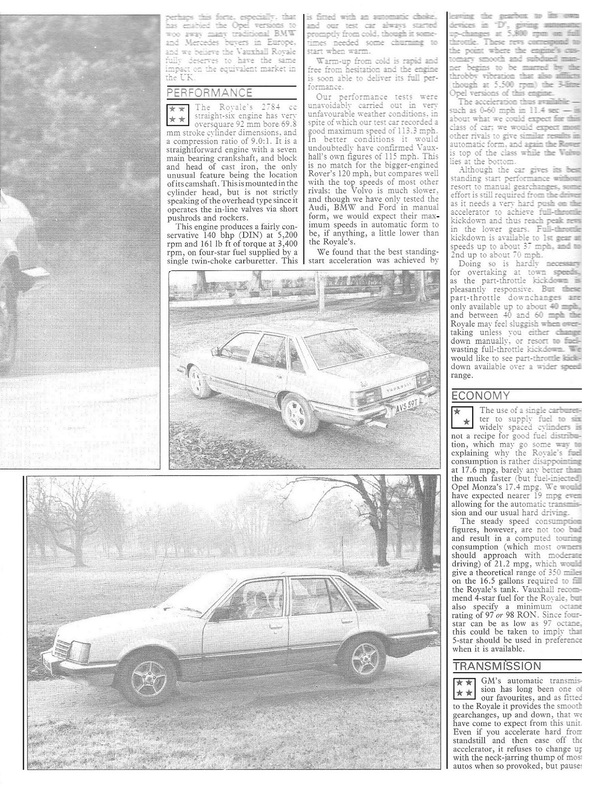 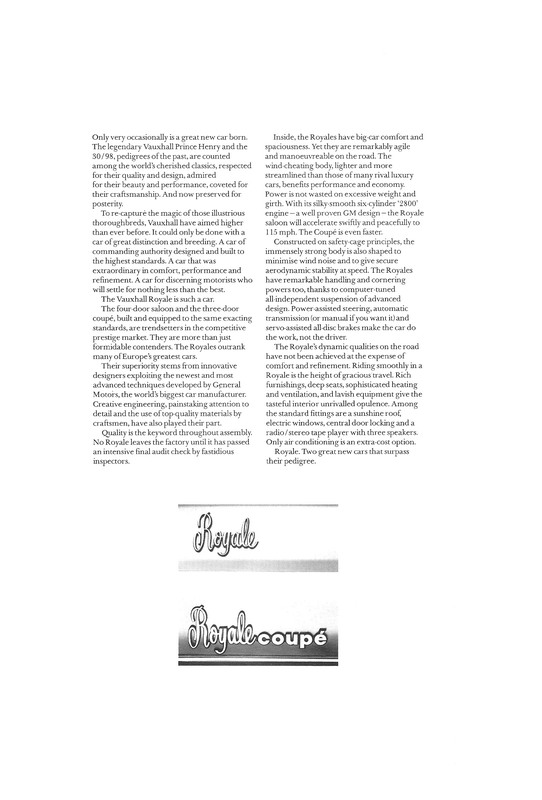 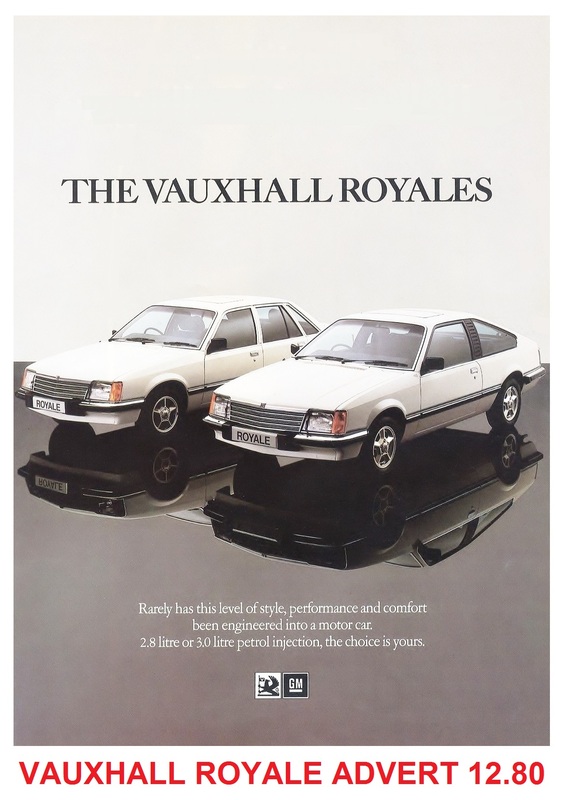 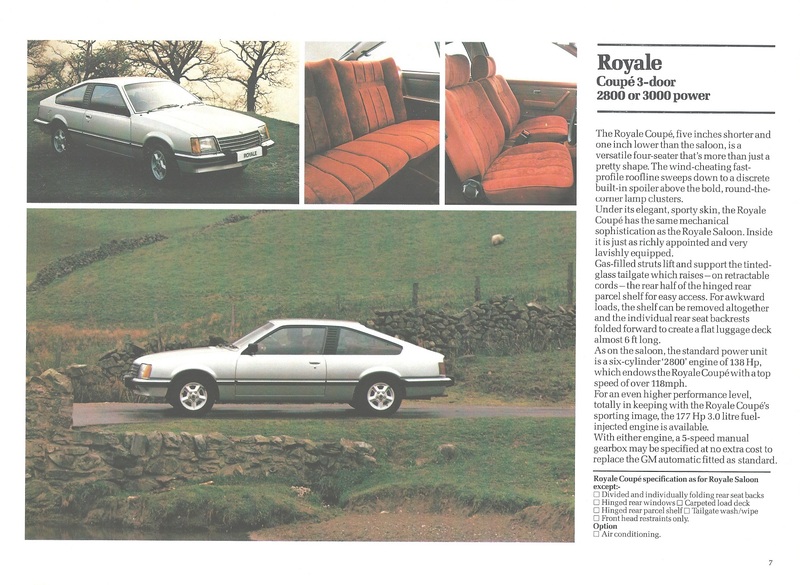 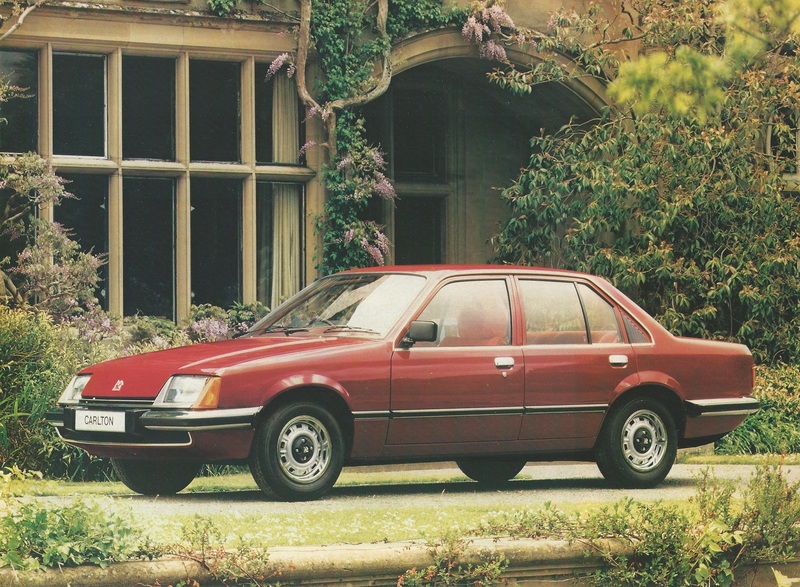 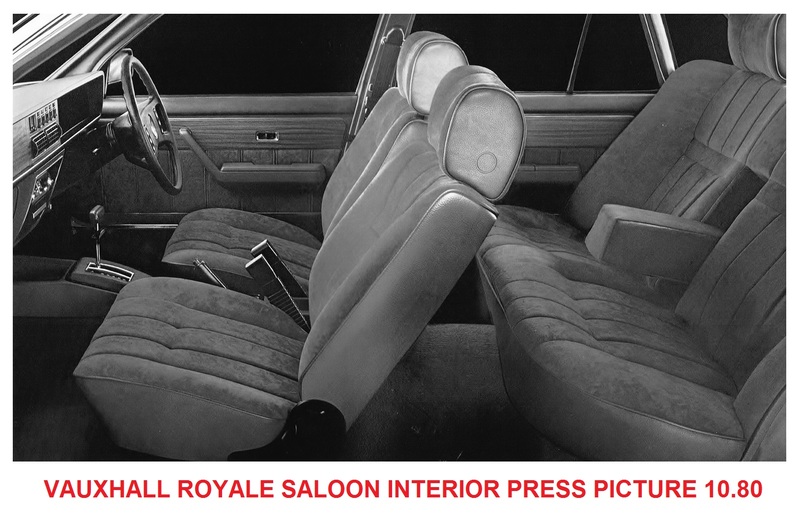 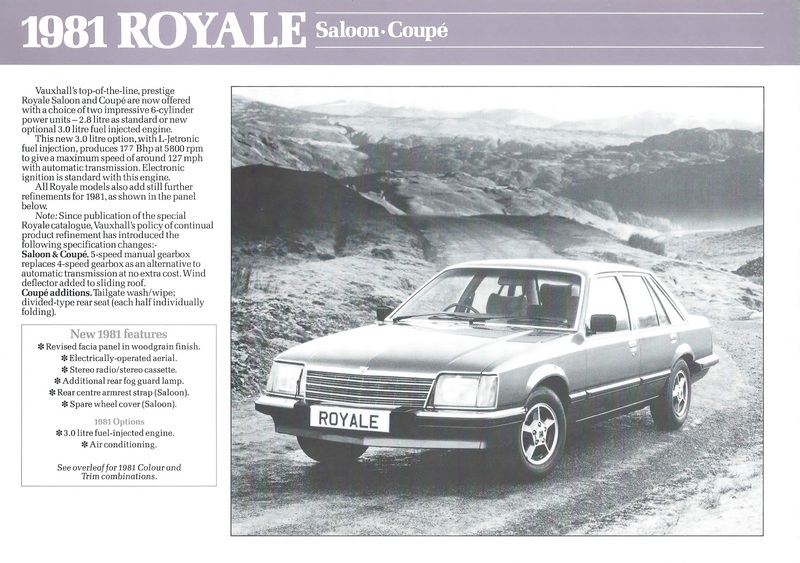 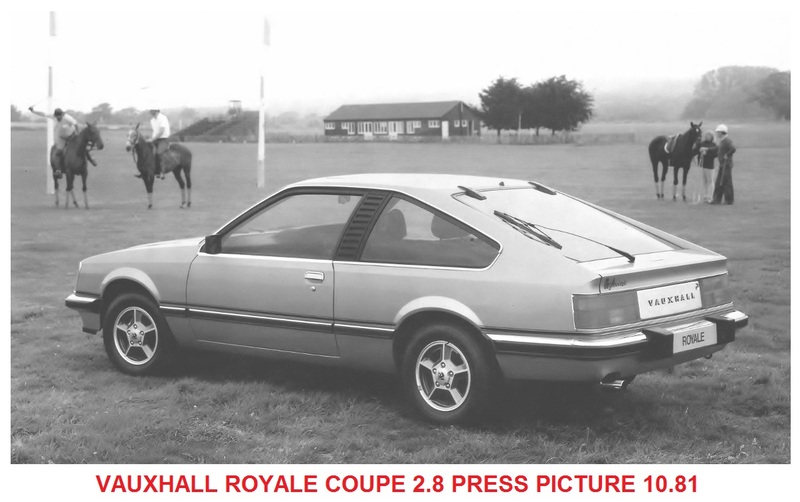 Both Saloon & Coupe were badged as Royale unlike their Opel equivalents. 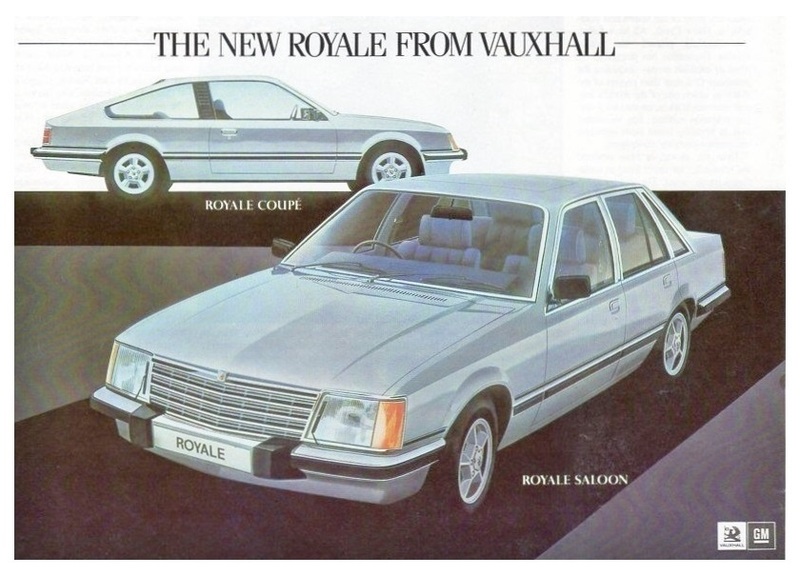 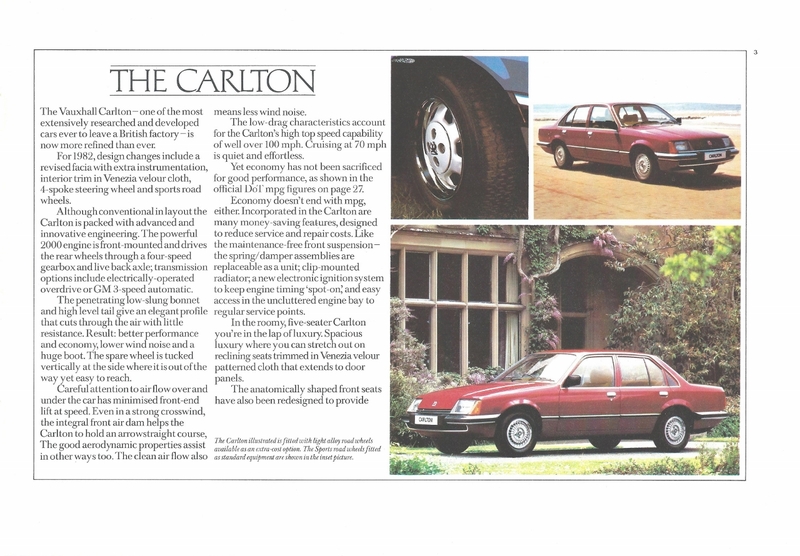 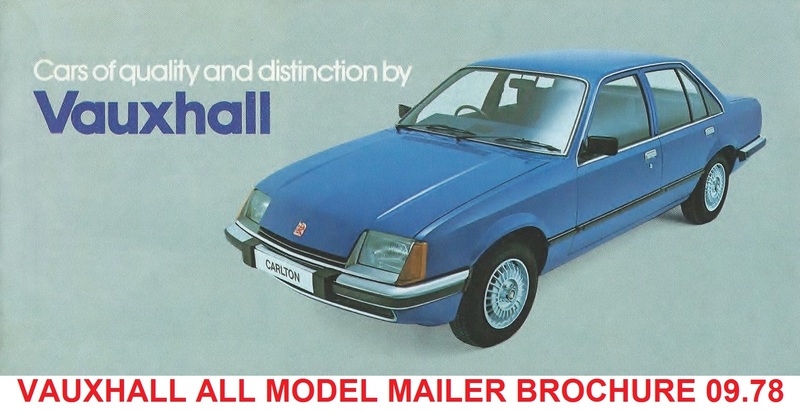 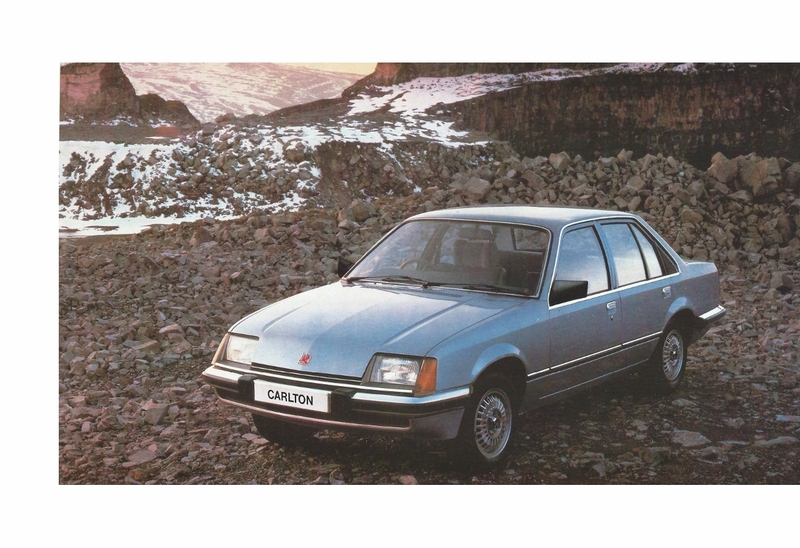 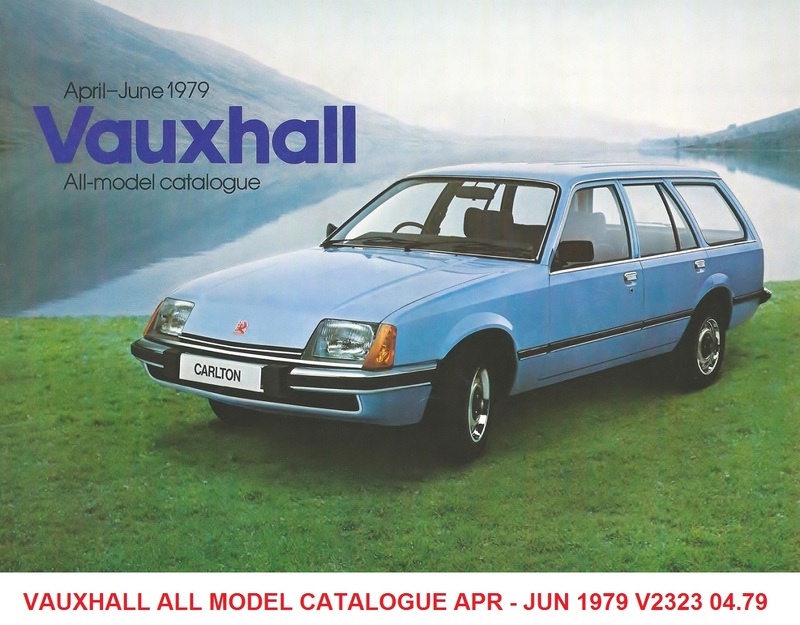 The Carlton launched at the same time was UK built at Luton, however, all Royale models were imported fully built form the Opel plant in Russelsheim. 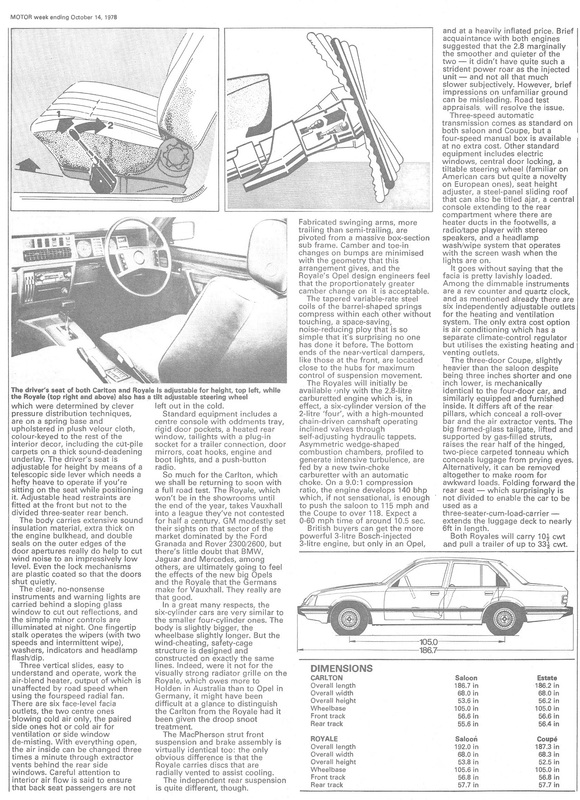 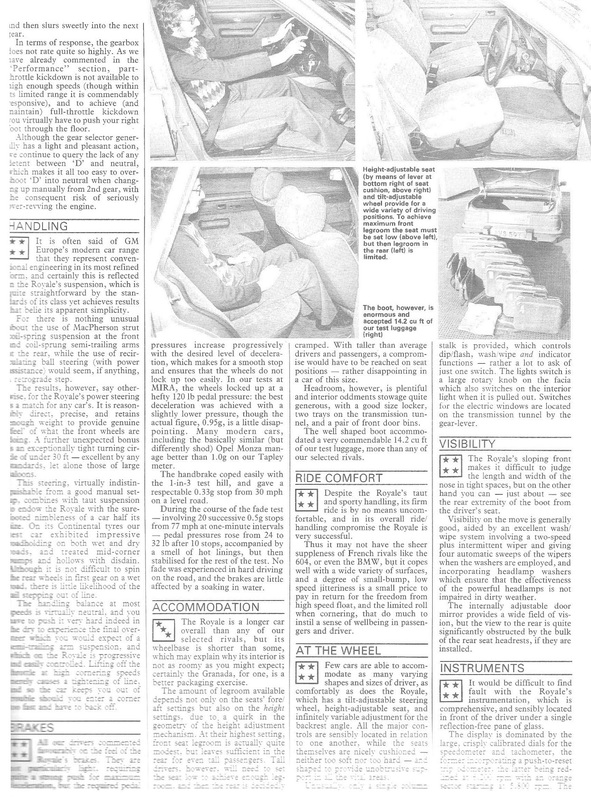 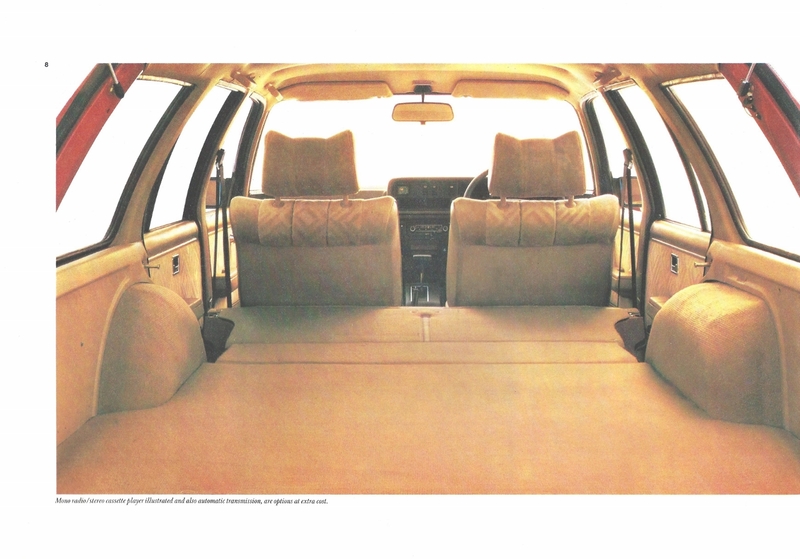 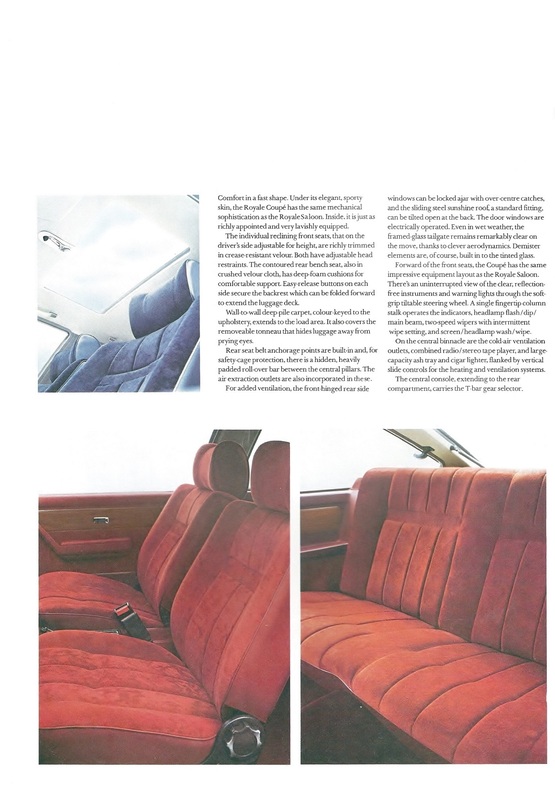 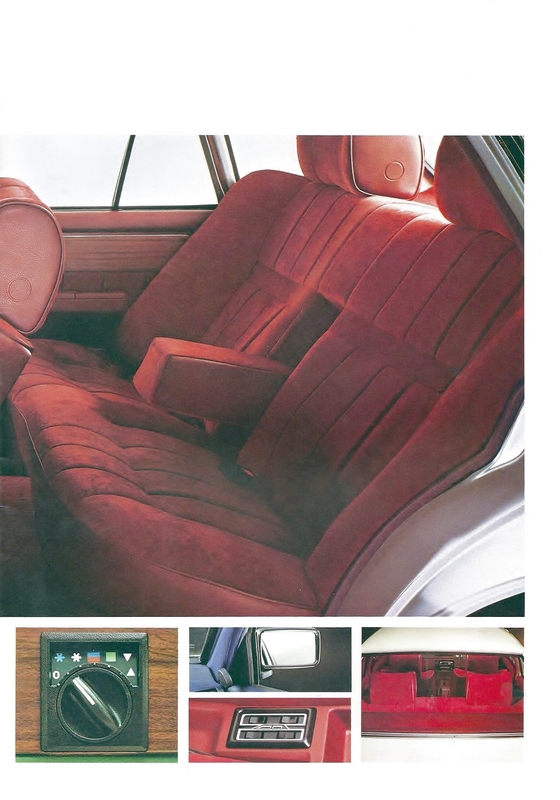 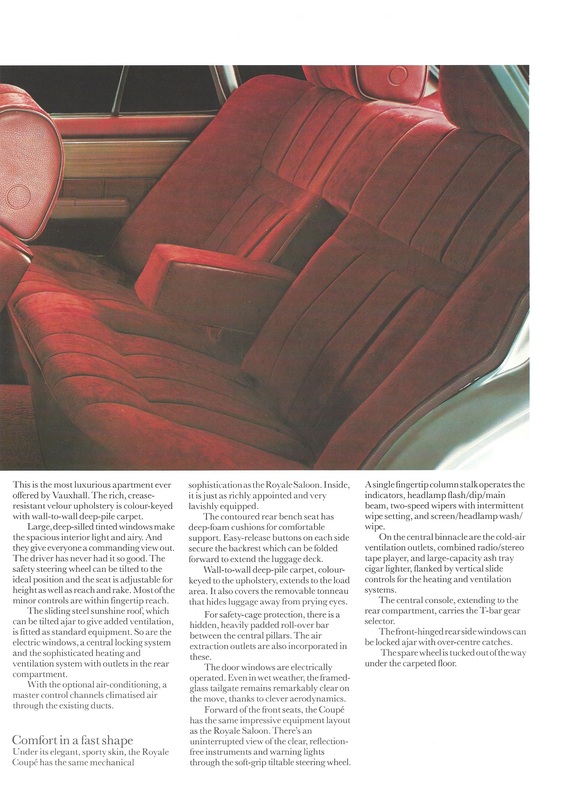 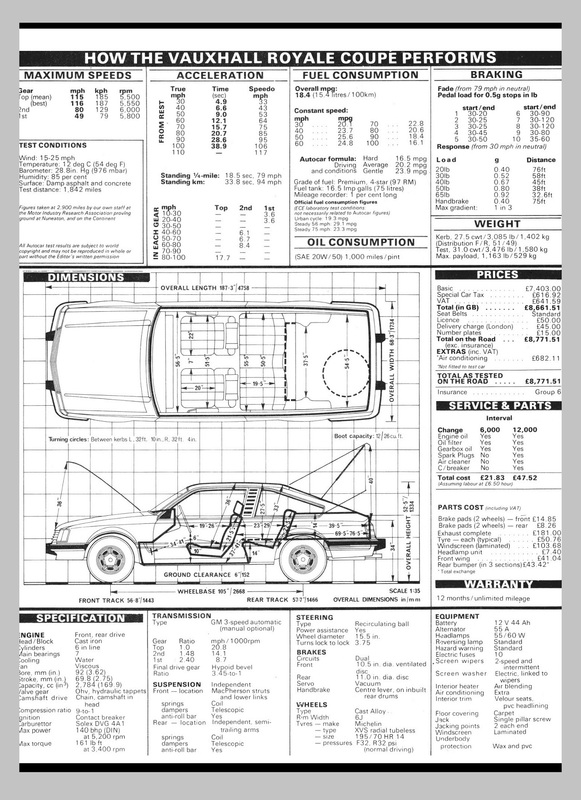 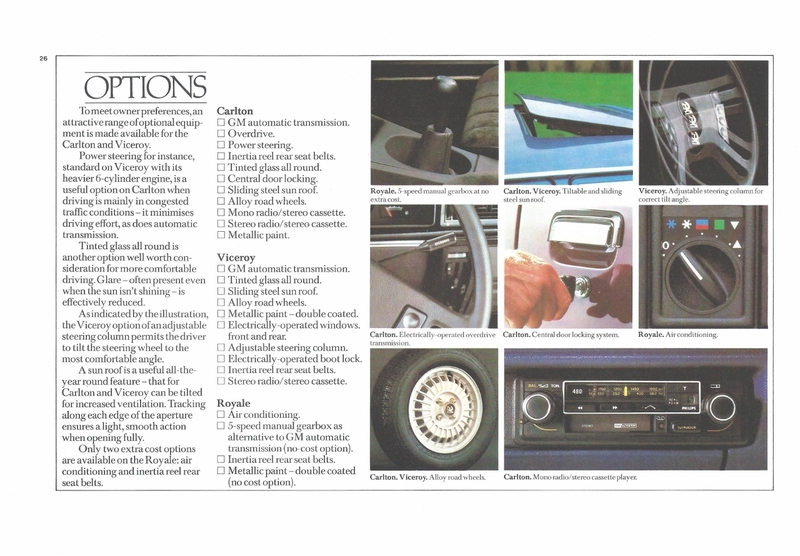 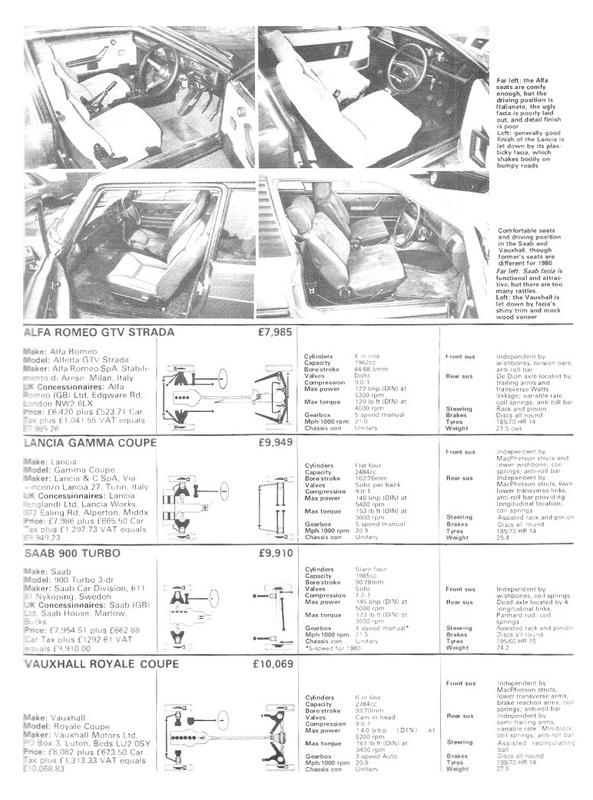 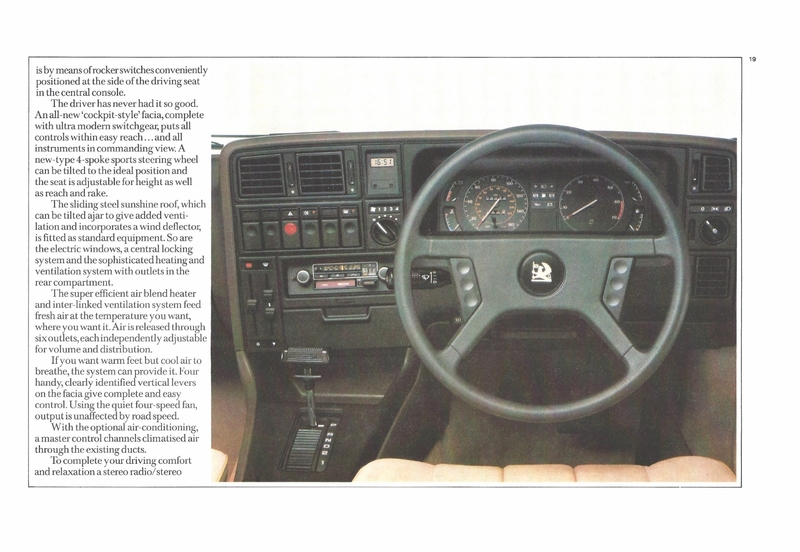 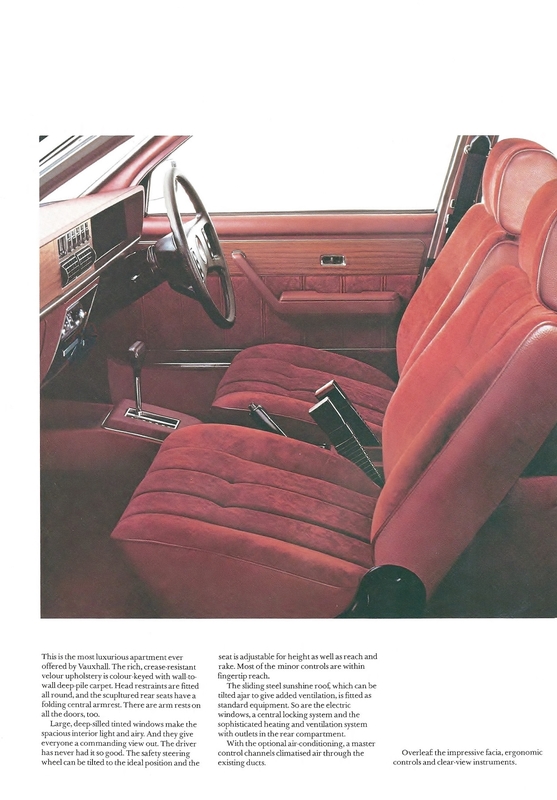 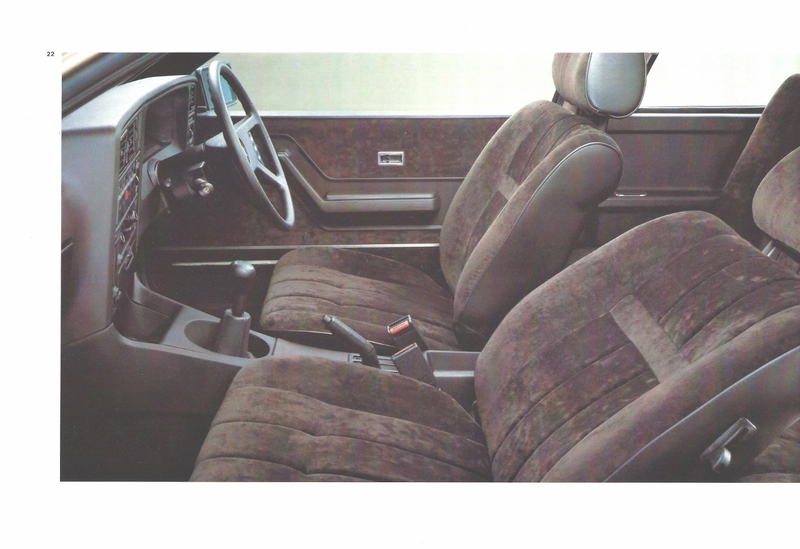 The car was only offered with one trim level and the only extra cost option was air conditioning, a no cost option was a 4 speed manual gearbox instead of the standard 3 speed GM Automatic. 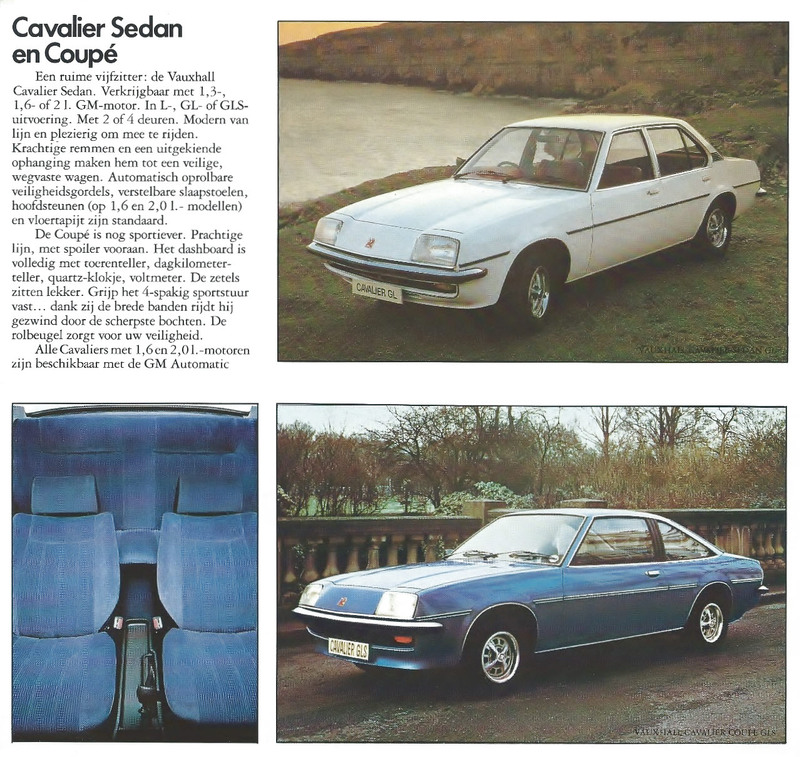 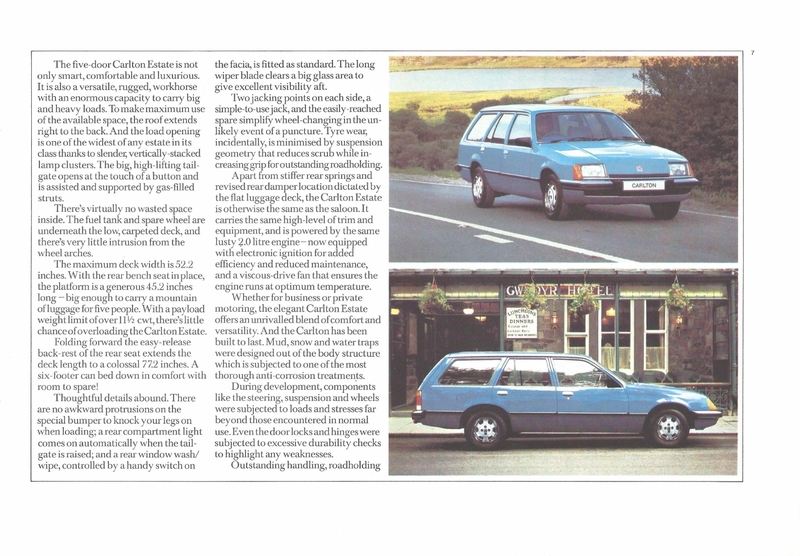 Colour choice was restricted to 4, and only the 2.8S CIH 140bhp engine could be ordered except in Sweden where it was only sold with the 180bhp 3.0E fuel injected unit.